Eight Days and seven nights at an all inclusive resort can definitely lead to over indulgence in all the “included” stuff. Enjoy some great food, alcohol, relax around the pool, get some sleep then repeat! We knew going in that “for our health” we needed to get out and about at least a few times. Our stay at Ocean Riviera Paradise was an awesome vacation and the excursions definitely added to our fun. We planned 3 day trips during our week in Playa Del Carmen, a shopping trip a snorkeling trip to Xel Ha, and a ferry ride to Cozumel. 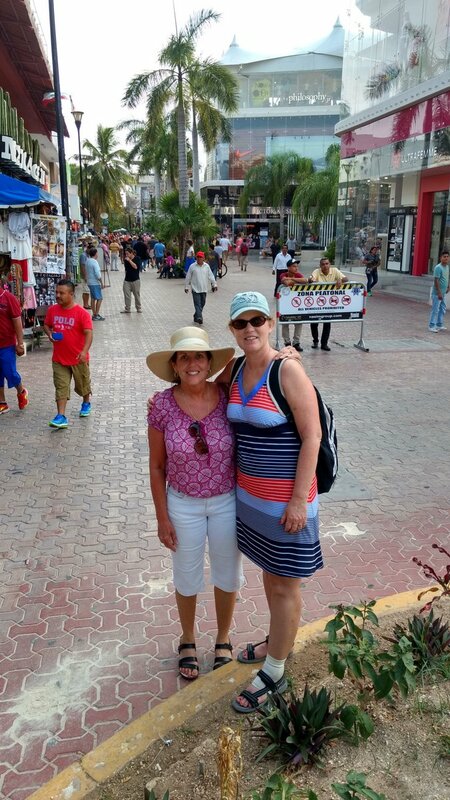 Our first excursion was a shopping trip into Playa Del Carmen’s Fifth Avenue shopping district. The resort arranged our ride to the shopping area, and for the same taxi to pick us up at a prearranged time. This is the place to go to for a vintage Mexican shopping experience. Fifth Avenue is long, walking only street, with shops lining both sides of the street. Never pay the first price, part of the fun is the negotiation. Only negotiate if you are serious about buying though, otherwise, what’s the fun in it that! Do beware as a shopper though. I don’t think there is an intention to rip you off but be sure your expectations are realistic. 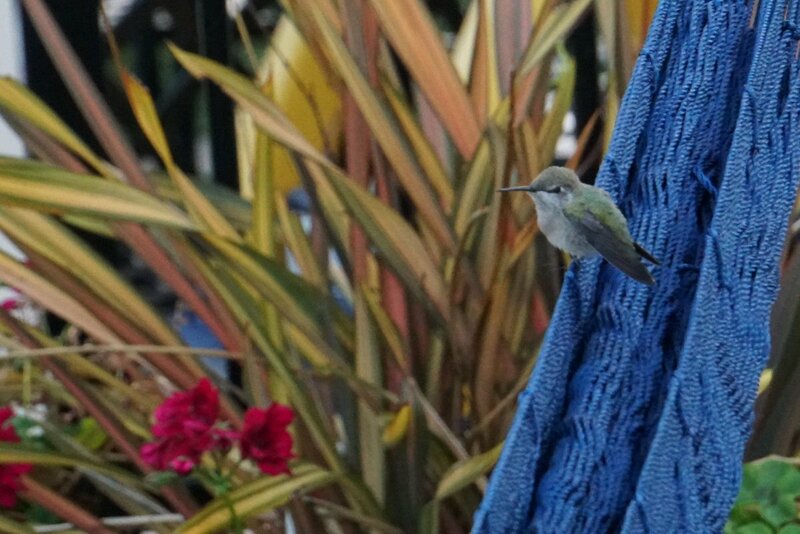 I bought a single hammock while I was there. They also offered a double size hammock, but I thought a single would be fine. My expectation was that it would be like the single hammocks at the resort. 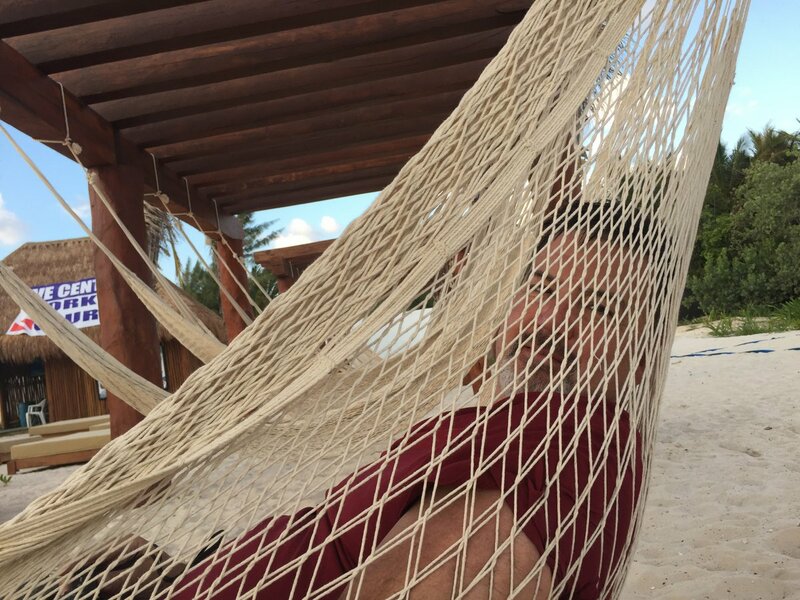 That when I got into the hammock it would envelop me and I could nap with no fear of falling off the hammock. But the reality was the single hammock was much narrower. 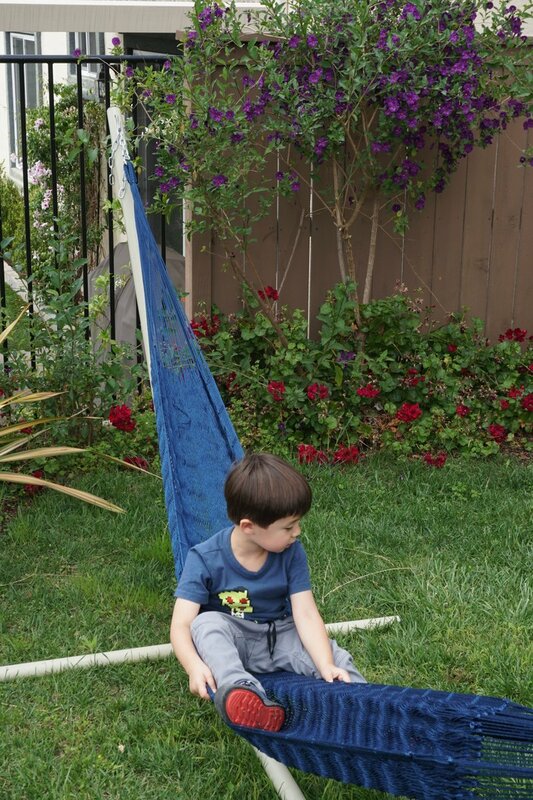 To be fair, the hammock may get better if I stretch it out in the middle, but out of the bag it was only about 16 inches across with weight on it. We started walking around 40th Street, which is the beginning of the pedestrian only part of 5th Avenue. About halfway to our turnaround point was a small traffic circle in the middle of a wider boulevard (Constitution Ave). We stopped there for a couple of pictures. I like this one of Jenny and Chris. Although we were rarely together during the walk down Fifth Avenue, at a certain point we all got thirsty and a bit hungry at the same time. Although it felt to me that I was walking toward the beach the whole time, we were actually walking parallel about a block from the beach. We walked over that block and found a nice restaurant patio/deck on the beach (La Tarraya) and had a couple of drinks and some appetizers. I don’t remember if it was before we had a couple of drinks or after, but my brother Tracy passed by a dive shop and just could not resist a prop on their patio. 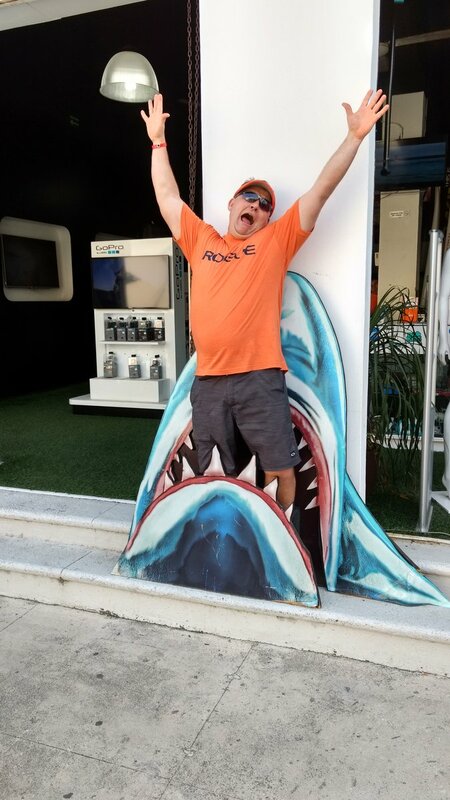 Not an Academy Award performance, but fairly convincing for only being in the jaws of a cut out shark! By the time we finished our refreshments it was close to the halfway point to our pickup time so we slowly headed back toward our starting point. We got a little more serious about shopping on the way back, but still got back to our pickup point about 5 minutes early. The taxi was right on time and we headed back to the resort for dinner, a couple of drinks, and a good night’s sleep. The following day we were back to enjoying the sand, the ocean, and the “all-inclusive” indulgences at Ocean Riviera Paradise. One useful purchase on 5th Avenue were 2 very large insulated cups. Those came in very handy as we lay in the shade by the beach. They held just enough margarita or pina colada to last until the next waiter showed up! I’ll follow up soon with another post or two on the other excursions we took while in Playa Del Carmen. 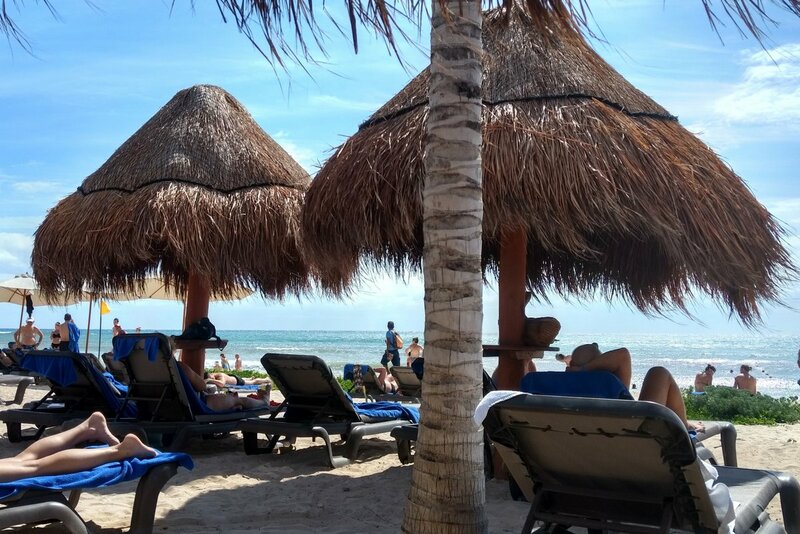 To see all the Playa Del Carmen Post, and all of our tropical paradise trips, see my list of posts for Tropical Vacation Posts. 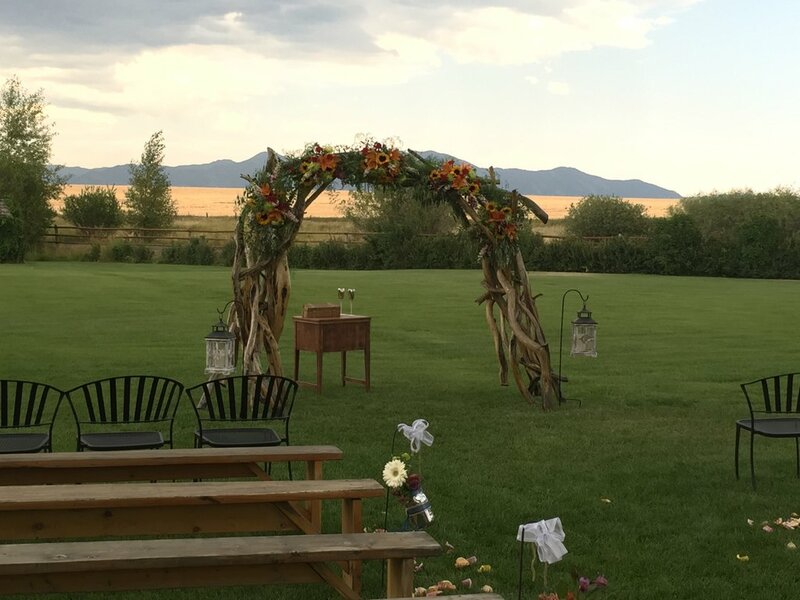 We were lucky enough to be invited to the wedding of the son of close friends in Bozeman Montana at the beginning of August 2016. Unfortunately for us we already had floor tickets to Adele in Los Angeles the day before the wedding. These were tough tickets to get and even tougher tickets to sell or give away. For better seats Adele had set a rule to reduce/prevent scalping that the person who ordered the tickets had to present a credit card to get into the venue. There were no tickets to sell. We wanted to go to the wedding so we checked for flights from the LA area the morning of the wedding. 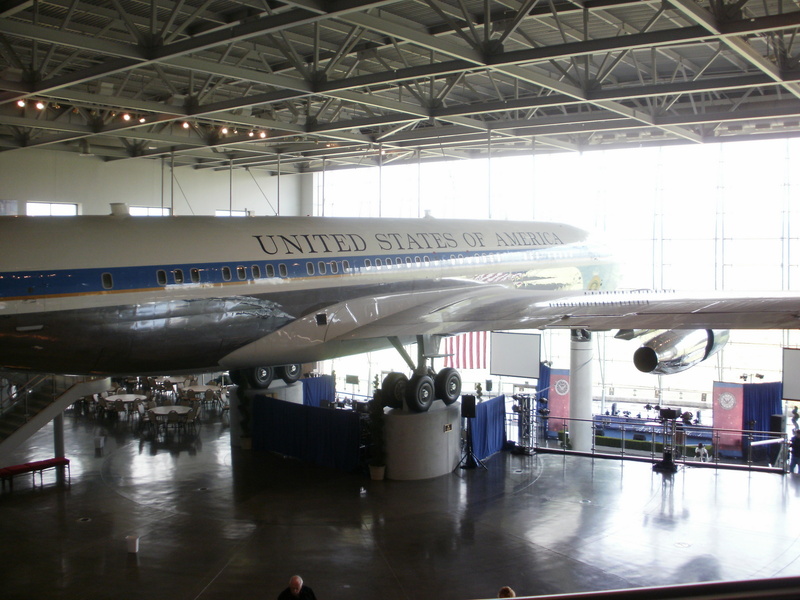 There were very reasonably priced flights from John Wayne airport to Bozeman early Saturday morning, so we decided to go to the concert, stay in LA, and drive to the airport early that morning. 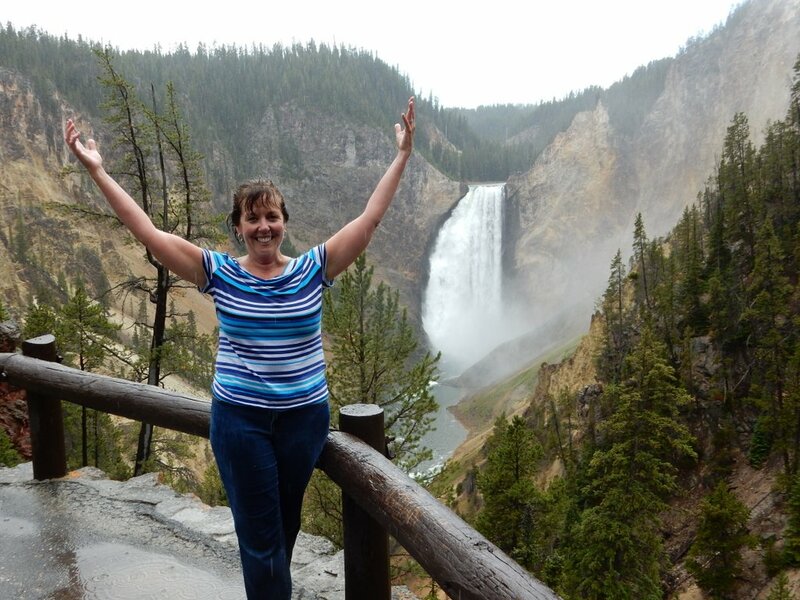 We also decided to add-on a visit to Yellowstone and Grand Teton National park to the trip. It would be a fast 3 day visit, but we would pack a lot of stuff into those 3 days. The Adele concert was awesome and our hotel was walking distance from Staples Center, but we still got to bed fairly late and had to get up at 4 am to catch our flight. We got into Bozeman early, but by the time we got our rental car we had just enough time to go to our hotel, check-in, change and head to the wedding. The wedding venue was awesome, but there were dark clouds approaching. We had a great time at the wedding, but started to feel the long day way too soon. We hung in there, but eventually had to head back to the room and catch up on our sleep. The next day everyone else was heading out-of-town early, so we got up fairly early, had breakfast at a terrific French coffee shop, then heading toward Yellowstone. 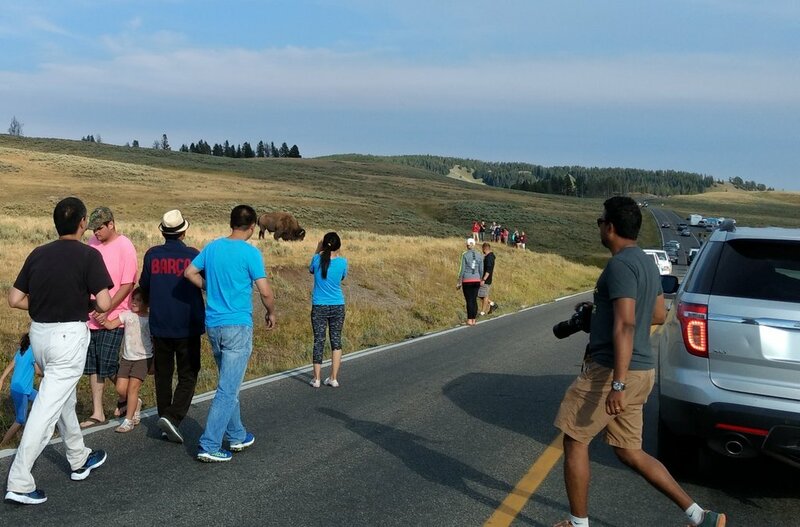 Originally we had planned to go in the north entry into Yellowstone as it is closest to Bozeman, but later decided to go in the west entrance and leave out of the north entrance on the final day. 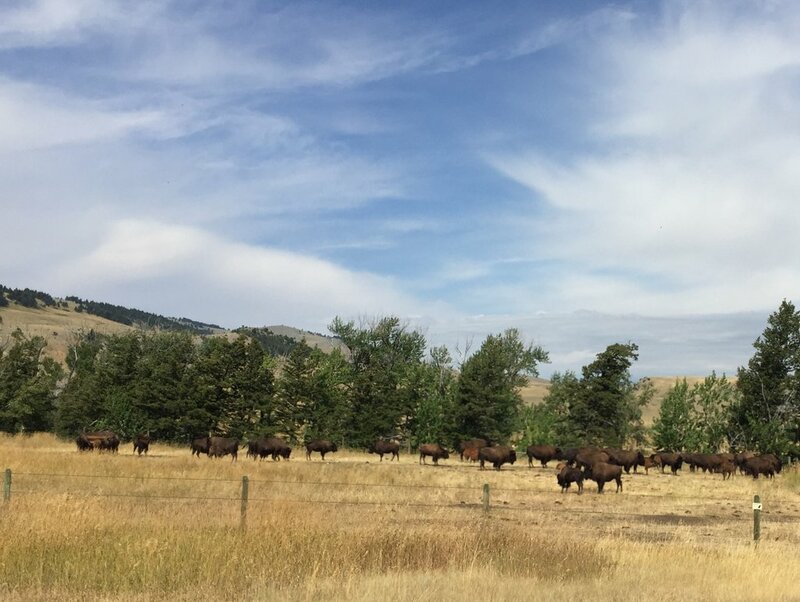 and buffalo along the road. 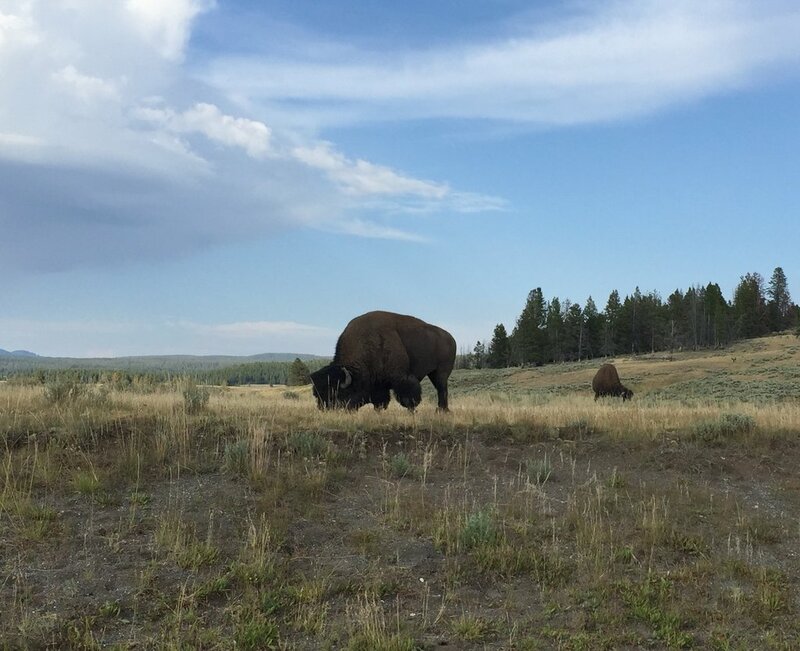 I believe the buffalo was a commercial herd, but still cool. We only stopped briefly in West Yellowstone, but it looked kind of interesting for a future visit. Our first destination in the park was Canyon Village. 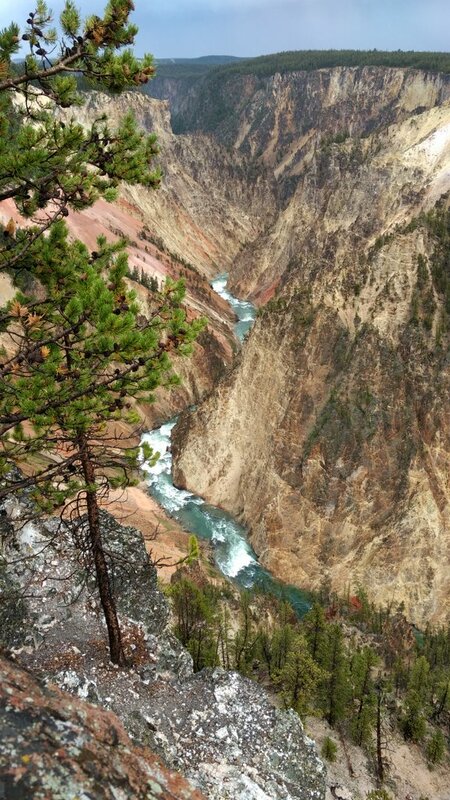 Both Jenny or I have been to Yellowstone before, but neither of us had visited the Grand Canyon of the Yellowstone River. 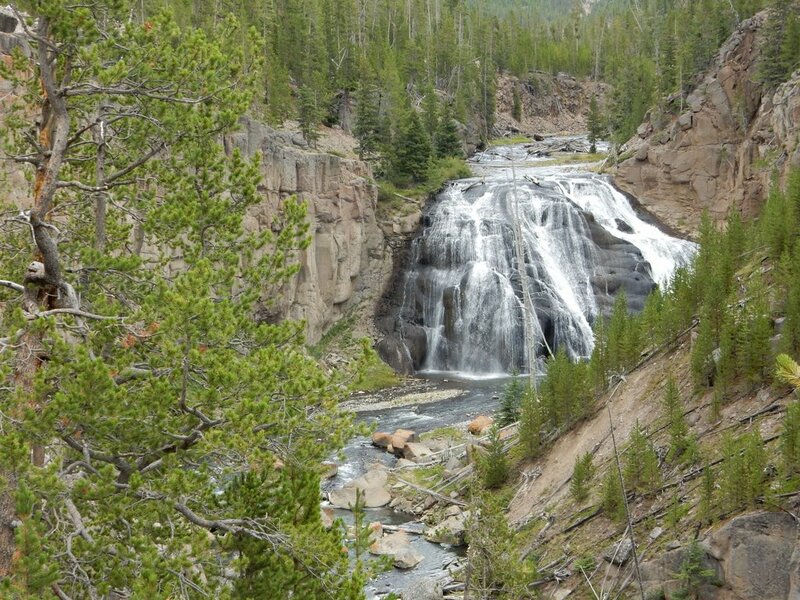 We did end up having one unscheduled stop along our route though, Gibbon Falls. 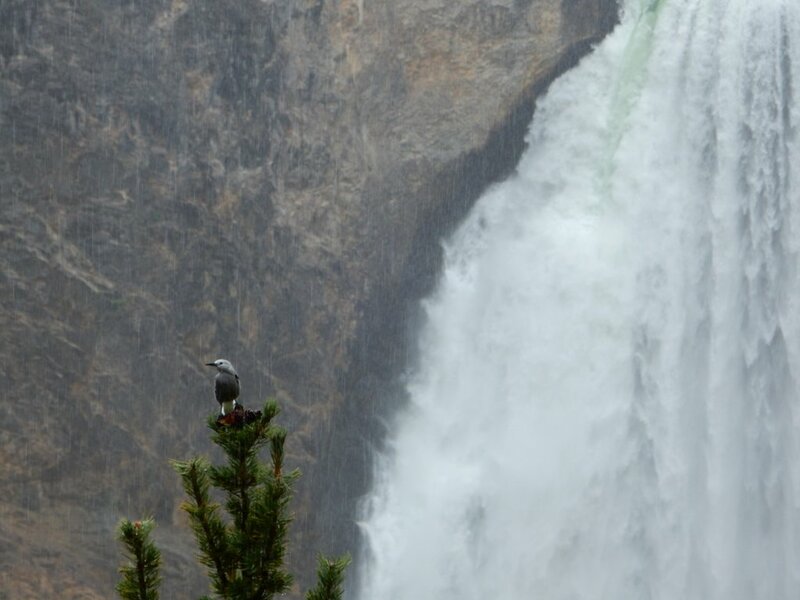 to get a better view of the falls. The view actually changes quite a bit as you walk along the path to the lower viewpoint. At first there view opens up so you can see the walls on both sides of the falls. Then it opens up even more and there are trees in the view also. 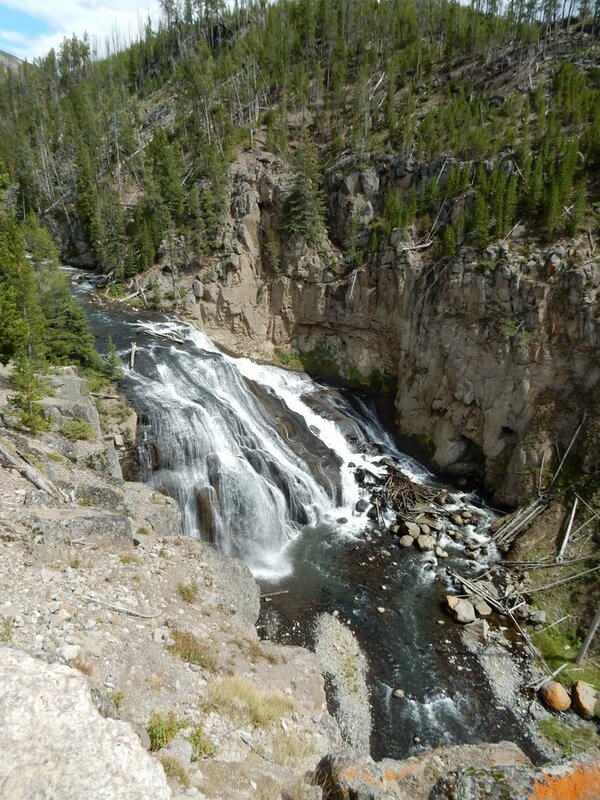 We enjoyed the break from the car and the short walk, but then it was back on the road to the Canyon area of Yellowstone. 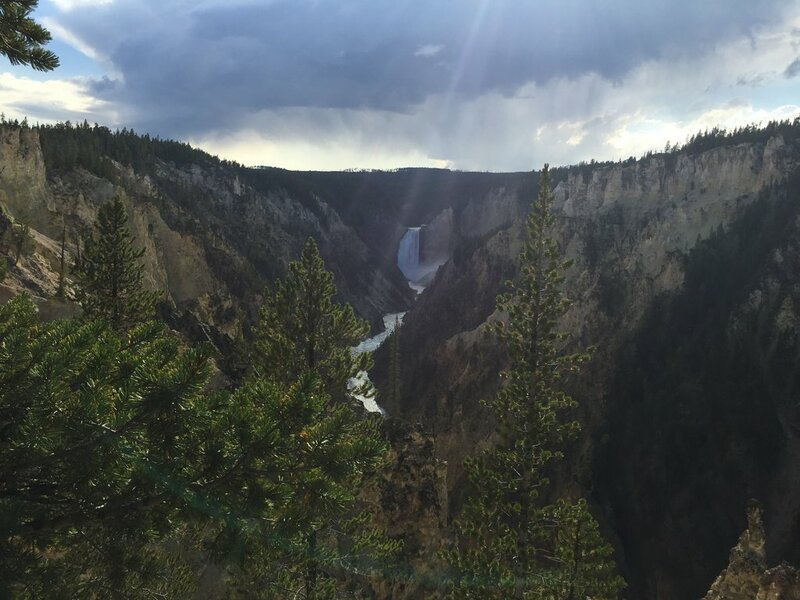 The one advantage of the Grand Canyon of Yellowstone over the Grand Canyon, is the much shorter drive from the North Rim to the South Rim. 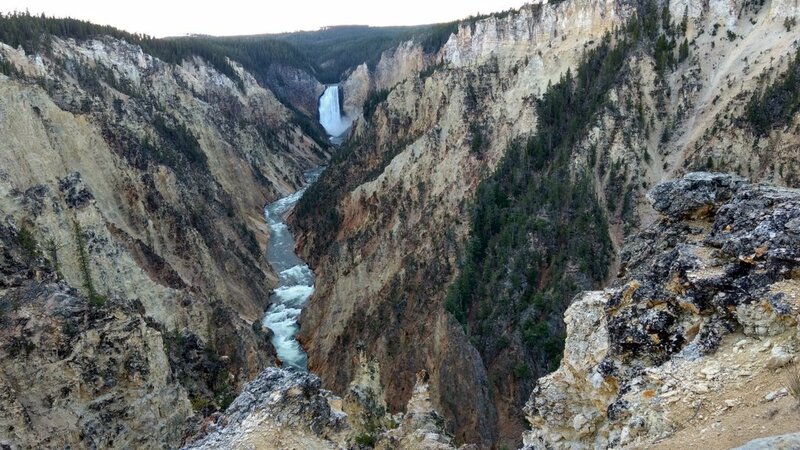 We were able to see the canyon and falls from most of the view points in just a few hours. We did three short hikes during this time. 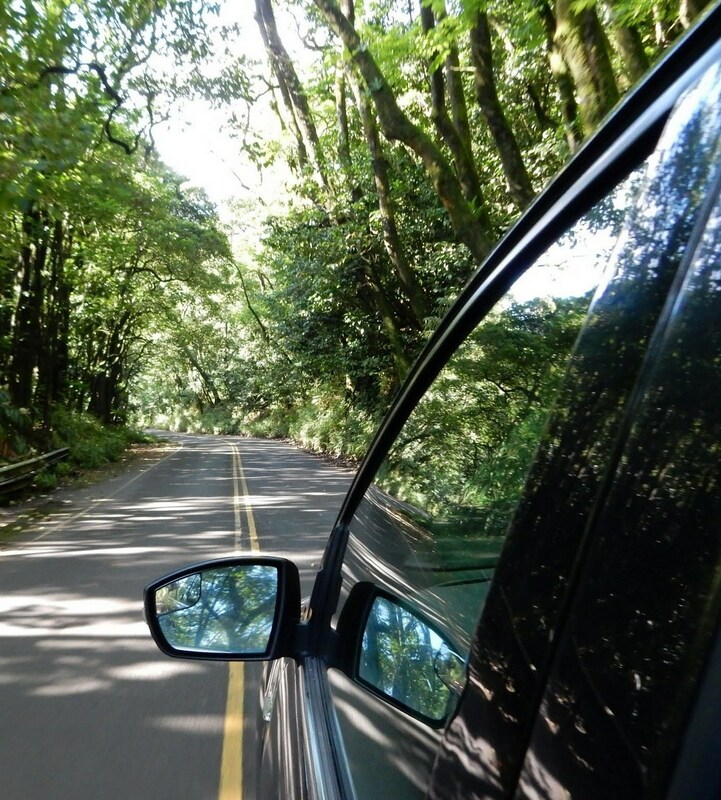 We started with a drive along North Rim Drive. I would actually recommend going to the South Rim first as the North Rim Drive is a one way that takes you back the way you came for several miles. It just makes more sense to do it last. 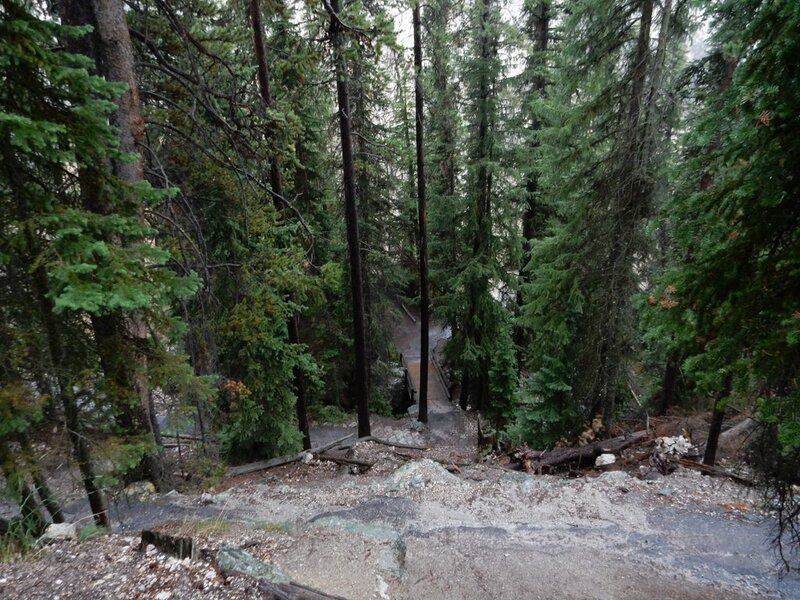 The first stop on North Rim Drive is a trail to the Brink of the Lower Falls. The weather was threatening rain, but of course we had forgotten to pack ponchos. We decided a little water would not hurt and started down the trail. The trail is less than a half mile, but descends about 600 feet. There are switchbacks, but it is still pretty steep. 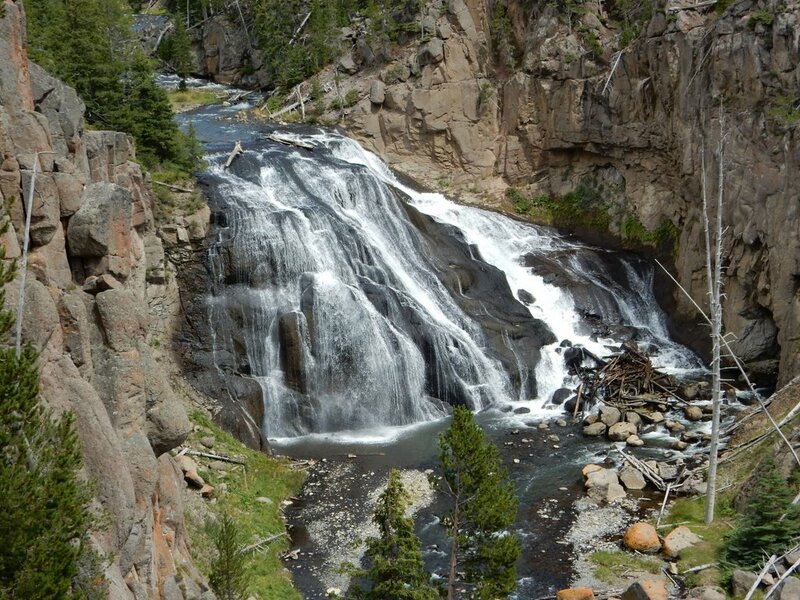 If you look up on the way down, you get a pretty good view of the Upper Falls less than a mile up the Yellowstone River. The rain was threatening and we could hear thunder in the distance so we knew our visit would be a fairly short one. The falls are impressive. 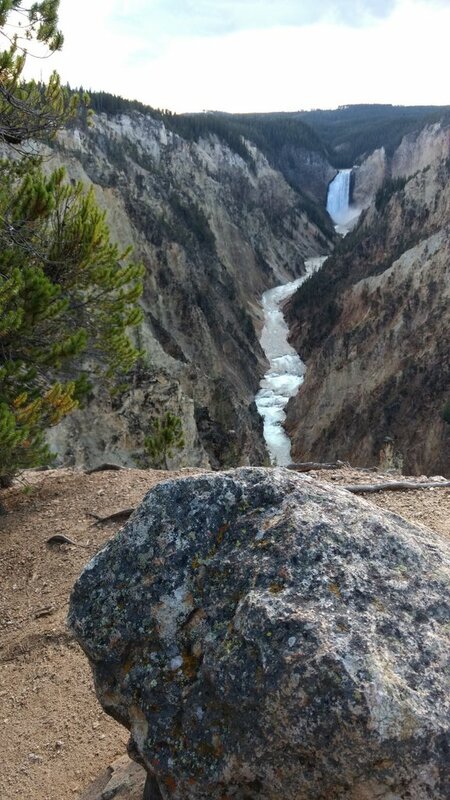 We’ve been to Yosemite several times, and the waterfalls are impressive, but the lower falls at the Yellowstone River’s Grand Canyon are right there with any falls in Yosemite. That is especially true this late in the year. 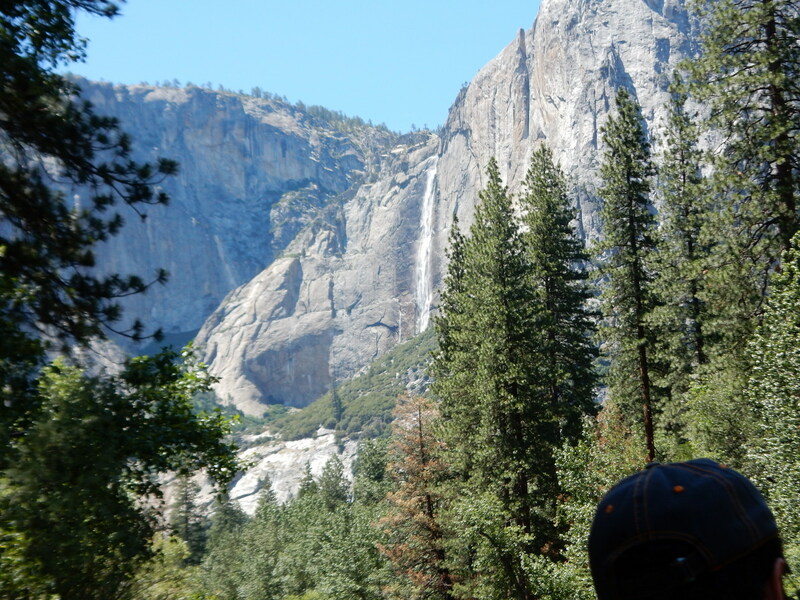 The waterfalls slow to a trickle in the late summer and fall in Yosemite. Our first view was from directly over the top of the falls. 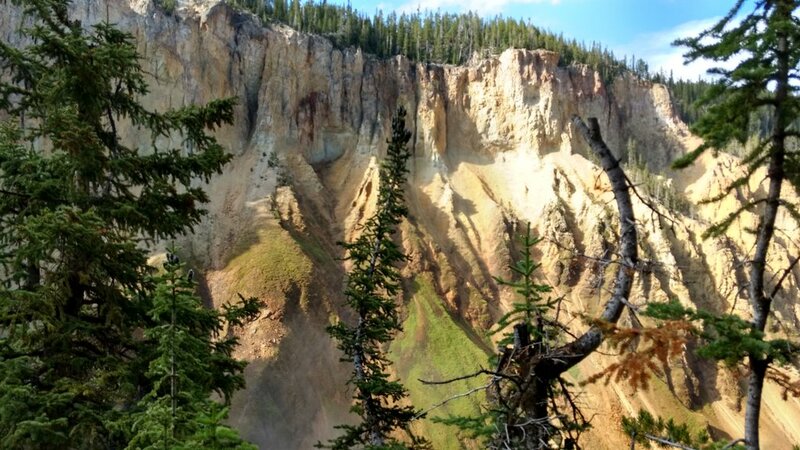 The view of the water, and the mist, and the green sides of the canyon set against the golden color of the rest of the canyon was spectacular. 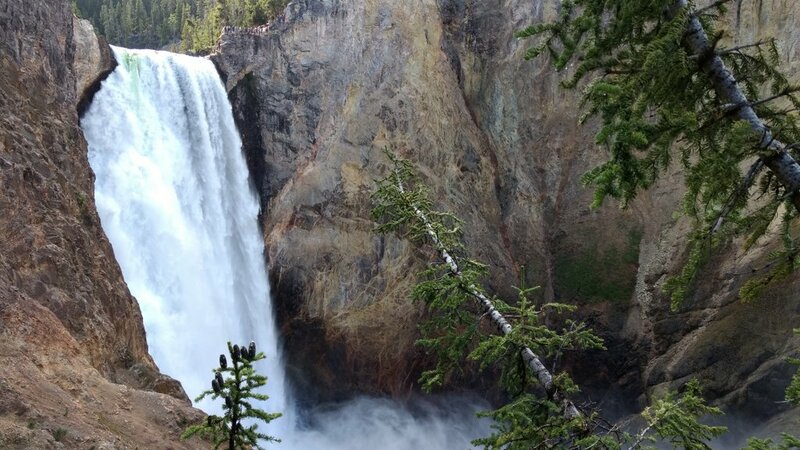 I can’t recommend visiting this place in strong enough terms, it is my favorite spot in Yellowstone. I stretched the camera out a ways and got a slightly different angle/shot. 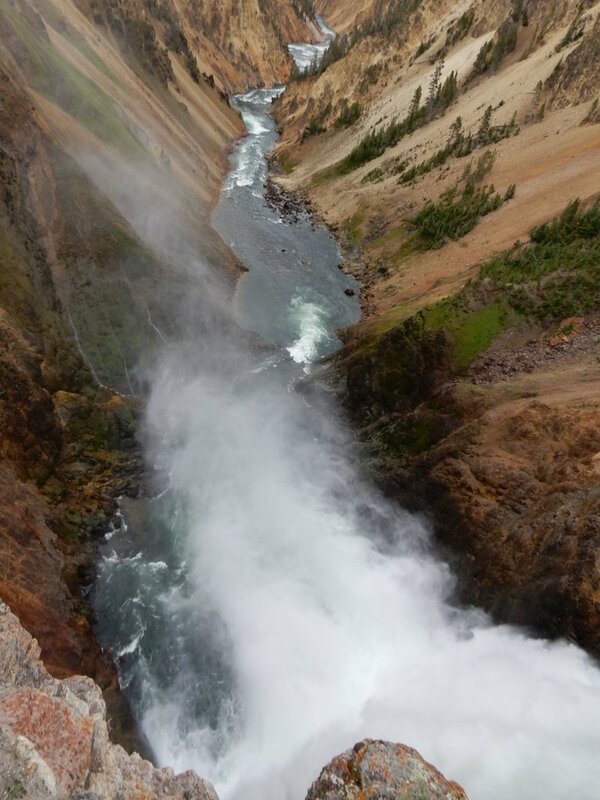 This shows how sudden the drop is and how much water is flowing. Finally we went up one level to get a different perspective. This shows the area we had just left, right on the “brink of the falls”. It started drizzling at that point. We were really wishing we had ponchos, but it was a bit late for that. The walk back up was a bit tougher, but it was cool and the threat of heavier rain kept us motivated. 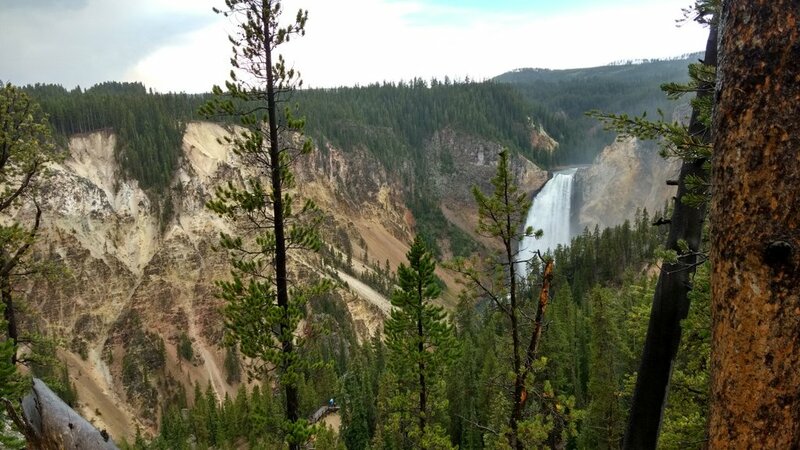 There is also a trail from here to the Brink of the Upper Falls, but with the weather we decided to drive further down the road. The next place we stopped on North Rim Drive was Lookout Point. 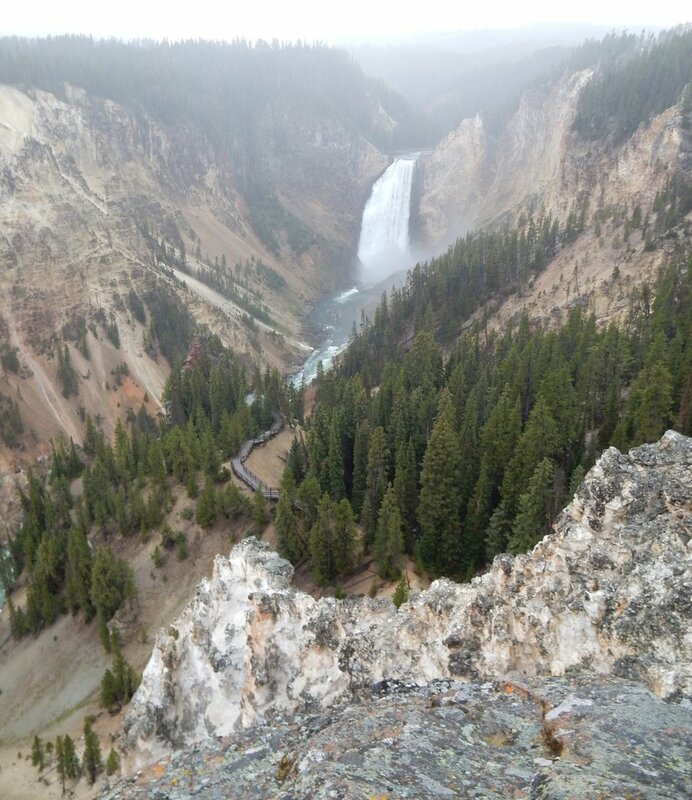 There’s a full view of the Lower Falls from here. but the view of the falls from Red Rock were even better than from lookout point. There is something joyful about hiking unprepared in the rain. Sometime it’s hard to contain that feeling so you just have raise your arms to the sky! Jenny seemed to enjoy it so much… I didn’t want to get left out! We stayed to enjoy the view for several minutes. I managed to get a picture of this bird (Clarks Nutcracker I believe), resting for a minute in the top of a tree between us and the falls. We waited just long enough to catch the blue sky starting to peek out at the top of the falls. Love the coloring of this picture! 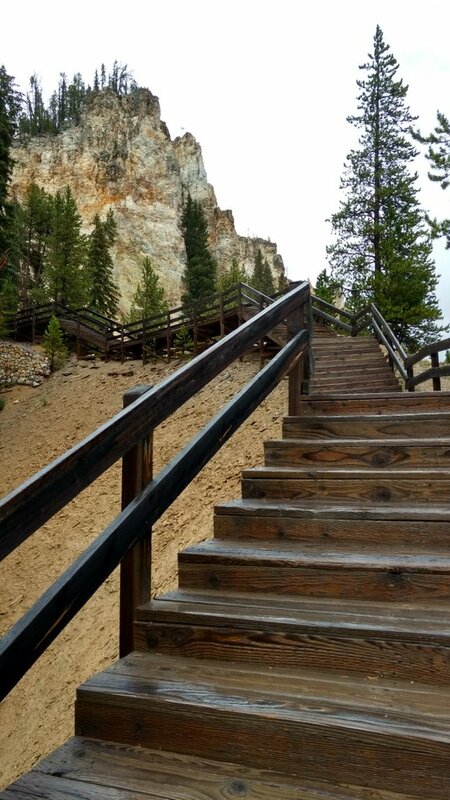 On the way back up I took this picture of the wooden stairs that form the path for much of the bottom of this trail. You can see the rim of the canyon above us. and the other away from the falls and into the canyon. We were soaked to the bone by the time we got to the top. We did take some pictures (evidence), but the smiles could not hide the cold, wet, and a bit worn-out from the climb look. No need to share that look! We decided to go the Canyon Lodge area for some supplies (bear spray and some ponchos) and to get a bite to eat. 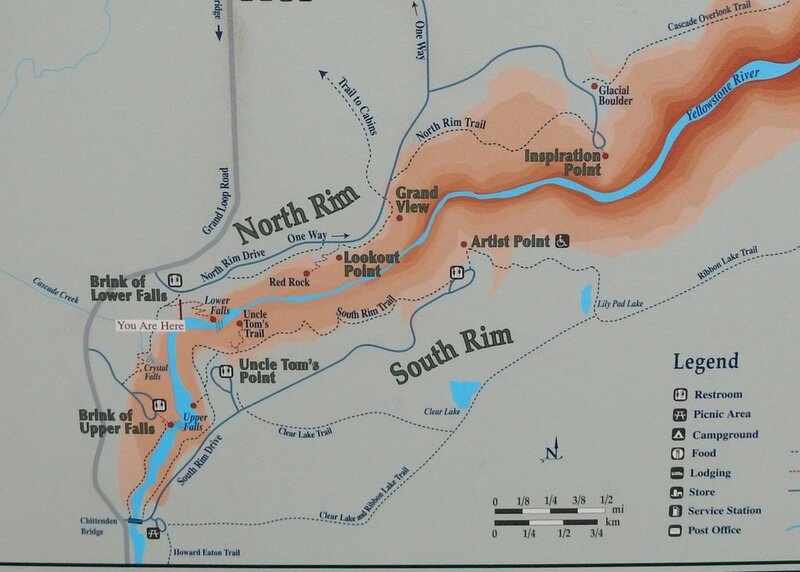 Then we headed to the North Rim. Even though the route we took was not the most efficient route, everything is pretty close together here, so we didn’t lose much time, just enough to dry most of the way out! Our first stop on the North Rim was at Uncle Tom’s point. 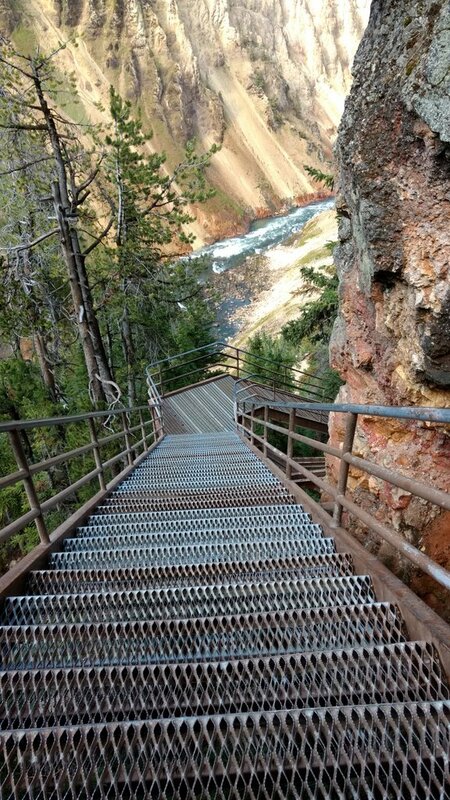 There is a trail here that leads to a metal staircase that takes you right beside the Lower Falls. The pictures from here were unbelievable. If you are in reasonable shape, definitely go down this trail! 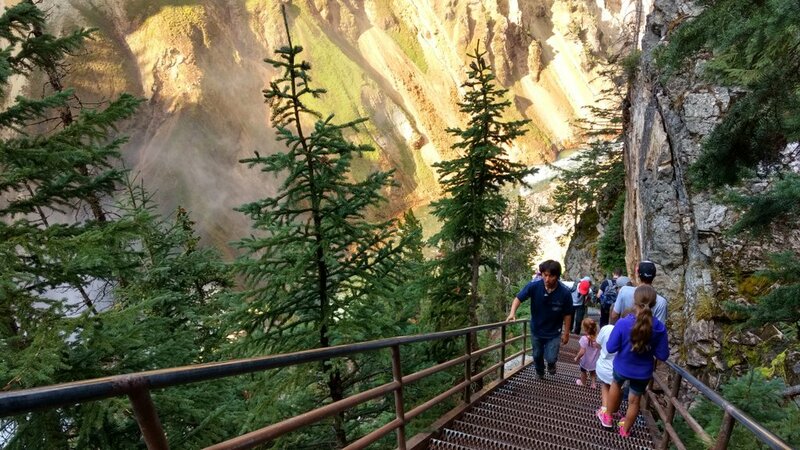 The trail is in good shape, but the fun part of the trip is the stairs and the views of the falls. 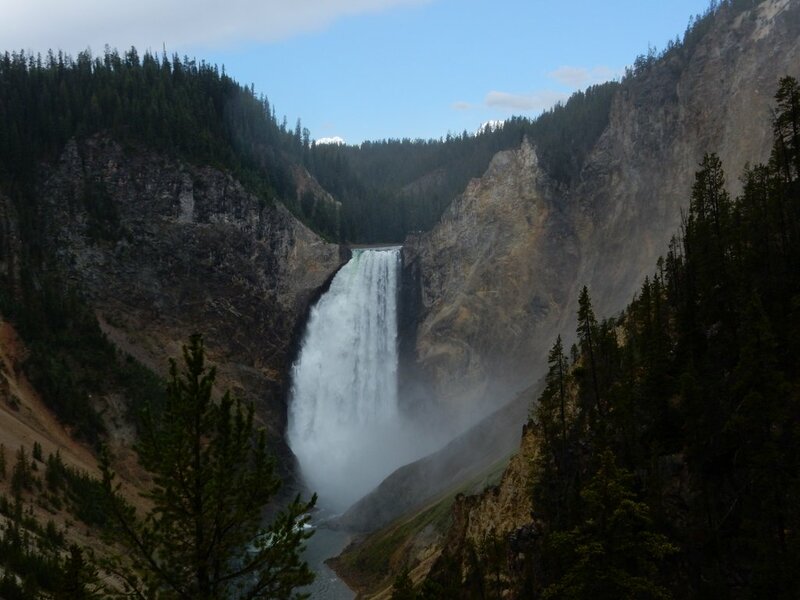 The first view you get of the falls are some of the best. 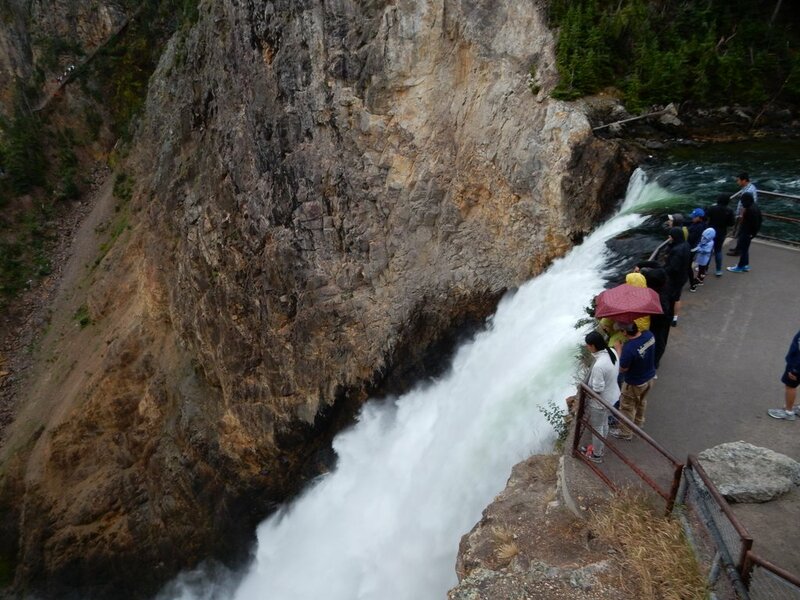 You are close enough to see the size of the crowd on the Brink of the Lower Falls. That is near the top of the stairs. There are lots of stairs – 328 per the sign. The stairs are impressive mostly because of the spectacular view from them. and of course of the falls. Then you get to climb back out! At the top, we debated whether to go on to Artist Point or to hit the road to Jackson Hole, where we would be spending the night. It’s about a 2 and a half hour drive. I’m glad we decided on a quick visit to Artist Point. From the parking lot at Artist Point it is a short walk to the end of the trail. The difference in the view you get as you walk is dramatic though. At first you catch glimpses of the falls through the trees. The trail takes advantage of a curve in the river so as you walk down the trail the canyon seems to open up and fill your view. At first the trees still dominate the view. 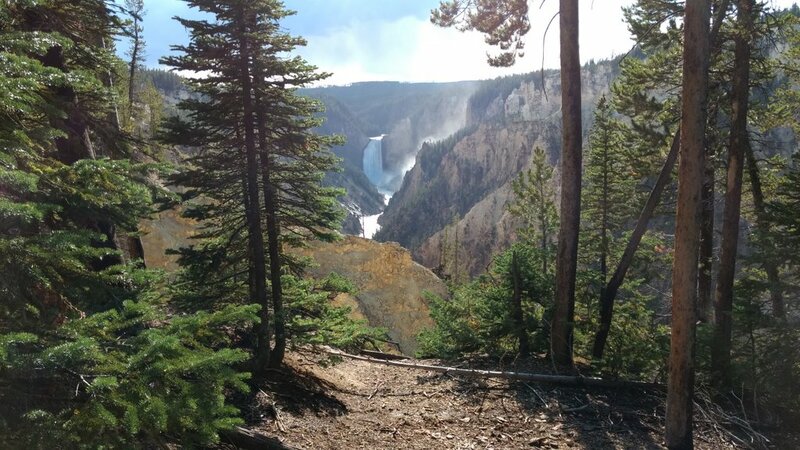 But eventually as you approach the end of the trail you can see the full canyon and a long stretch of the river. 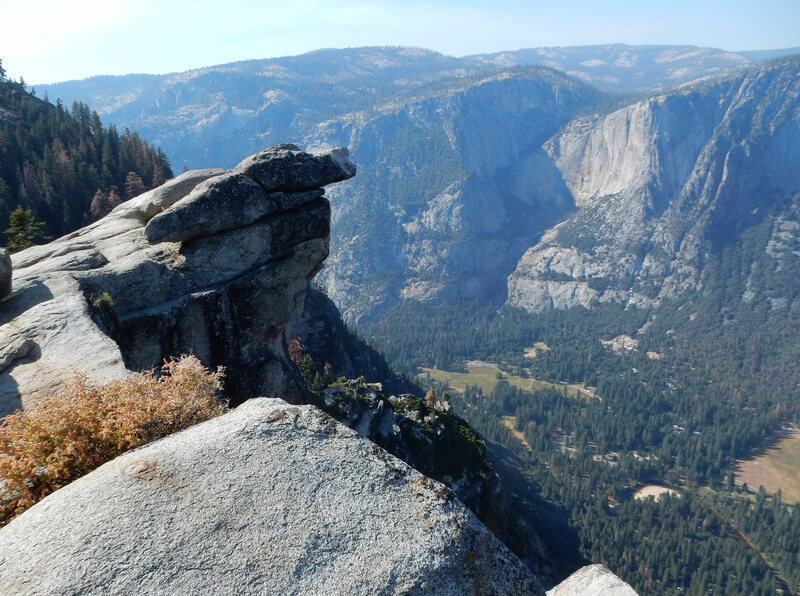 From the farthest point you can walk to, the view of the canyon dominates the landscape. I could spend a whole day at this location just taking pictures with different lighting. It is obvious how this place got its name. 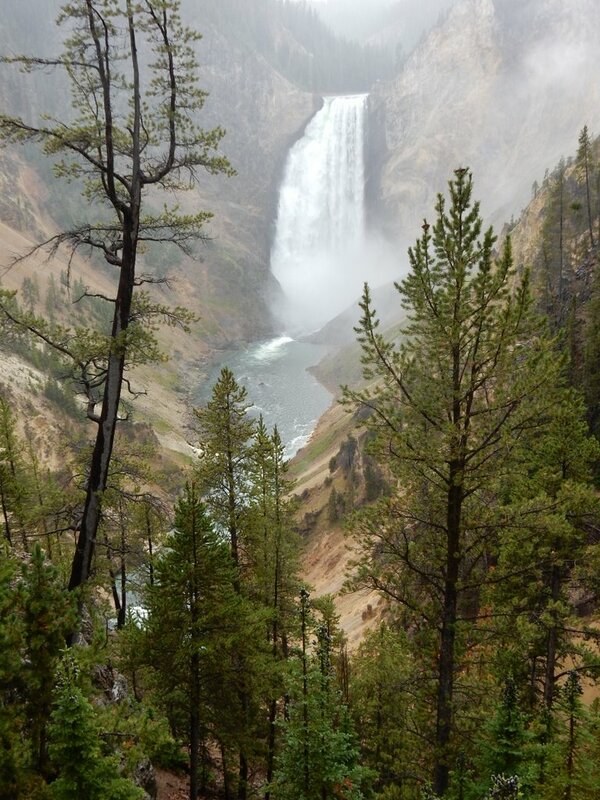 We had seen a lot, but not all of the Grand Canyon of Yellowstone, but it was time to head south. 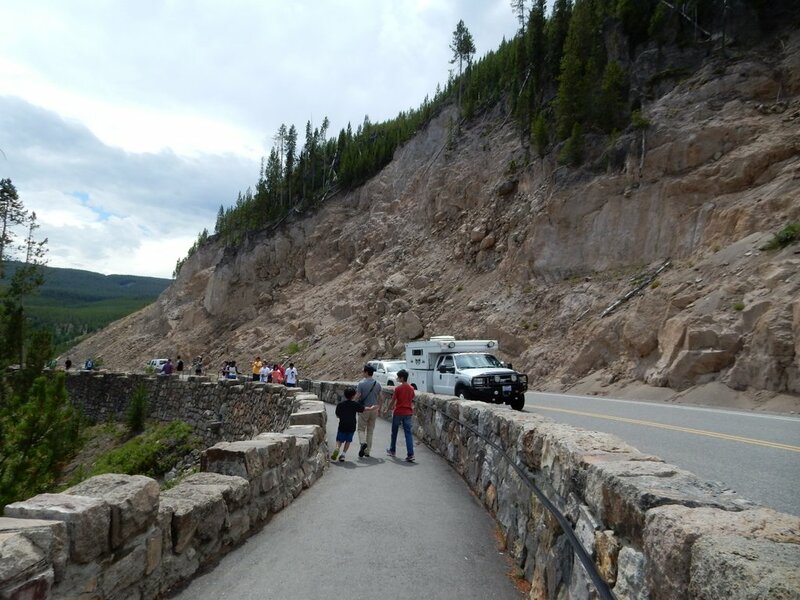 Our route would take us through a big chunk of Yellowstone, past Yellowstone Lake and through Grand Teton National Park. We were hoping there was enough daylight left to enjoy the drive. About a half hour into the drive we noticed a lot of cars stopped in the road. As we approached the area we could see why. There were several buffalo grazing near the road. The traffic was just crawling past this spot and we were at a complete stop several times. We saw the “classic” behavior that can lead to big issues around such big animals. Too many people, too much activity, and people getting way too close. One young lady got to within 30 feet or so to take a selfie. She turned her back on the buffalo smiled big and took her picture. I was afraid to watch! We took a picture (not great, but good enough for me) from the car as the traffic crawled along. We zipped past Yellowstone Lake. We would be back here in a couple days, and we were anxious to get to Grand Teton Park. We got there in time to get some great views of the Tetons. 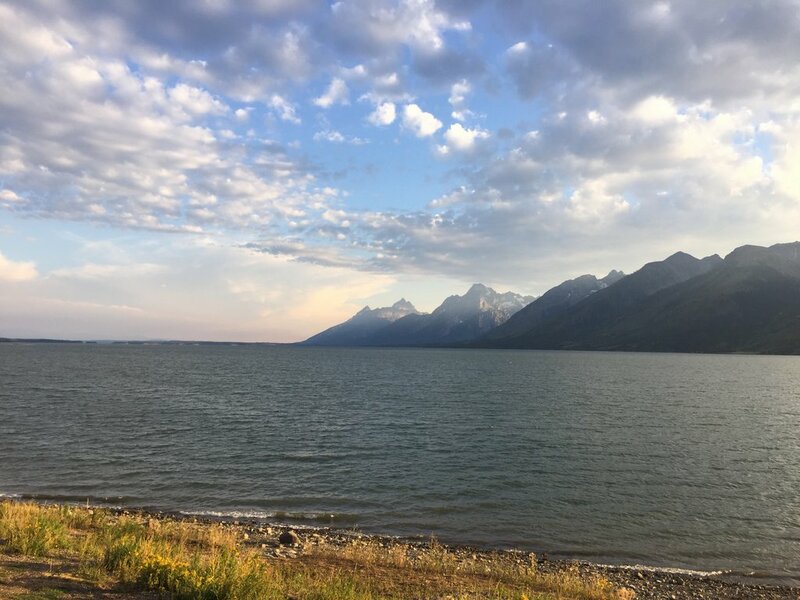 Although we had zipped by Yellowstone Lake, we could not help stopping for pictures of the Tetons across the lakes we were passing in Grand Teton Park. A few minute later we stopped again with a slightly better view of the mountains. and then this panoramic shot. Our reservations in Jackson were at the Cowboy Village Log Cabin Resort. We checked in quickly and got our stuff into our cabin, then walked a couple blocks to have dinner at Snake River Brewing. The service, food, beers, and atmosphere were a perfectly relaxing end to a full day. 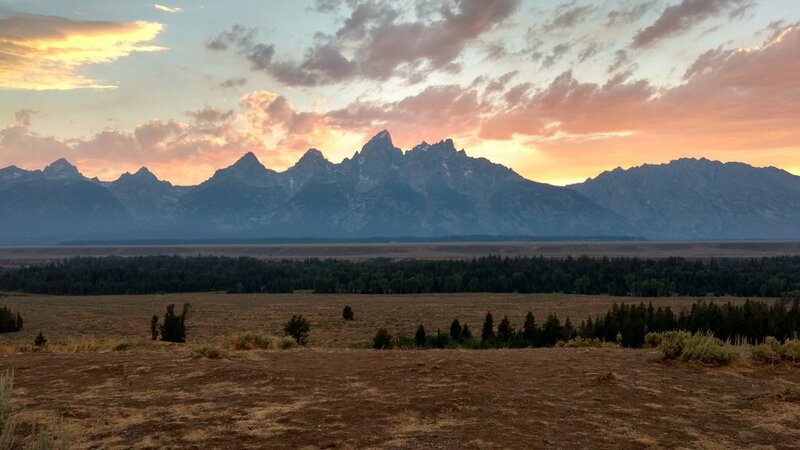 We would be having breakfast with a friend, Charles, in the morning, enjoying Jackson Hole for a bit and then going for a hike in the Tetons. 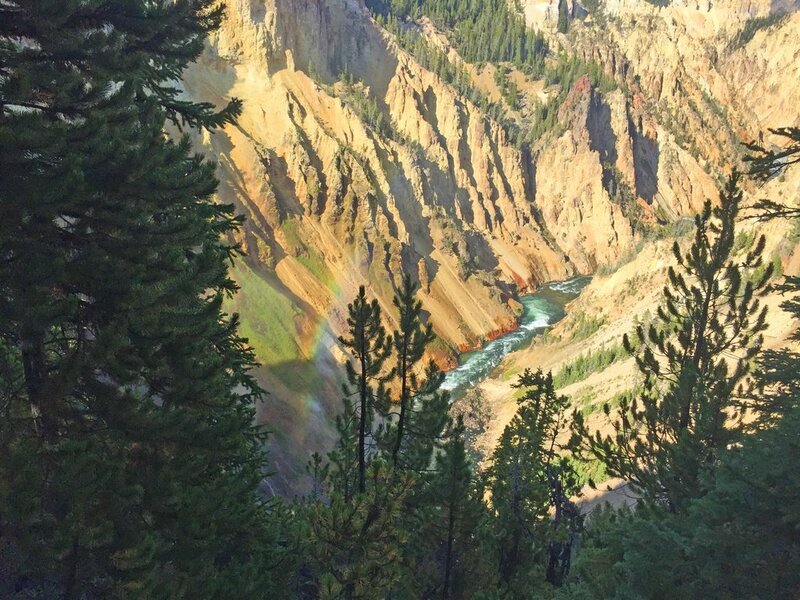 We had chosen what was described as the “easiest alpine meadow hike in the Tetons”. But more on that in the next post. We slowed things down for the last couple days in Maui. 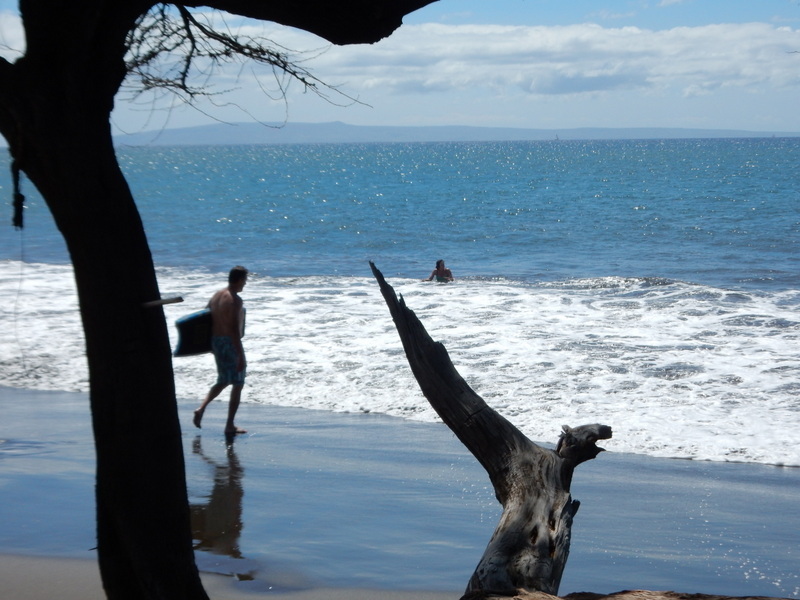 We spent both days at the beach and tooling around Lahaina. On Friday we spent most of the day at Black Rock Beach. We got very lucky at the small public parking lot near the Sheraton Resort. Just as we pulled in a car was leaving, so we nabbed a terrific parking spot. We set up our chairs on the beach and hit the water. We headed toward the black rock area. There were several people jumping off rocks there. I was not interested in climbing up there but my friend Dave jumped off a couple of times. 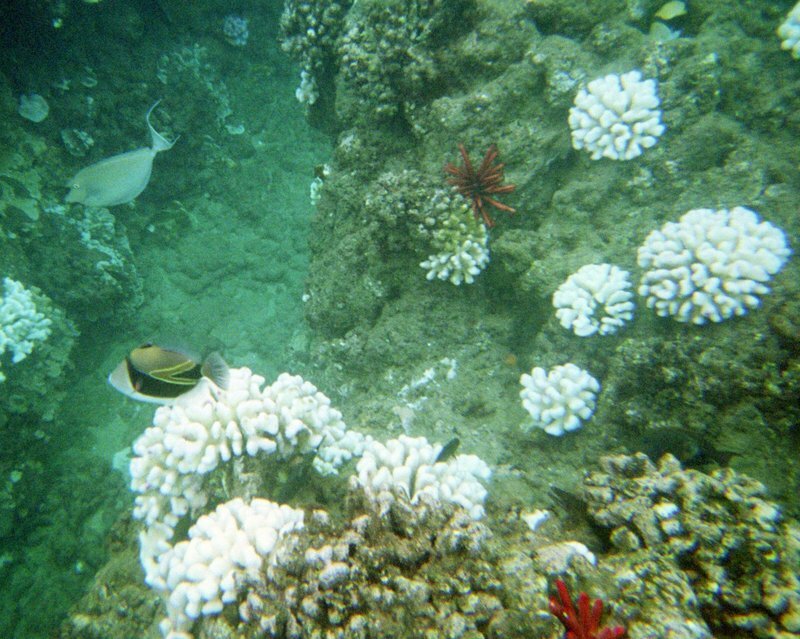 I had bought a disposable underwater camera, one of the few things that still uses film. I tried to get pictures of him as he hit the water, but the camera was not that sensitive. In fact I had a really hard time telling when it actually took a picture – no click! Jenny got one picture of me under the water. The other pictures we took like that did not turn out. We really have grown used to being able to look at the pictures we take immediately on our digital cameras. 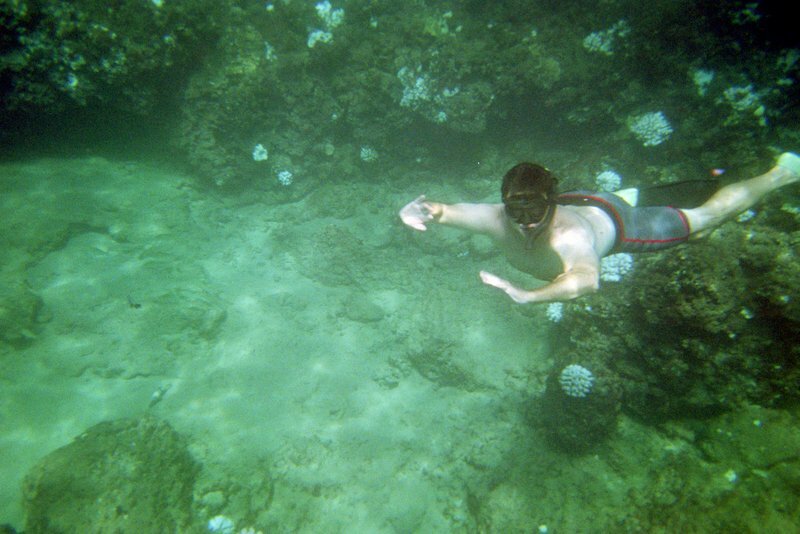 At some point I would like to get a good underwater enclosure for my digital camera. Until then I’ll have to go back to hoping the pictures I take are good. We swam over past the end of the protected area of black rock beach to an area with nice coral. The coral was not the best I’ve ever swam above, but it was pretty nice. The waves “fairly gently” moved us in and back out from the shallows near the edge of the water. I say fairly gently because every so often a bigger wave would come in and push quite a bit harder. I backed off regularly to be sure that I would not be pushed into the rocks. I love gliding over coral. It feels like you are visiting a different world. I’m very comfortable in the water and could spend hours floating in an area like this. Twice while I floated in this area a turtle passed by. 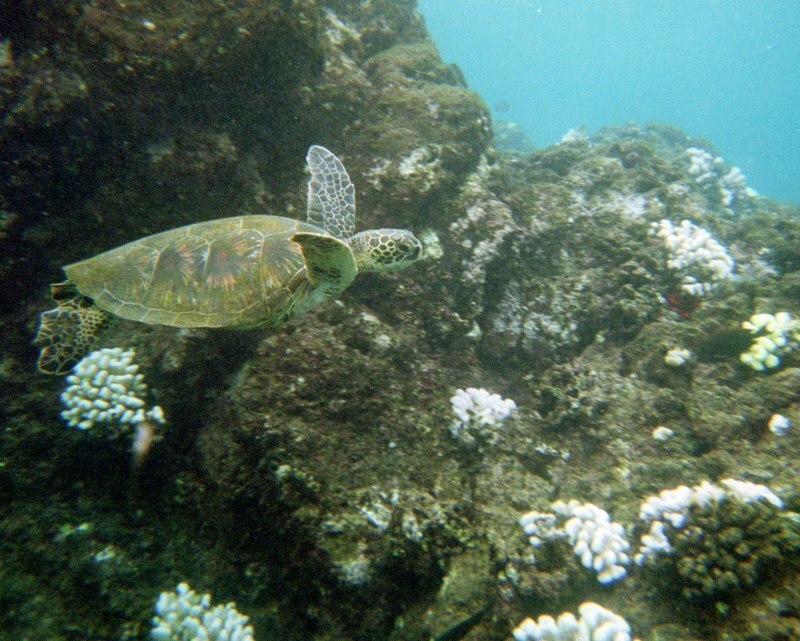 Both times I followed behind the turtle as it swam over the coral. 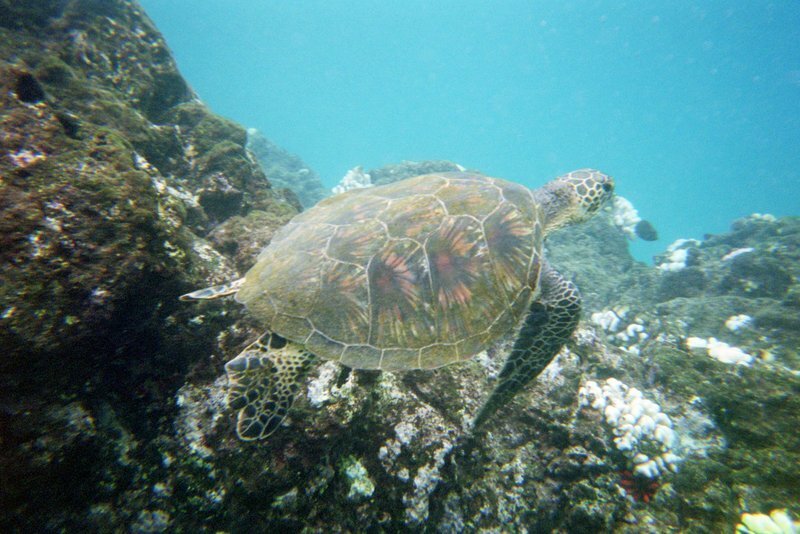 My goal was to get a picture of a turtle and the state fish of Hawaii, the humuhumunukunukuapua’a together in a single picture. I didn’t miss my chance to get several shots of the turtles while I waited. I got a couple good shots of the first one as it passed over the coral. I really like the lighting for this shot of the second turtle. Unfortunately I didn’t get the chance to get the turtle and fish together, but I did get this picture of the humuhumunukunukuapua’a swimming near a bluespine unicorn fish. After a couple trips into the water and plenty of time on the beach we decided to get drinks and pupus at the pool bar at the Sheraton. 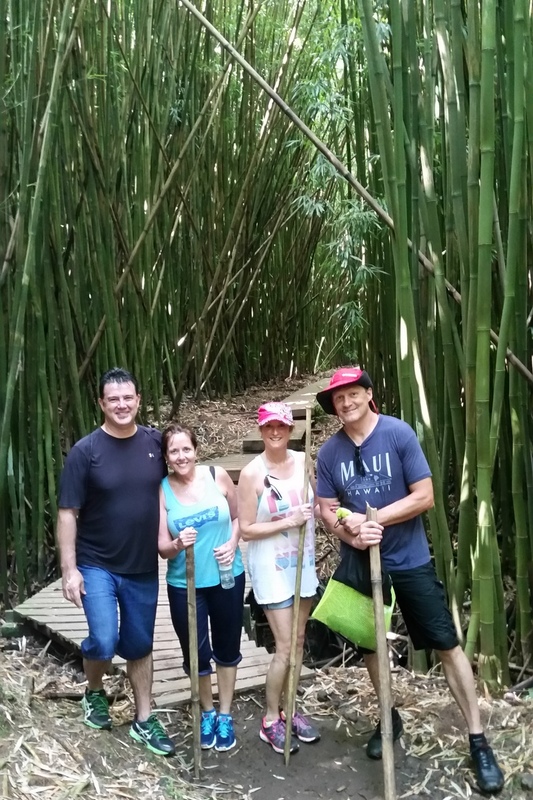 I definitely recommend spending some time there the next time you are in Maui! 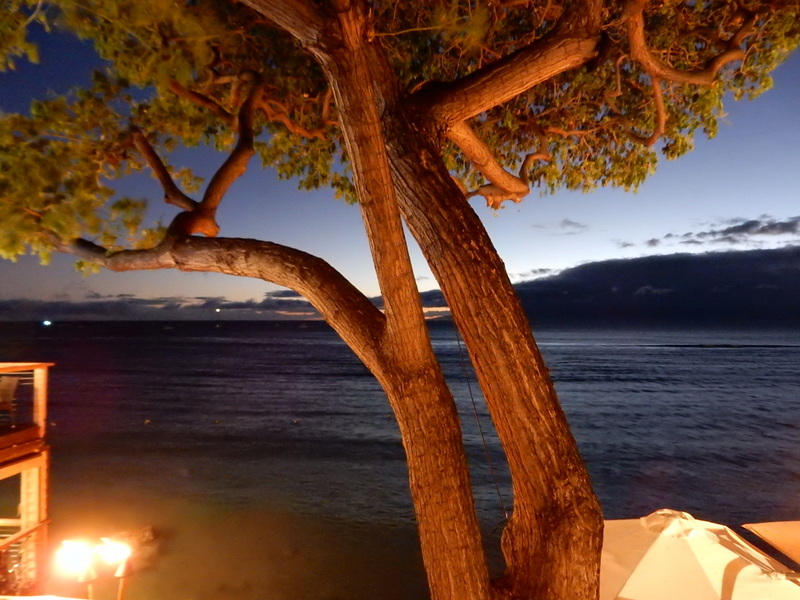 That night we had dinner at Kimo’s in Lahaina. I really recommend this place for the food, the location, and the service. The view from our table wasn’t too bad either. On our last full day in Maui we decided to really go casual. We grabbed the boogie boards and drove away from Lahaina along Honoapiilani Highway until a spot grabbed us. 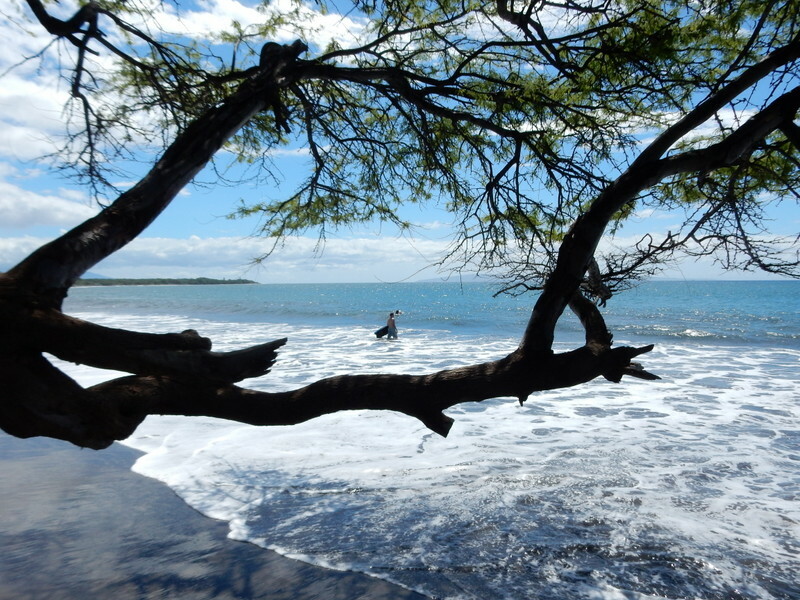 This was the unlikely spot we chose to hangout, swim, and boogie board along Honoapiilani Highway. The beach was a bit rocky, the road a bit close, and the surf a bit shallow, but we had a great time and managed to slow the day down as much as possible. Although it might not look like much from the road we had a place to set up the chairs without walking far, and without fighting a crowded beach. There was one other family near us, but that was it. We were also able to set up under a tree, so we had some shade. The tree also helped frame some nice shots of the beach. But it was more a day for relaxing than taking pictures. Right before we left unfortunately Jenny cut her foot on a rock under the water. It was a pretty bad cut. The only good thing about it was it didn’t happen on our first day! We got some first aid items on the way back to the condo, fixed her up and enjoyed the rest of the night visiting and doing some last minute souvenir shopping in Lanai. 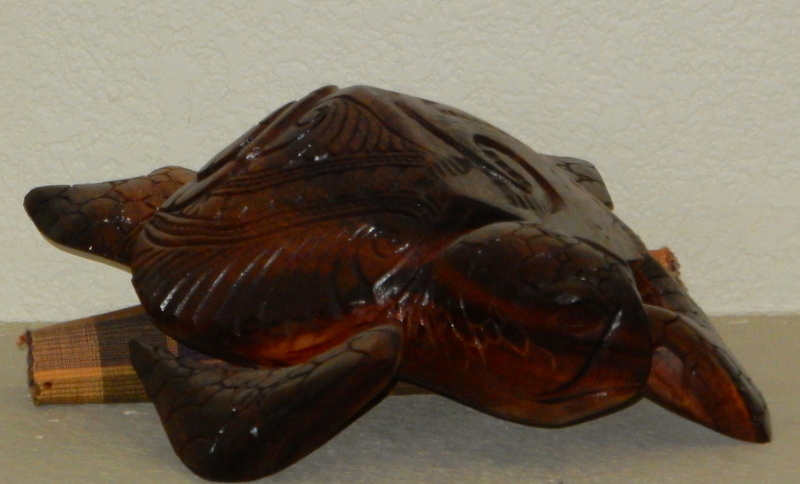 On the last day we had arranged to meet a local man at the airport to get a turtle he carved for us during the week. We had met him on the street in Lahaina. I was a bit unsure of how well the turtle would turn out but we were very happy with the end result. We decided to give him a nice tip on top of the agreed upon price. It’s been a year since we went on this trip (yes I’m way behind on my blog posts). I’m really glad we decided to visit all the different islands rather than just going back to Kauai again. 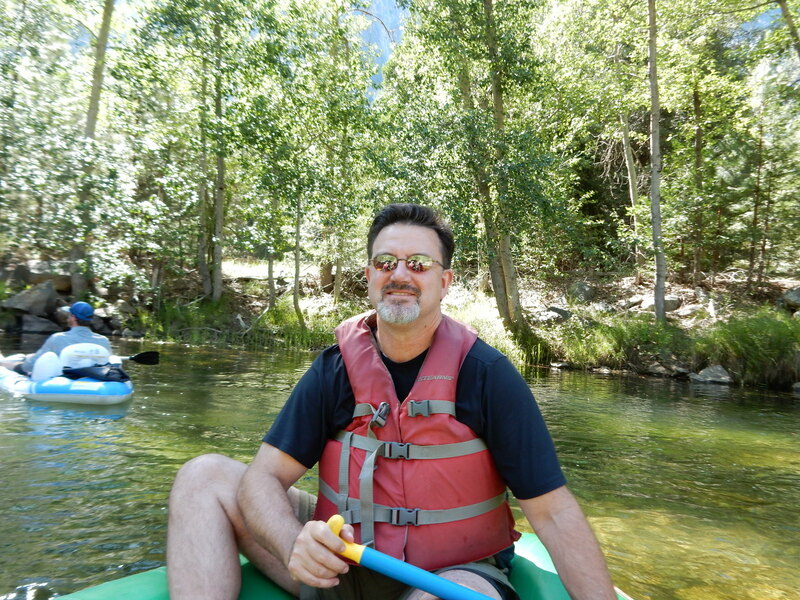 We loved Kauai and will definitely visit there again, but our next visit to Hawaii will most likely be to the big island of Hawaii and Hawaii Valcanoes National Park. It may be a year or two before we can put that on the schedule. Until then we’ll have lot’s of good memories from this trip. To see all our Tropical Vacation Posts go to our Tropical Vacation Posts page. 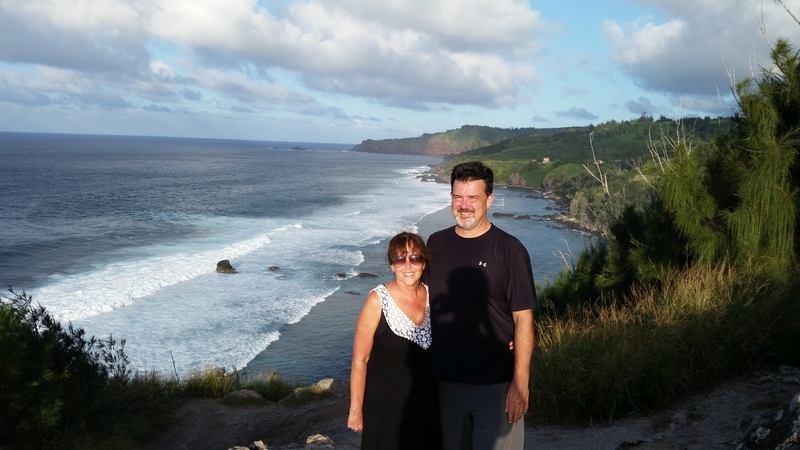 On Day 3 in Maui we got up early to hit the Road to Hana! 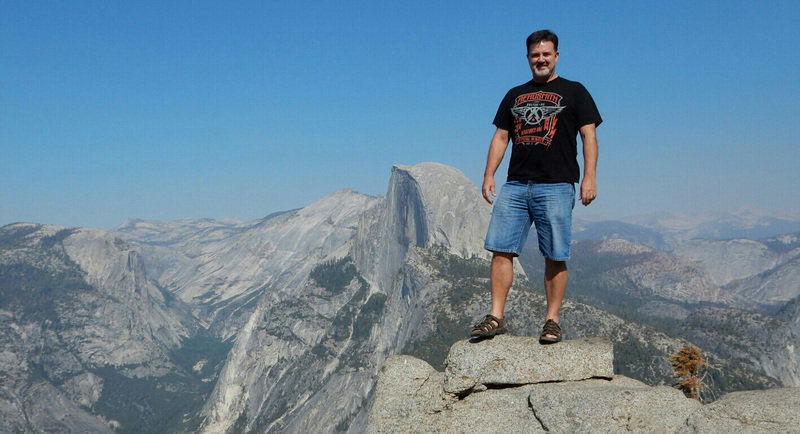 This is a tourist must do, so if you’re a tourist… you do it. It is a road in fairly poor condition. That is probably because all those tourist keep driving on it and wearing it out! But it is far from a tourist trap, it is well worth the drive. 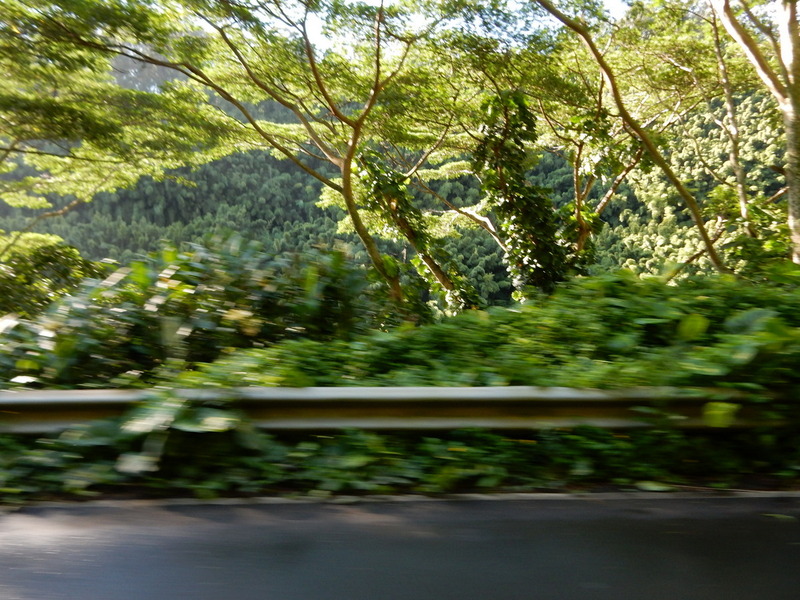 It takes you through and to some of the most beautiful parts of Maui… if you’re one of those people who like tropical paradise anyway. We got up early to head to the other side of the island. 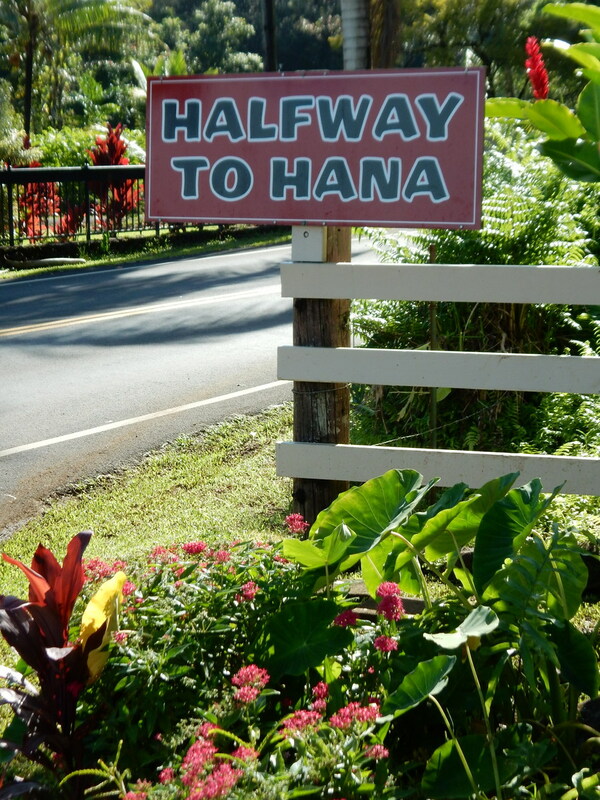 The goal was to get to Paia and the start of the road to Hana before the traffic got too heavy. 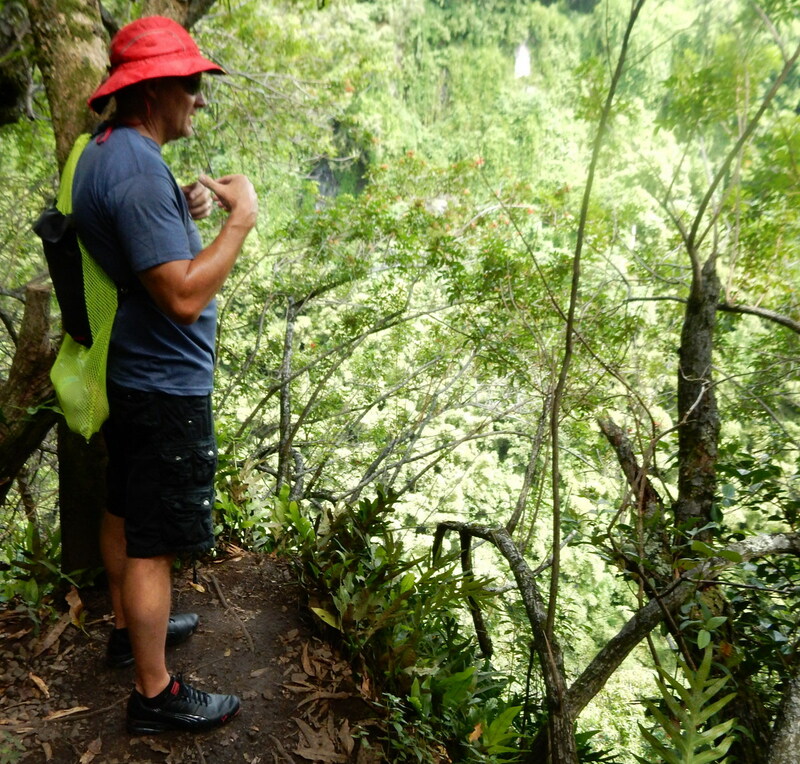 We planned to drive fairly straight through to the end so we would have time to hike the Pipiwai Trail. Then we would stop on the way back if there was anything else we were interested in. 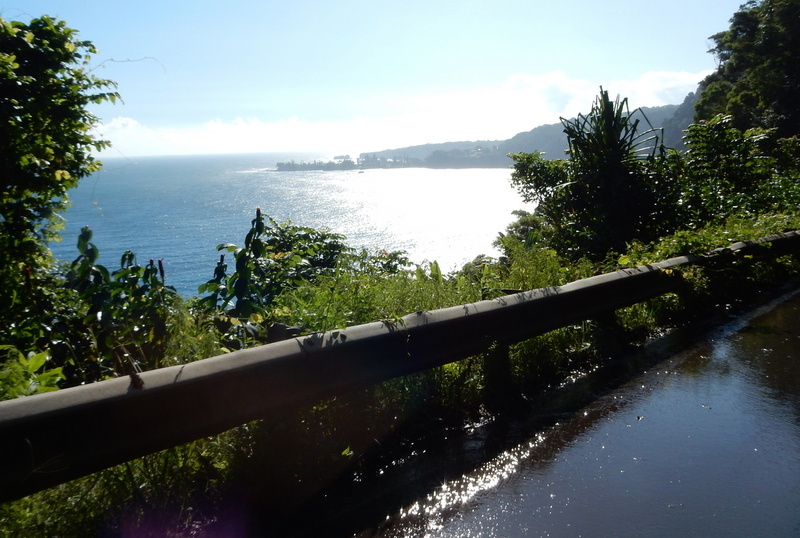 The traffic was not too bad as we headed from Lahaina to Kahului. There were some low clouds on the mountains, but it was a pretty clear morning otherwise. We decided we would want to stop at Paia on the way back, it looked like a nice small village with several interesting shops. We kept driving steadily until we got to the halfway point. We didn’t stop along the way but we definitely enjoyed the drive! There is a sign at the halfway point along the road that is also “conveniently” right beside a roadside stand that sells snacks and different varieties of banana bread. We got snacks, drinks, and Wendy got some very tasty banana pineapple bread. We wanted a little longer break from the car so we decided to sit on some picnic tables near the stand. 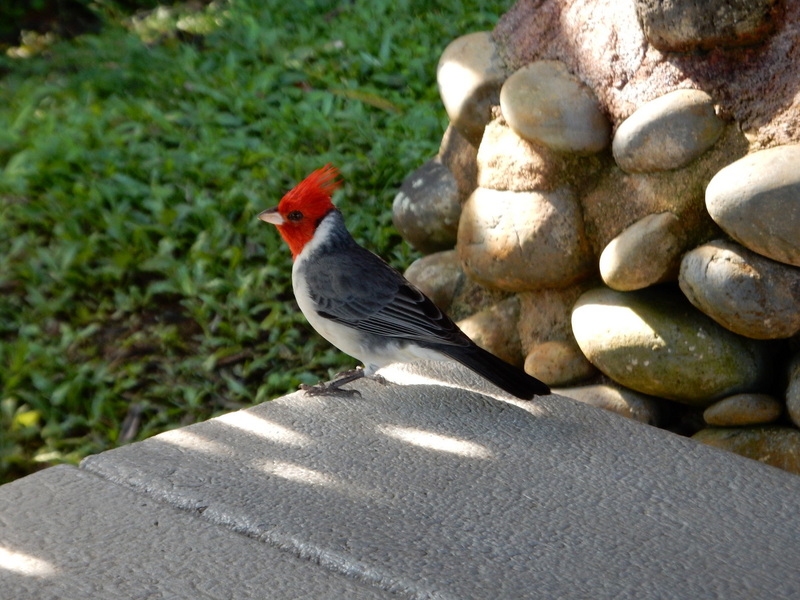 I got there first and noticed a small beautifully colored bird on a small wall beside the picnic tables. I managed to get one good picture before he flew away. 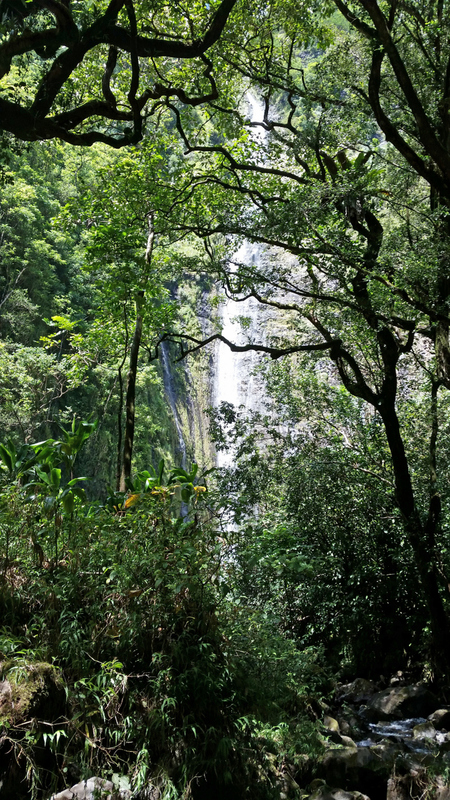 I took a few quick pictures of falls on the way by, like this drive by shot of the three bears falls, but we did not stop again until we were past Hana. The temperature and humidity were big factors in our day again. 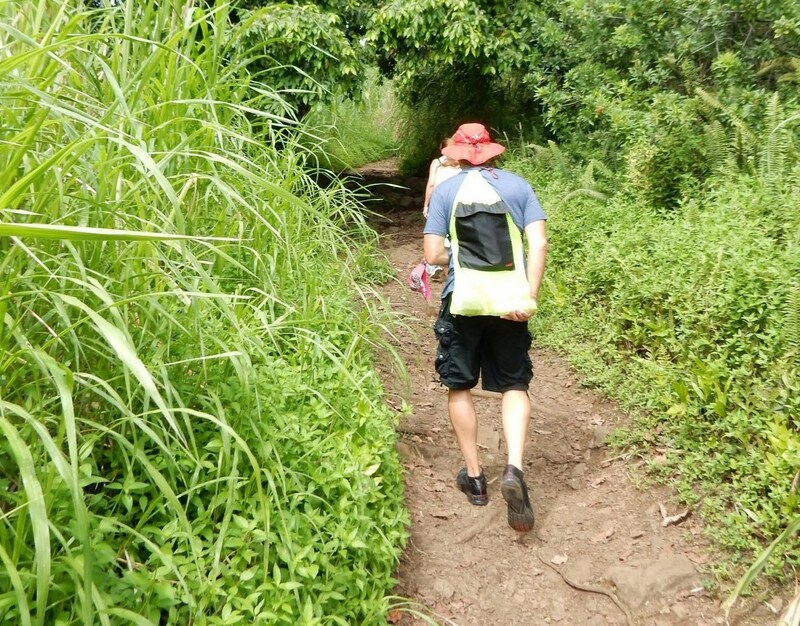 It was well over 80 degrees and very humid by the time we started our hike along the Pipiwai Trail. We took a wrong turn at the beginning… I’ll take credit for that… and ended up on the 7 pools trail. I realized we were headed toward the water instead of inland after less than a quarter-mile, so we turned around quickly, but it had been all down hill to this point, so it was all uphill on the way back. By the time we got to the start of the trail we were already very hot and sweaty! The trail continued uphill through the Oheo Gulch. The first sign I noticed was quite a serious warning. 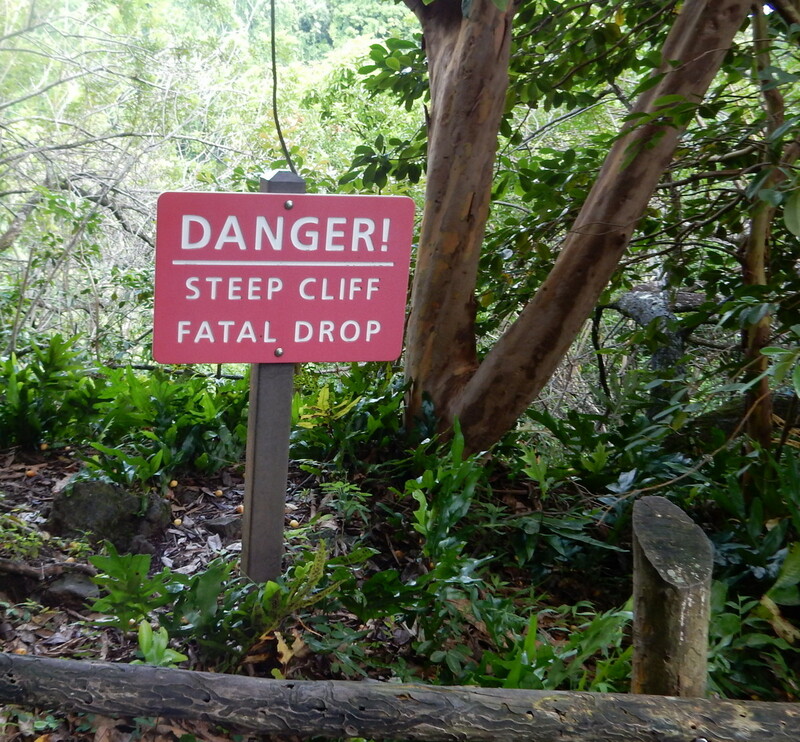 As I looked up the trail past this sign I saw that my friend Dave had obviously ignored the warning as he was standing right on the muddy edge of the cliff. My first thought was, “What could possibly be worth standing there?”. As I walked up to see what he was looking at I realized it was indeed worth looking at, although I stayed a little further back and still got a great view of the falls of Makahiku. 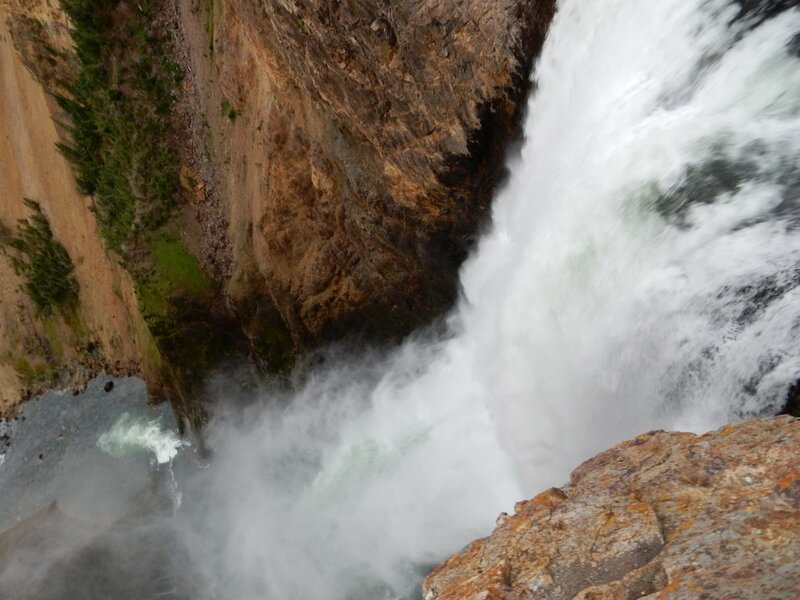 Although it is hard to put this picture in perspective, the falls are about 180 feet high! Next we came to a quite impressive Banyan Tree. Unfortunately my camera had began to act up. Between the humidity and sweat it began to have issues focusing and was taking mostly terrible pictures. 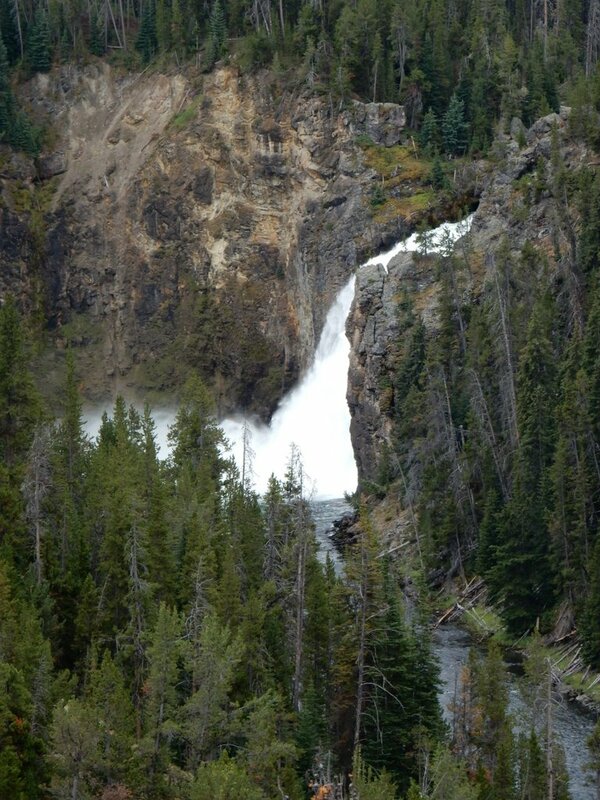 I did get one more decent picture that I snapped quickly as we walked by of a double falls below the trail. After that picture I ended up taking better pictures the rest of the hike with my Samsung phone. 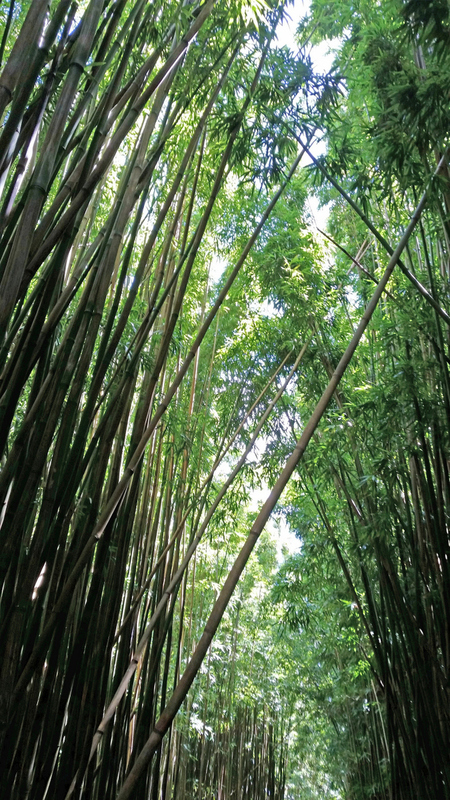 One of my favorite places of all time came next, it was a huge bamboo forest. The trail cut through it up the hill, but you could see very little beyond a few feet off the trail. I really didn’t get as many good pictures as I wish I had, but I’ll share a few. This one was near the start of the trail. and this one looking up, where the best I could get. This last one was actually on the way back later but I like it because we are all in it and it also shows the wooden pallets that were on parts of the trail. There were also a couple of bridges. You can tell we were on the way back because Jenny and I were soaked to the bone. 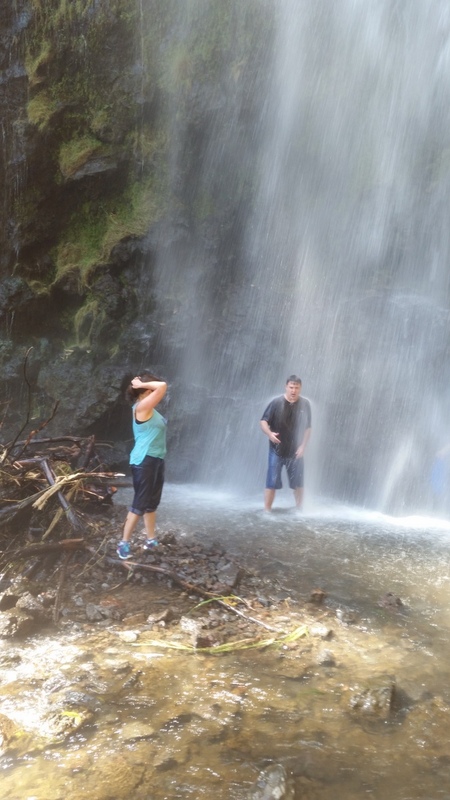 We were sweating, but not that much… we had decided to take our chances and go under the water fall at the end of the trail. 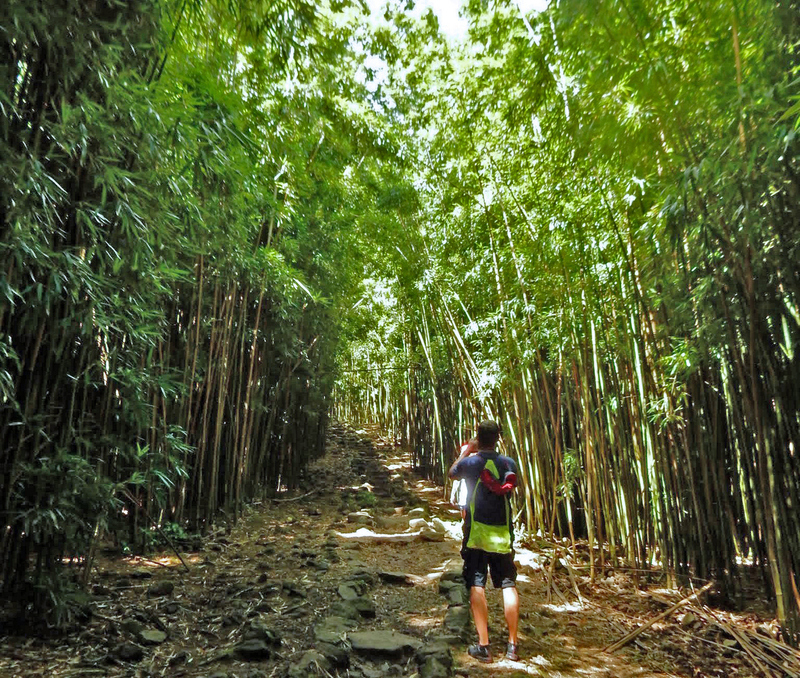 After the bamboo forest, the trail continues though a very lush jungle. 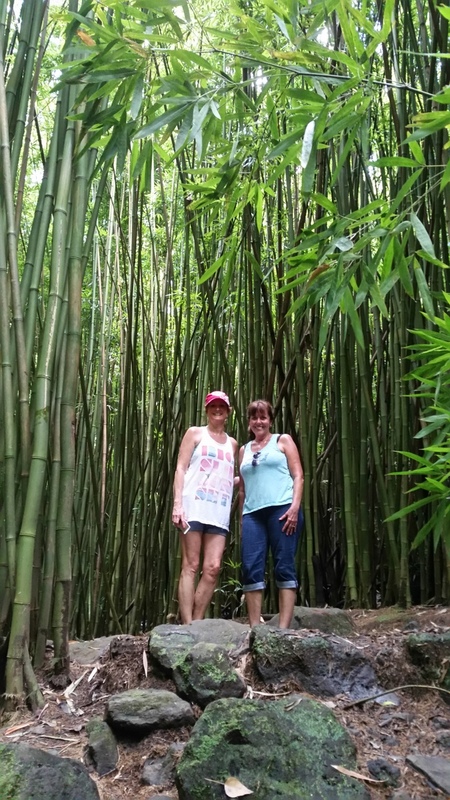 It was actually a few degrees cooler in the bamboo than on the rest of the trail. 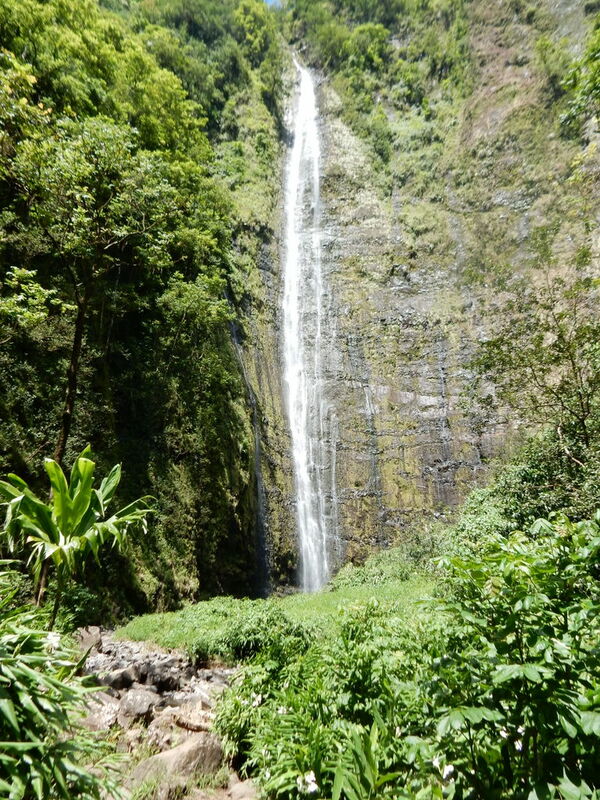 We missed the coolness as we finished up this last part of the hike up to Waimoku Falls. 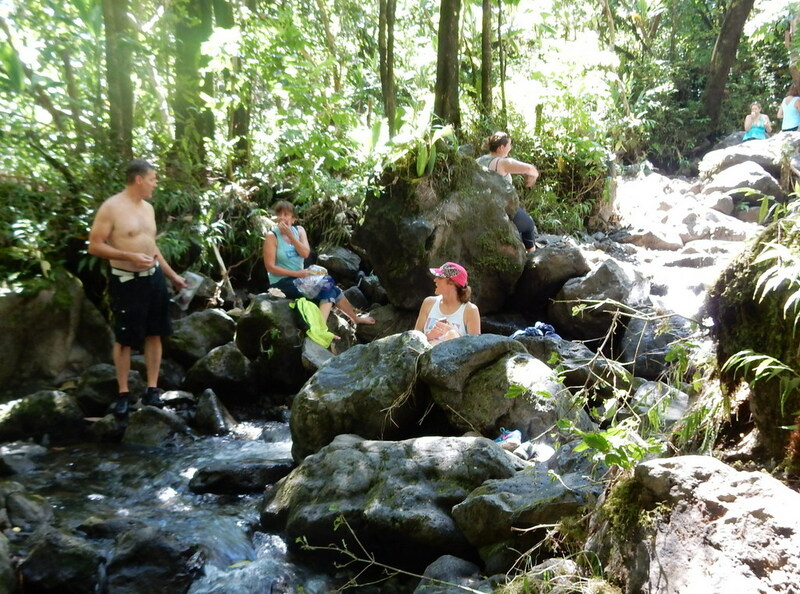 We stopped just before the falls to have lunch on some rocks in a small stream. There was an easy trail to a place to view the falls, but while Dave cooled off in a pool below the rocks, and Jenny and Wendy got the lunch together I decided to explore downstream. The stream came to a merge point with another stream coming from the direction of the falls, so I decided to head that way. After a little boulder jumping I got to a place where I could see the falls through the trees. I was ready for lunch, but my curiosity got the better of me so decided to continue on to get a better view from this angle. It was a very nice view and worth the effort. I headed back the same way I had come after admiring the 430+ foot falls for a bit. It was time to have a sandwich and relax a bit. After lunch we all headed to the regular trail to the falls. The trail stopped well back from the falls with a lot of warning signs to stay out of the area below the fall. I imagine when there is heavy rains this area could fill with water very quickly. We decided to go “a little” closer. The path to the falls crosses the stream early then you walk along a very rocky path. From this angle the view of the fall is not bad either! 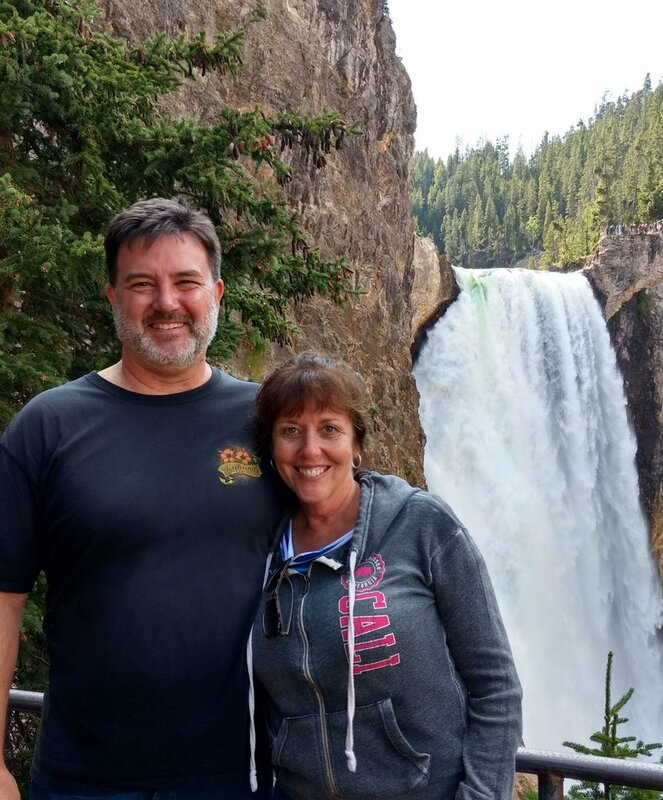 I tried using my phone’s panorama mode to get a picture of Dave and Wendy near the base of the falls. It turned out OK… they were a bit blurry, the falls are a bit distorted, and the whole picture is a bit over exposed, but I still love this picture. 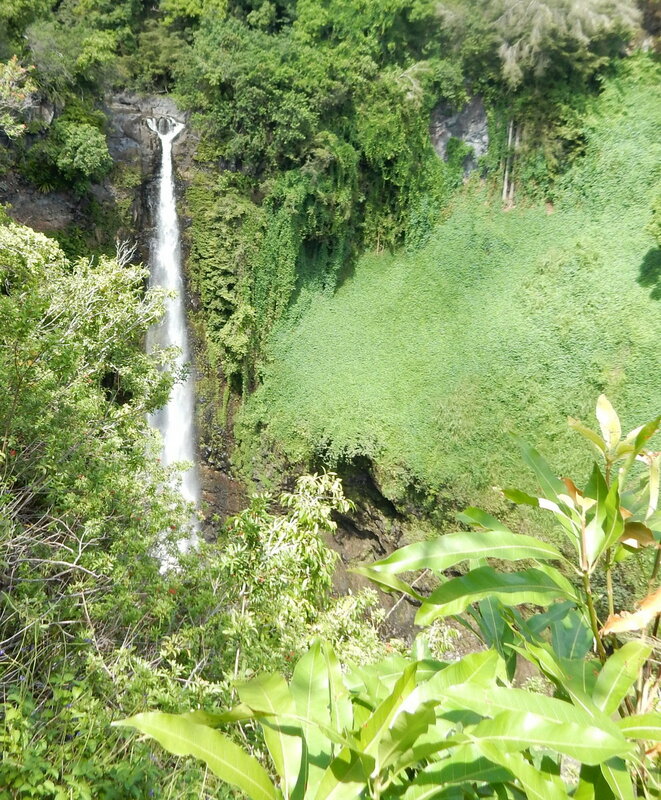 Waimoku Falls is very impressive from this angle. Jenny and I decided to take a little more of a risk and go in the pool below the falls. Rocks and branches can come over the falls easily with the water, so I don’t recommend this to anyone. We definitely cooled off though. 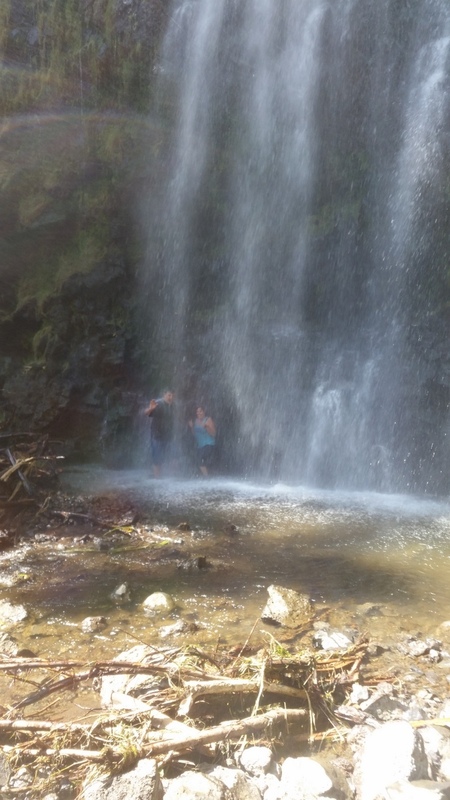 Initially we both went under the falls. I could not tell if Dave got the picture so I came out to ask. There was definitely no way to hear under the falls. Just to be sure I went back under one more time. We enjoyed the hike back out nearly as much as the hike in, but everyone was glad to get back to the air-conditioned car by the time we finished. Although we had planned to do more stops on the way back, very few places were open, and we were ready to get back to civilization. I did get a couple of nice pictures on the way back though. 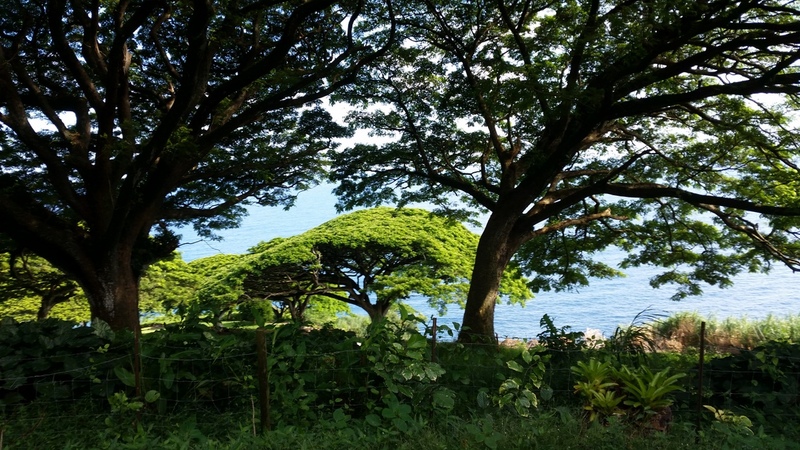 We all decided if we moved to Hawaii we wanted this to be our front yard! 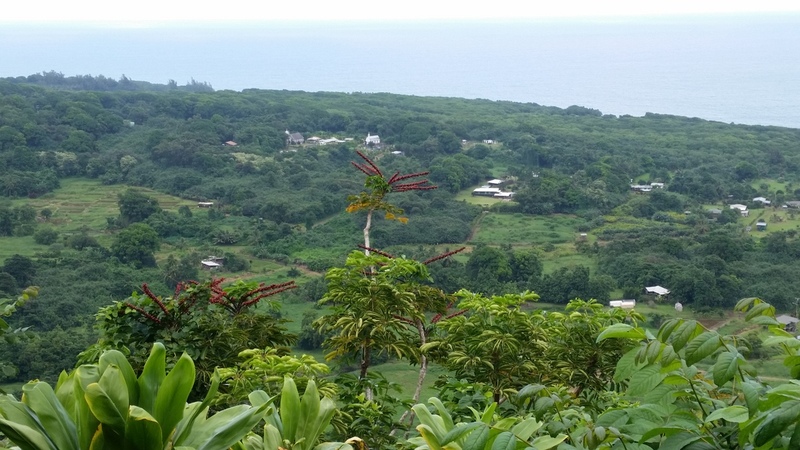 I also liked this view of this small village just off the Road to Hana. We decided to stop in Paia for dinner. We had heard great things about Mama’s Fish House, but we were definitely not dressed for it. We decided to go much more casual and eat at the Flatbread Company. It was a bit warm in the restaurant, but heck it was warm everywhere, but the pizza and cold beer were great. We went into 2015 with the intent to have fewer planned vacations. I started a new job with fewer vacation days to start. I would have no vacation days early in the year, so we decided to plan a trip to Hawaii later in the year so I could save up a few days. We decided to go the week of Columbus day to save even more of my vacation time (I only needed 3 days of vacation time). Our last trip to Hawaii was to Kauai in 2011 and we had a great time. For that trip we stayed in two different locations and both of them were right on the water. We wanted to do things a little differently this time. We decided to look for a condo near Front Street in Lahaina so we could walk to the shops and restaurants in that area. We would drive to the beaches but be able to relax and enjoy ourselves in Lahaina without worrying about having to drive home. We found a condo 2 blocks from Front Street. The condo was in the Aina Nalu a condo property partially managed by Outrigger and partially privately owned condos. It has lots of amenities but the true appeal is the location. We ended up getting one of the privately owned condos in this property that was listed on Vacation Rental By Owner (VRBO). It was a 2 bedroom, 2 bath condo which was perfect for us and the other couple Dave and Wendy who would be going with us. We’ve had several terrific vacations with them over the past several years. Although they live in Boise Idaho and we live in San Diego we actually got together 4 times in 2015; once for this trip, once for my daughters wedding in California, once for his daughters wedding in Idaho, and again for New Years eve and a trip to the Rose Bowl on New Years day. We had a great time in Maui, but there was one unexpected thing that made Hawaii a little less of a paradise on this trip. Due to the El Niño in the Pacific the temperatures and humidity were much higher than usual. Most days were in the 80s with humidity in the 90 percent range. This is not normal, and not what we expected for October in Hawaii. Even though we only had a 2 block walk to Front Street in Lahaina, by the time we got there we would be dripping sweat. I’m pretty sure this is the last time I’ll go to Hawaii during an El Niño year. Our first day/night in Maui we just took it easy. On the way from the airport we got some groceries to stock up the frig. After we checked in to the condo, we walked down to Front Street to get lunch. We decided on a burger place right on the water called… Cheeseburger in Paradise. The food was delicious, the service good, and the view from our table was amazing. 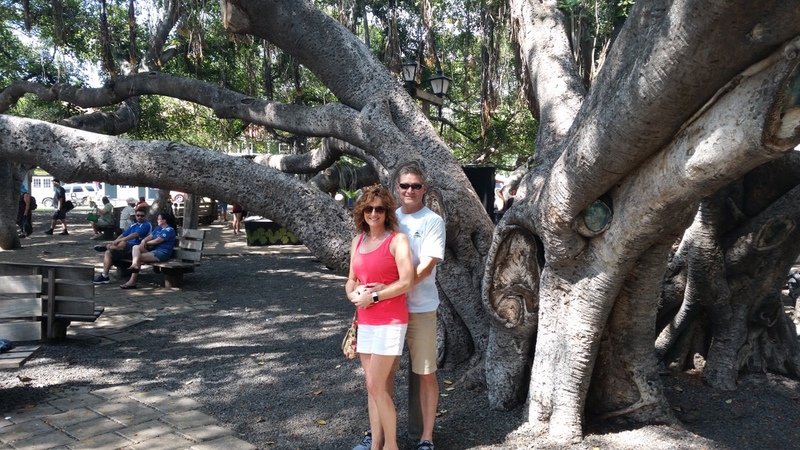 We checked out some of the shops along front street which are mostly souvenir shops and art galleries and we spent quite a bit of time under the Banyan Tree at a regular art festival. Got a picture of Dave and Wendy under one of the trunks of the tree. After the long flight and the unusual heat we decided to head back to the condo to clean up, catch-up and take it easy. Jenny and I took a nap for a few hours, then we decided to take another walk downtown after dark. We walked under the Lahaina Court House banyan tree again. 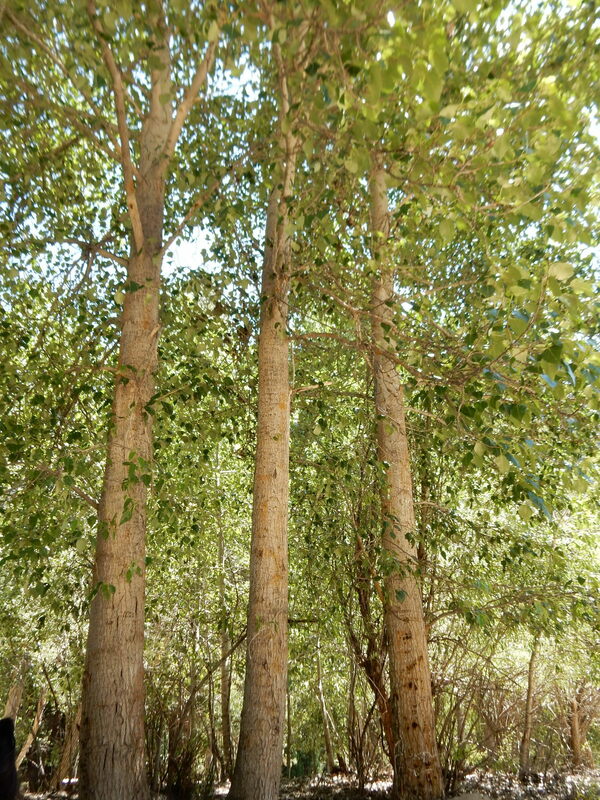 It is an amazing tree, really hard to believe it is only one tree. Then we walked out toward the pier and I got this image of Front Street lit up from the park behind the Lahaina Public Library. As we walked back toward Front Street I noticed a place that was advertising an old favorite snack – Dole Whip (frozen pineapple juice). I convinced everyone it was worth the calories! After wondering around Front Street again for a bit, we gave in to the jet lag, and headed back to the condo to get a good night’s sleep. Dave and Wendy had arrived a couple days earlier than us to do some exploring. 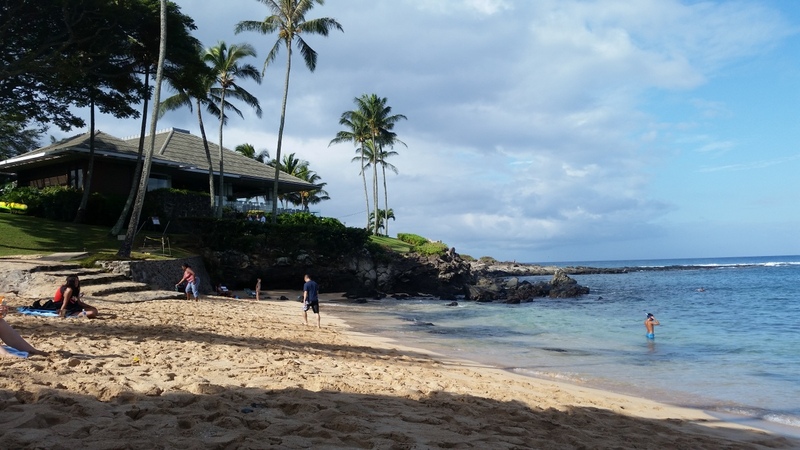 They found a beach they really loved, Kapalua Beach, so on day 2 we decided to check it out. 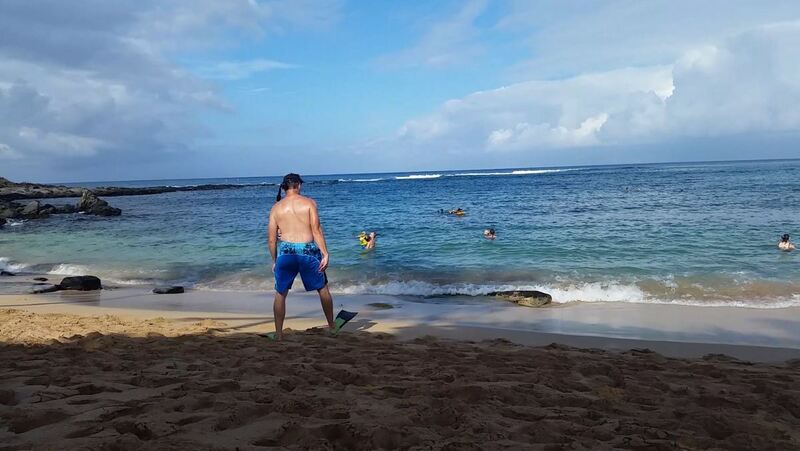 We stopped at a snorkeling/boogie board rental place on our way out of Lahaina. The person working there was a wealth of knowledge and gave us some great tips for how to best do things we planned later in the week, like the road to Hana and a bike ride down from Haleakala after seeing the sunrise over the crater. Her advice really helped us enjoy the rest of the week, and we got good prices on the equipment rentals and the bike ride reservations. There were areas of rain just about every day we were in Maui, but luckily there also were areas on the island where it was not raining. On the way to Kapalua Beach we saw some rain clouds, which were a bit concerning, but it was not raining near the beach. 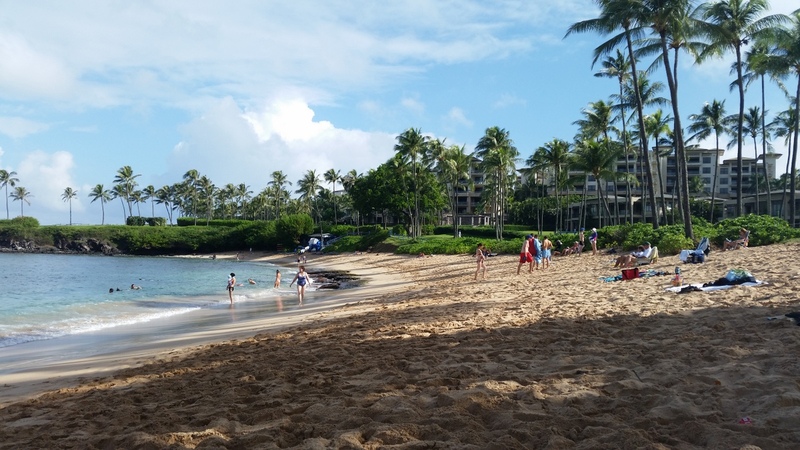 There is a small public parking lot near Kapalua Beach which provides great access to the beach, but you have to get there pretty early to get a spot. There were no spots available when we got there, but there was still plenty of parking along Lower Honoapiilani Road. Even that fills in fairly quickly so the earlier you get there the closer you will be to the beach. We were only about a quarter mile down the road, so not too bad. There are public bathrooms on the way down to the beach, and then you go through a short tunnel and on to the beach. There were quite a few people there already, but still plenty of room to set up our chairs and beach towels (provided by the condo rental) in a nice shady area. 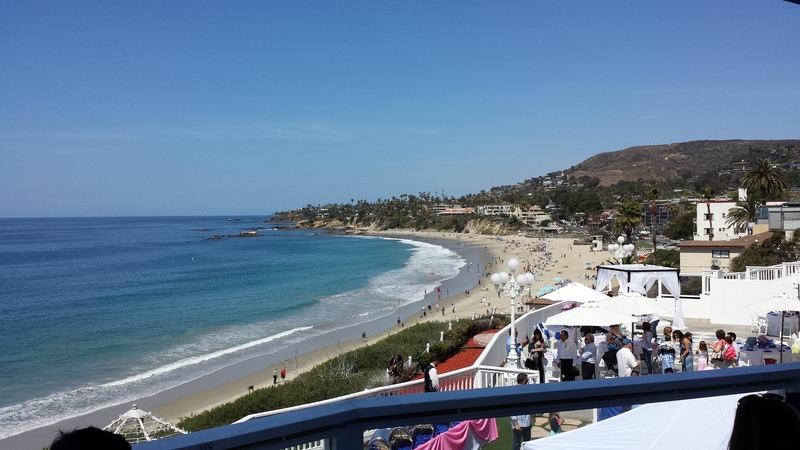 The beach is in a beautiful cove but it is just a short walk to nearby resorts and restaurants. Even in the shade it wasn’t long before we were hot and ready to get in the water. My friend Dave was happy to lead the way by putting his mask and fins on in his chair and then walking down to the water. There are few things in life that are funnier than someone walking on the beach in fins. We all had a great laugh. Luckily I caught the whole thing on a video! I decided to share a screen capture of the video rather than the video. Definitely evokes memories of Charlie Chaplain’s walk as the Tramp! 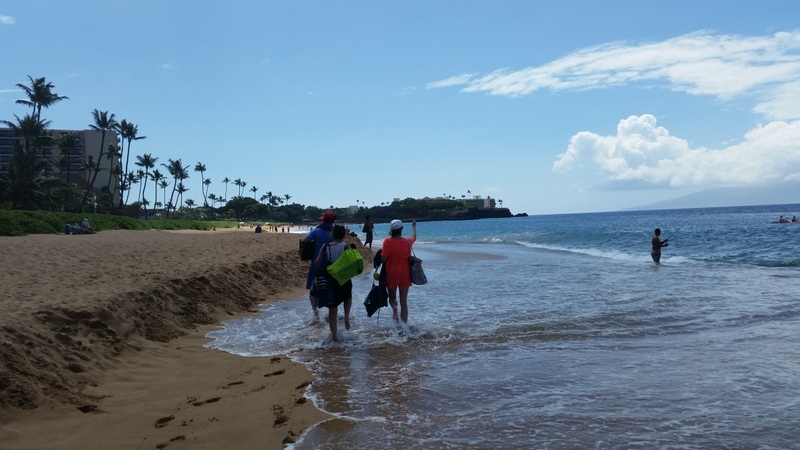 Although we enjoyed the beach and swimming, we wanted to try a different snorkeling spot. 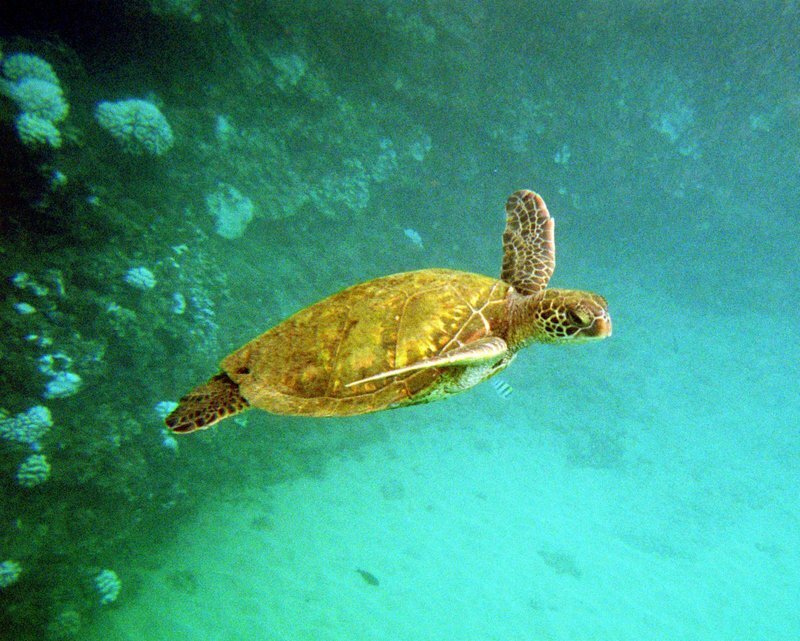 We were hoping to see more coral, fish, and maybe some turtles. We had heard that Black Rock was a good place to snorkel so decided to head there. Not really knowing the area or the best way to approach the snorkeling area we decided to park at what we thought was a good public parking/access area at Kahekili Beach Park. That would mean hauling our stuff about .7 miles from the parking lot to an area near the Black Rock area. We had stopped at the Honolua Store on the way back to the highway from Kapalua Beach to get some sandwiches and drinks for lunch, so we were set until dinner. The walk on the path and beach took a little more effort than we expected and it was definitely starting to warm up. We set up our stuff under a large tree to enjoy the shade again. After swimming for a bit, Dave and I decided to walk over to black rock area to see what snorkeling in that area was like. We headed out along the large black rocks. There was no coral and not really anything of interest. We decided to go out past the end of the rock and go around the corner to see what was out there. We passed an opening in the rocks and continued on for about another 50 yards. The water was getting deeper and deeper to our right and there was really nothing to see. I started to hear the Jaws theme music in my head, and kept looking into the murky deep water to our right expecting to see a shark coming our way at any point. After a brief discussion we decided there was nothing to see this way and decided to head back. On the way out we had not noticed we were being pushed along by a current. We definitely felt the current as we fought it back to the corner as we headed back. Progress was slow, but steady. 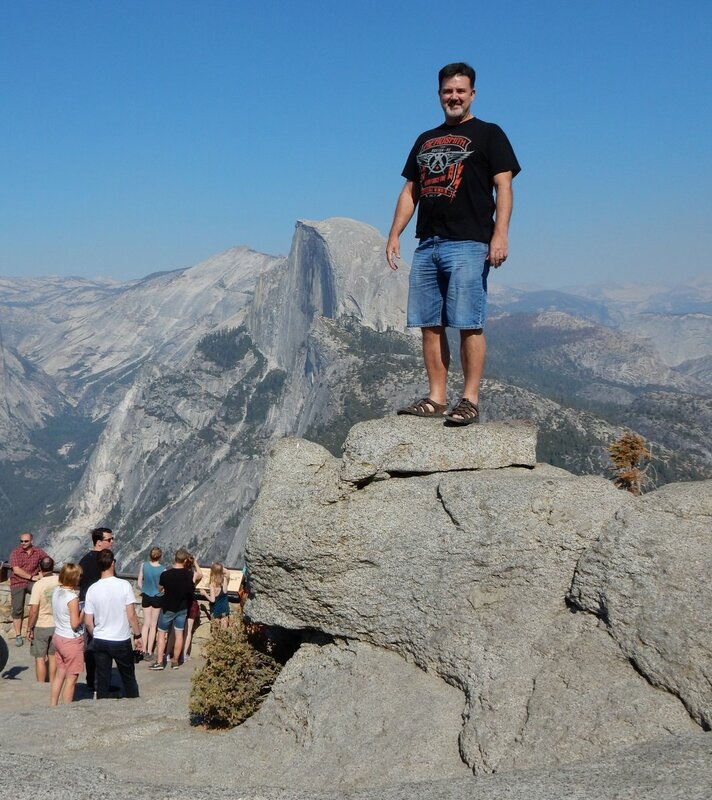 As we approached the opening in the rocks, Dave decided to climb up on the rock and take a break. We were both a bit tired after fighting the current. As he was getting out he smacked his knee on the rock and after we both rested for a bit he decided to walk back to the beach over the rocks rather than get back into the water. Now it was time for me to look a bit silly. I have very tender feet. It’s actually a bit embarrassing. I was walking so funny it concerned Jenny and Wendy so they came over to see if we had gotten hurt. We were fine, but my pride was a bit bruised. Luckily no one got a video of my walk of shame! 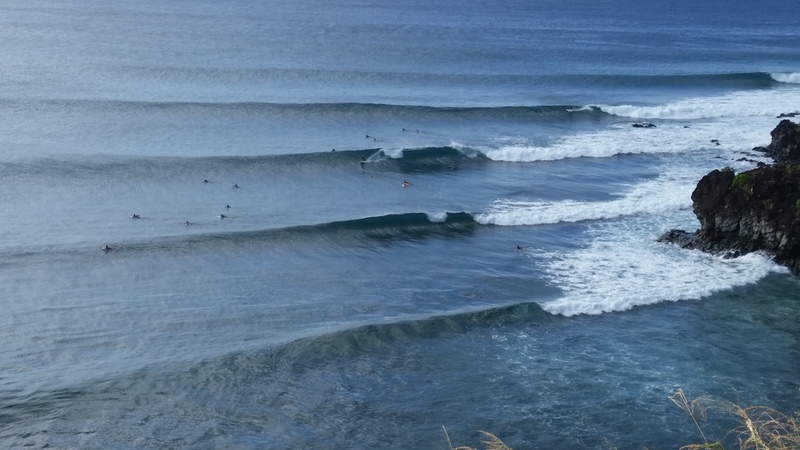 there is also terrific views of a surfing area near Lipoa Point. It was a beautiful place. 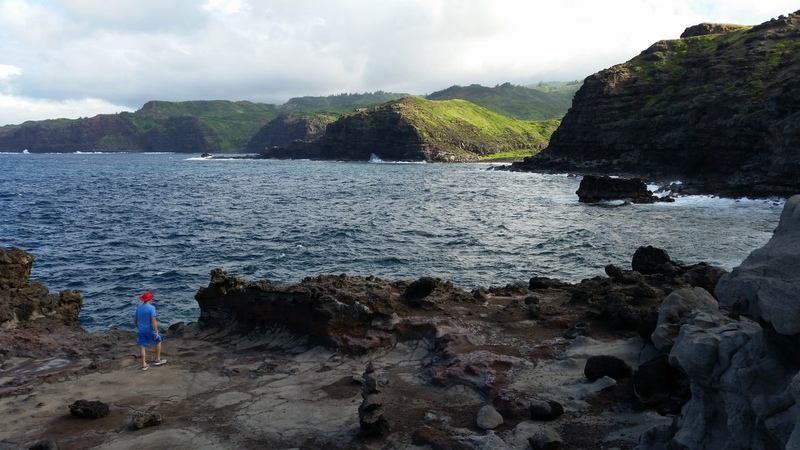 We decided to come back later in the week to snorkel at Honolua Bay then come up to this overlook afterward to have some wine and cheese and enjoy the view. 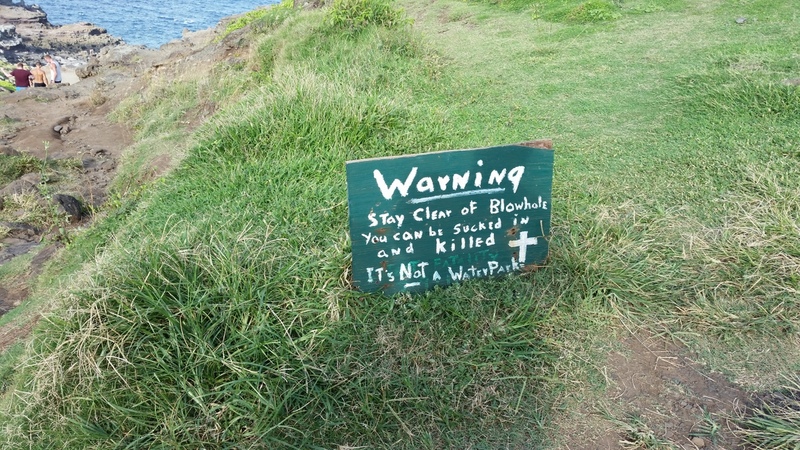 The Nakalele Point blowhole was next. As we walked down the path we came upon this very welcoming sign. It may seem a little over dramatic, but there have been people who have died at this place. Jenny and Wendy were in flip flops and decided to not go all the way down. They could see the blowhole, but Dave and I decided to go a little closer. This area is basically an outcropping of old lava. It is surreal rough terrain, but I think it was well worth the climb down. 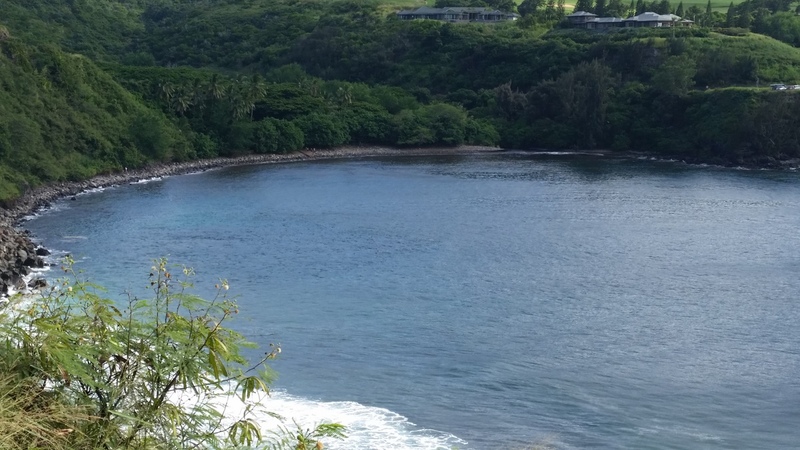 But the best view was not of the blowhole it was back toward the coastline from Nakalele Point. Jenny and I braved facing into the sun for one more picture before we headed back toward Lahaina. 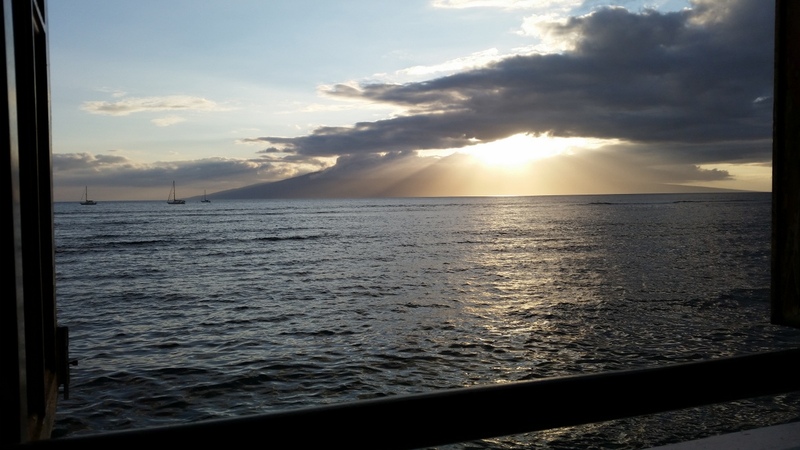 When we got back to Lahaina, it was very close to sunset. We wanted to see it while we ate, so rather than going back to condo to clean up change we just looked for parking on Front Street. The parking gods must have been on our side because we came on a parking spot only a couple blocks from the restaurant we had decided to eat at – Bubba Gumps. 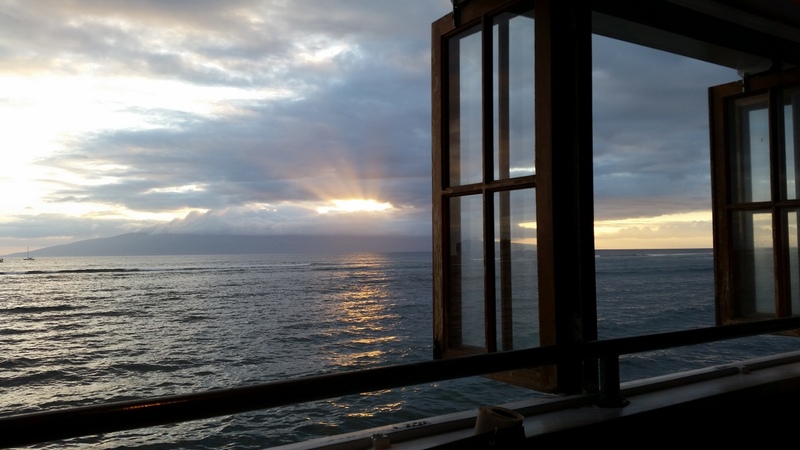 We definitely had a great view from our table of the sun setting behind the island of Lanai. As we ate dinner we decided to do the Road to Hana the next morning. 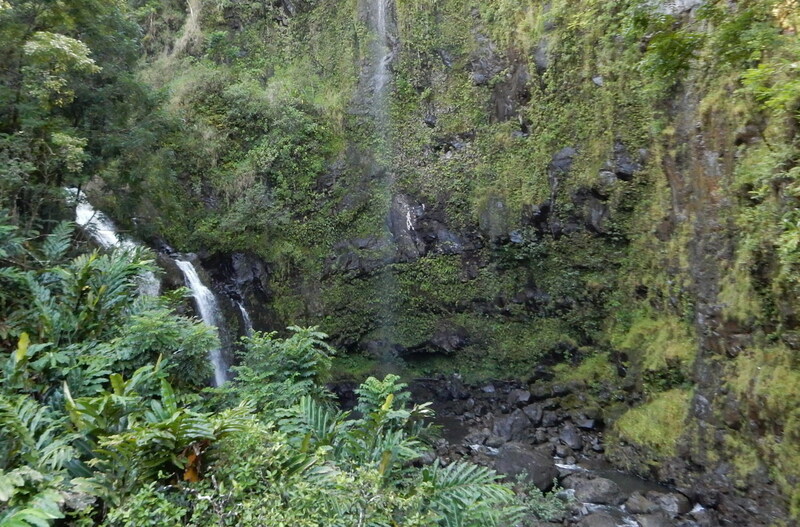 We planned to hike the Pipiwai Trail to Waimoku Falls at the end of the Road to Hana. 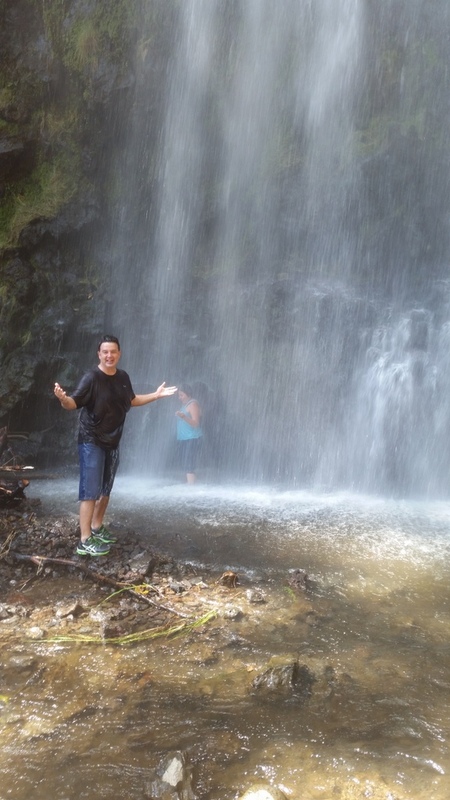 The very helpful lady at the equipment rental business had recommended that if we wanted to do this hike we should leave early and drive all the way to the end of the Road to Hana without stopping, then do any stops we wanted to do on the way back. So that was our plan at the end of our first full day in Maui. We were tired, satisfied that we had “stuffed” enough fun into this day, so after dinner we headed home to get some sleep so we could get up early for the Road to Hana! 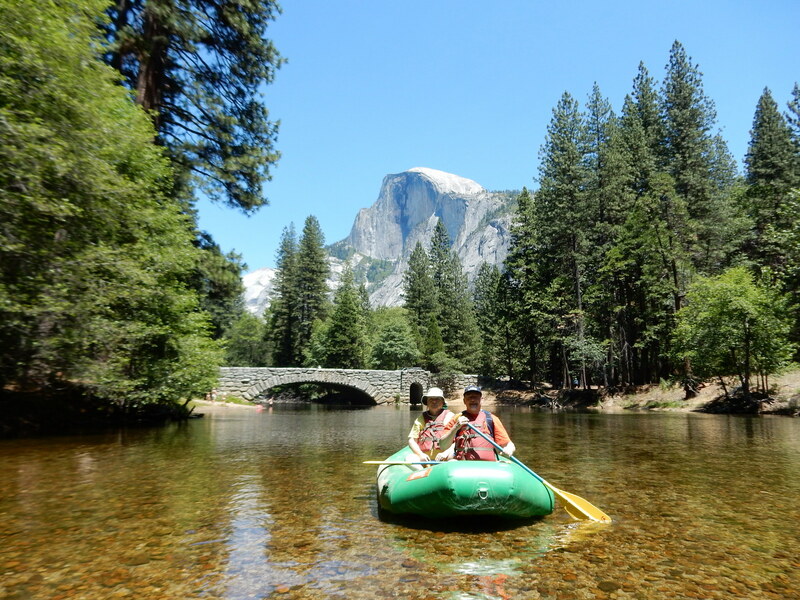 We got all settled in to our campsite in Hodgdon Meadows the day before, and decided to rent a raft to float down the Merced on our first full day in Yosemite. 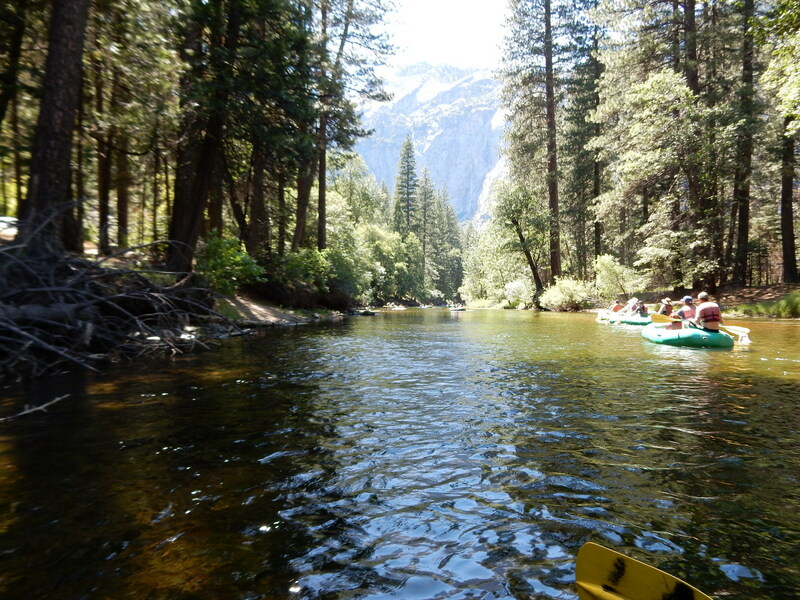 The Merced River winds lazily back and forth along the valley floor. It’s a relaxing way to spend a few hours and take in a ton of great views along the way. In 2010 we brought our own raft. 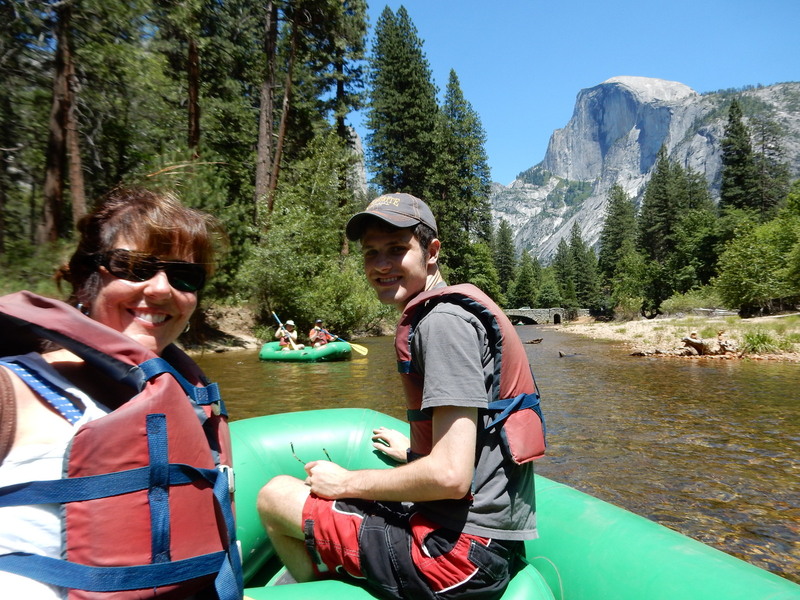 Although we saved some money on the ride, because we rafted on one of the busiest days of the year, July 4th, the logistics of two cars and moving the raft were not really worth the savings. 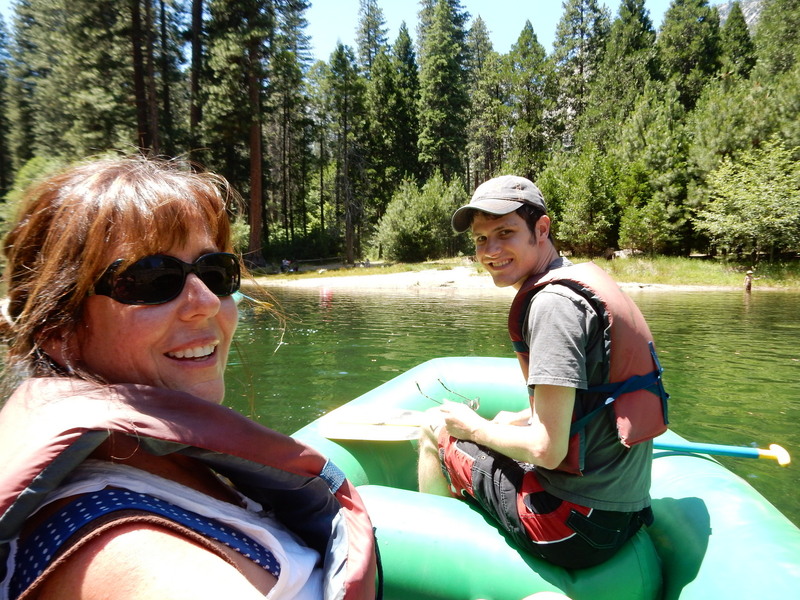 This time we rented a raft. They charge per person, not per raft, so don’t feel the need to crowd into one raft. We had 2-4 people per raft, which worked just fine. Carrying the raft to the launch point is the most work you’ll do for the next few hours. 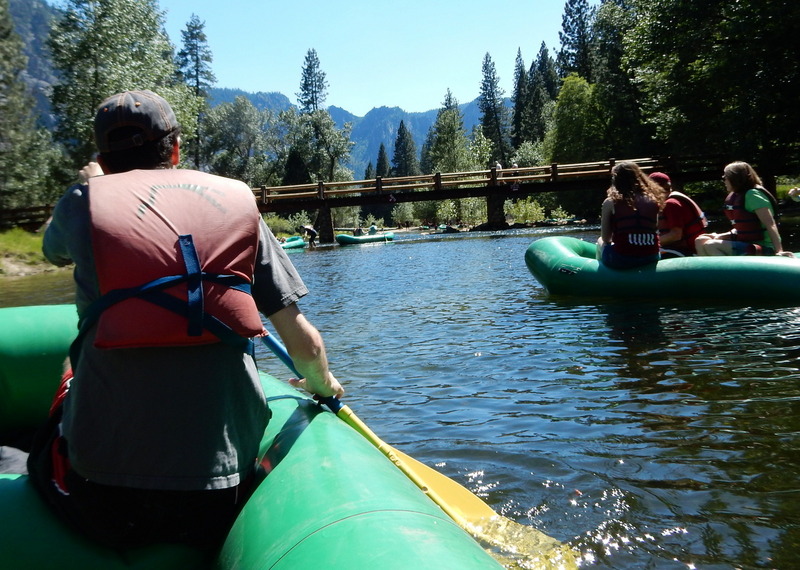 Once you get to the river, one of the employees for the raft rental company will give you a hand launching the raft. Randy, Ellen, Brian, and Haley were in the first boat. Stacy, Katie, and Candice were next and then we put our boat in. 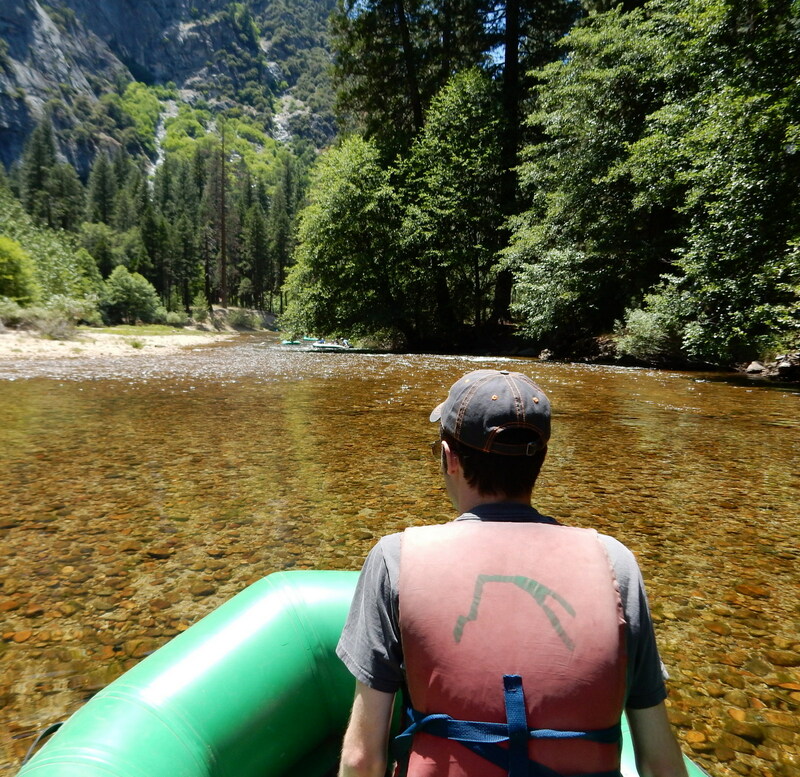 There are no rapids, no big hazards, and very little shade on this float. Be ready to relax and put on plenty of sunscreen! John and Brad were in the last boat into the water. 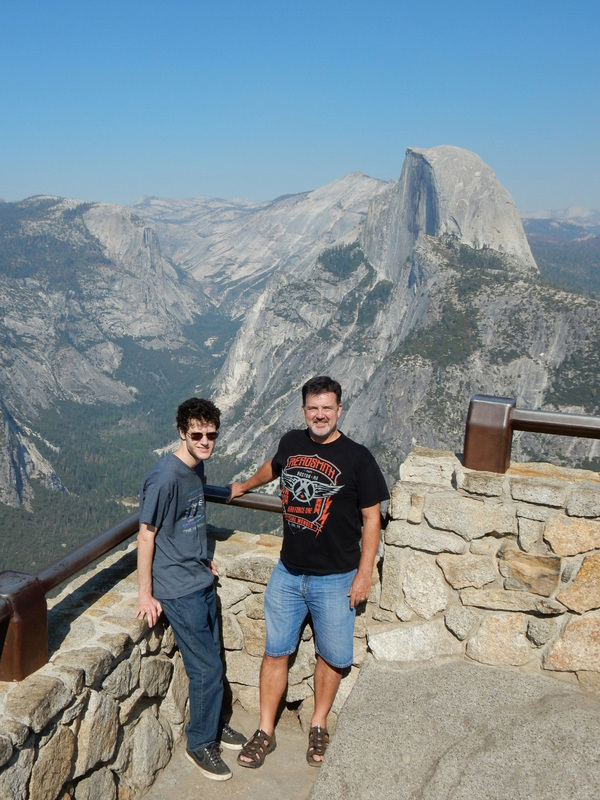 The view of Half Dome behind them is just a bonus! 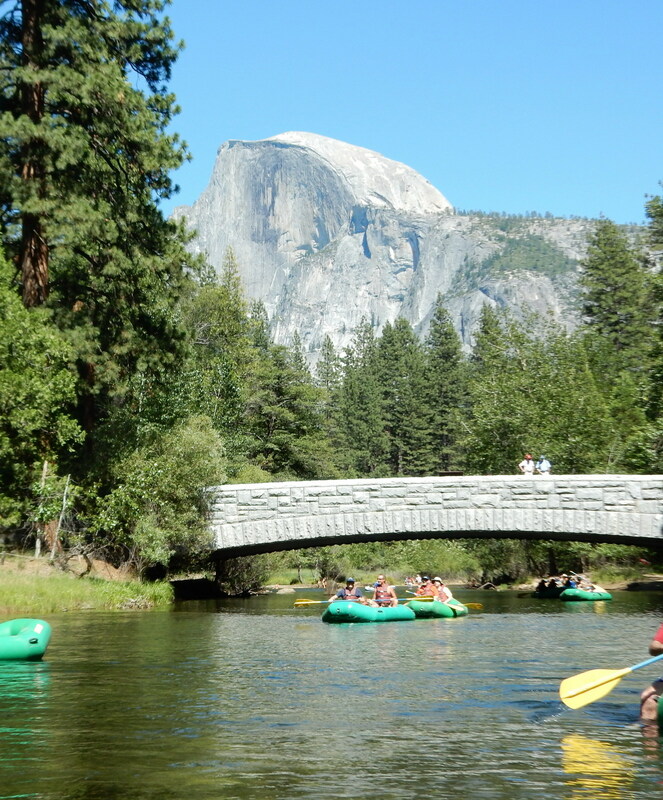 Actually there are views of either Half Dome or Yosemite Falls at different points all along the float. 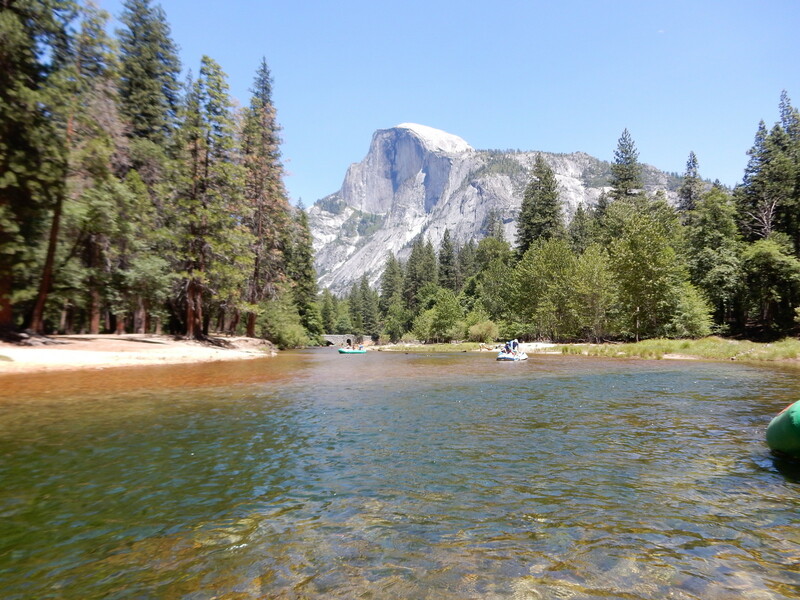 Even though it was a busy weekend in Yosemite, the river wasn’t overly crowded. We got started about 10:30 AM and finished before 1:00 PM. 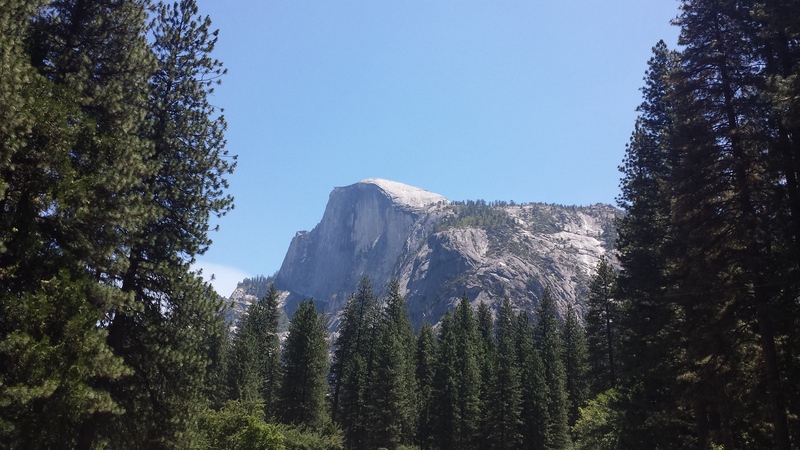 I snapped one more picture of Half Dome just a little ways from the launch point. 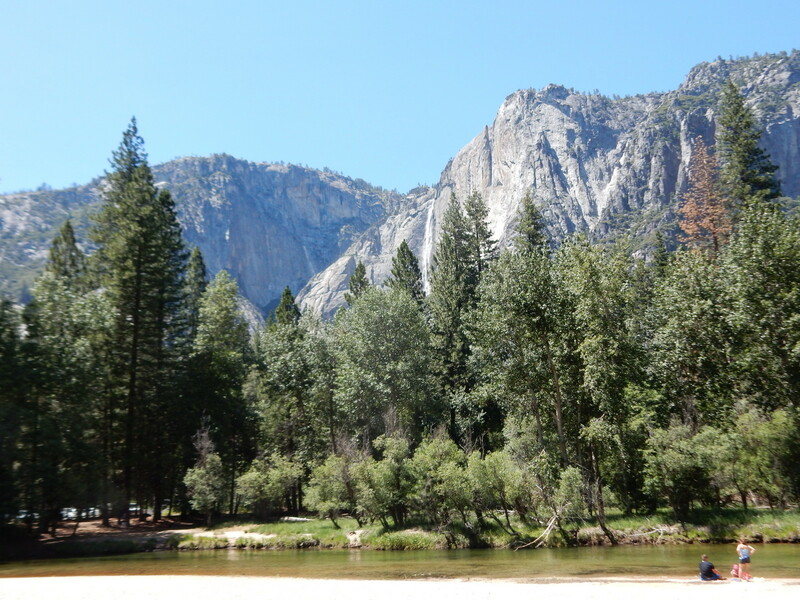 Due to a lack of snow and an extended drought in California, the river was very low for this early in the year. That was another good reason not to overload the boats. We got our first glimpse of Upper Yosemite Falls about 30 minutes into the float. 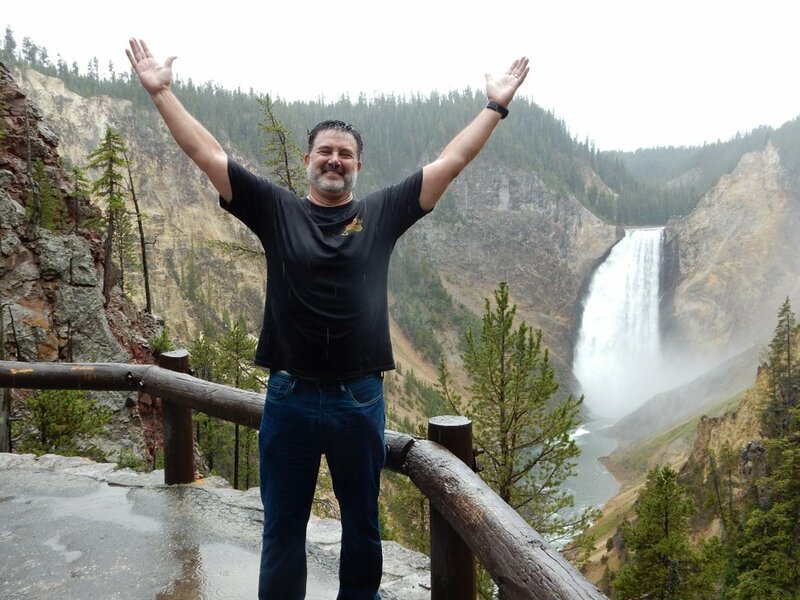 Don’t pass up a good picture of the falls, but don’t worry about missing them either. The river meanders quite a bit and just when you think you have passed seeing them, there they are again! Sean got plenty of practice rowing/steering the raft. And I got lots of rest! We pulled over lunch around 11 at a beach by House Keeping Camp. This place was perfect for lunch. There was a nice beach, some shade, and bathrooms! We ate lunch under some interesting looking trees. 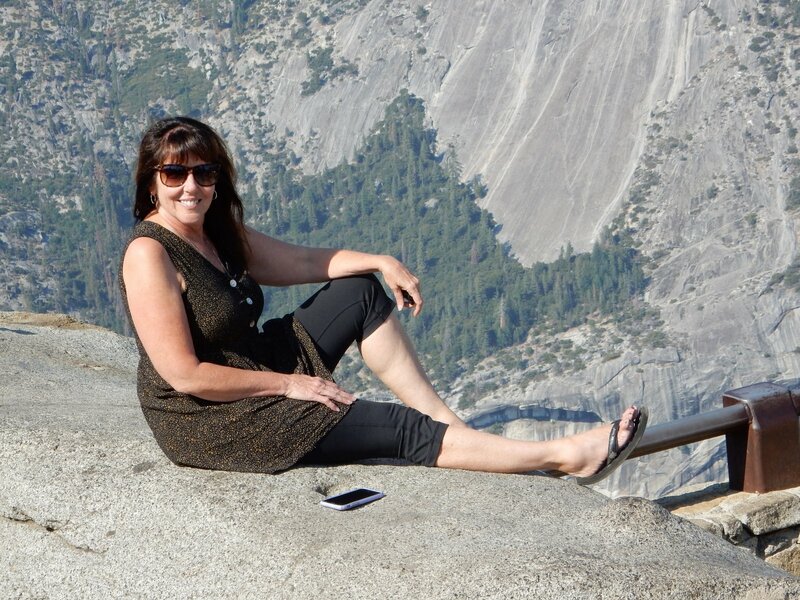 And we had a great view of Yosemite Falls. 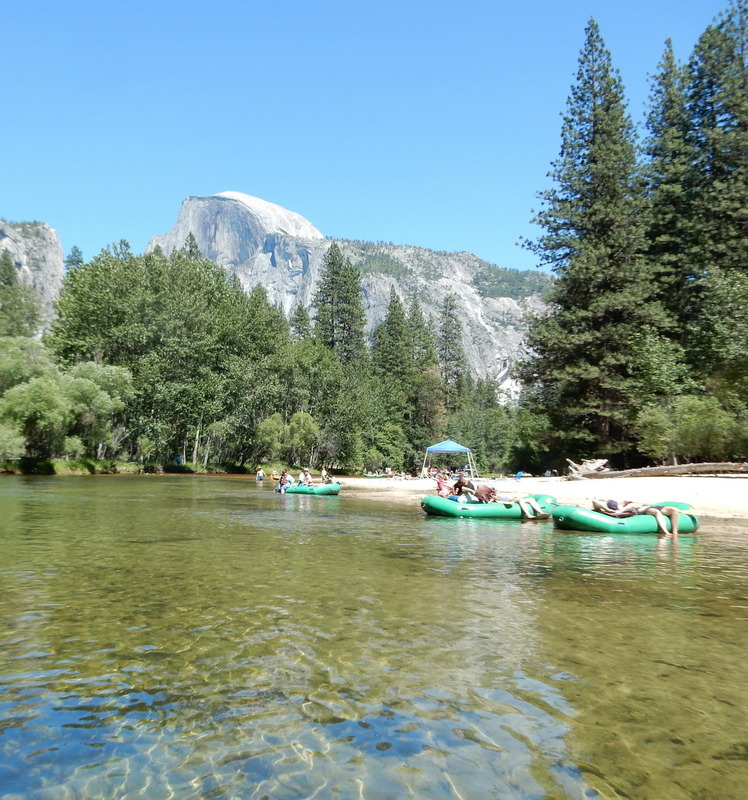 After lunch as we pulled away from the beach I got another view of Half Dome and some people enjoying the beach, the river, and even one guy sleeping in the raft. Most of the rest of the float was about the same. Lots of smiles to go around. 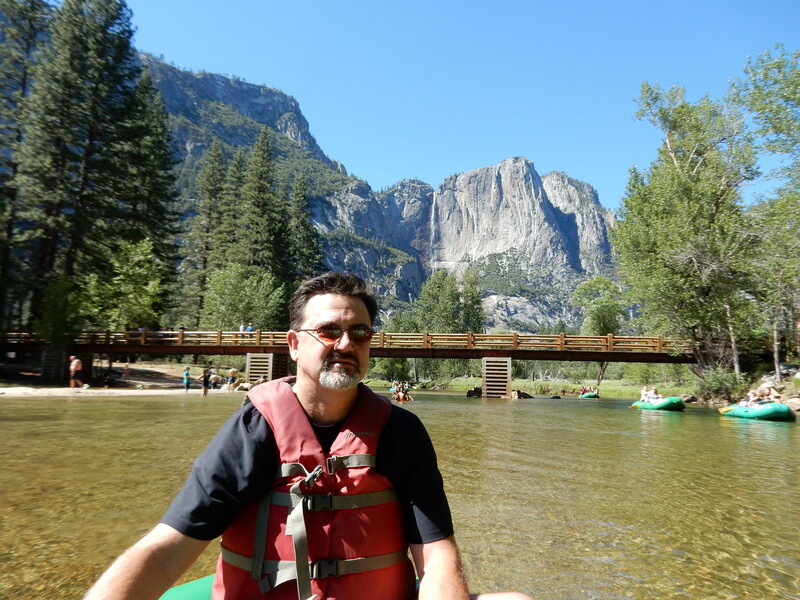 Plenty of relaxing and the beautiful Yosemite Valley all around. At the end of the float the rental company loaded the raft onto a truck we got on a bus, and headed back to our cars. This is definitely the way to do this! After rafting we stopped at Yosemite Village to call to check on the daily Half Dome Hike permit lottery. Not our lucky day. Since we would not be hiking to the top of Half Dome, we decided to stick together as a group again, but to be a little more ambitious and hike to the top of Vernal Falls. 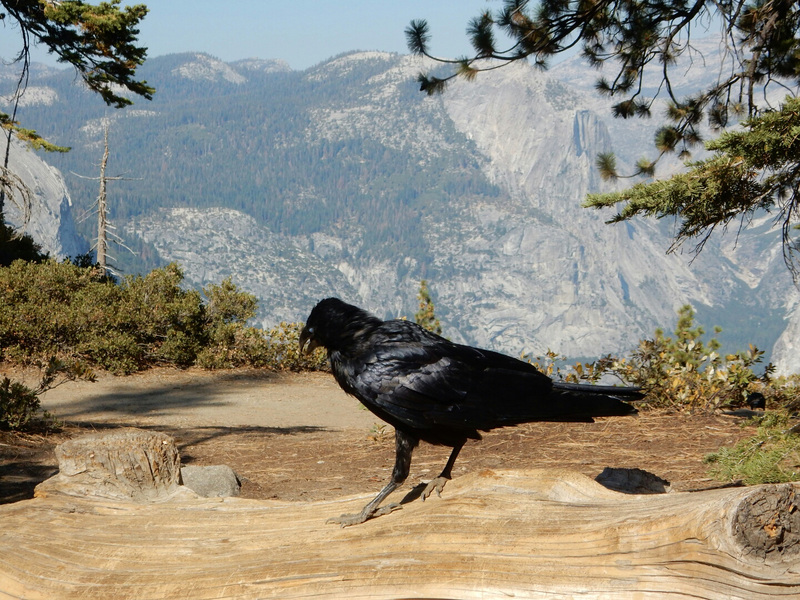 I’ll add another post soon to share our hike and the rest of our visit to Yosemite. Here are some more pictures from this awesome river! A trip to Yosemite is never disappointing! 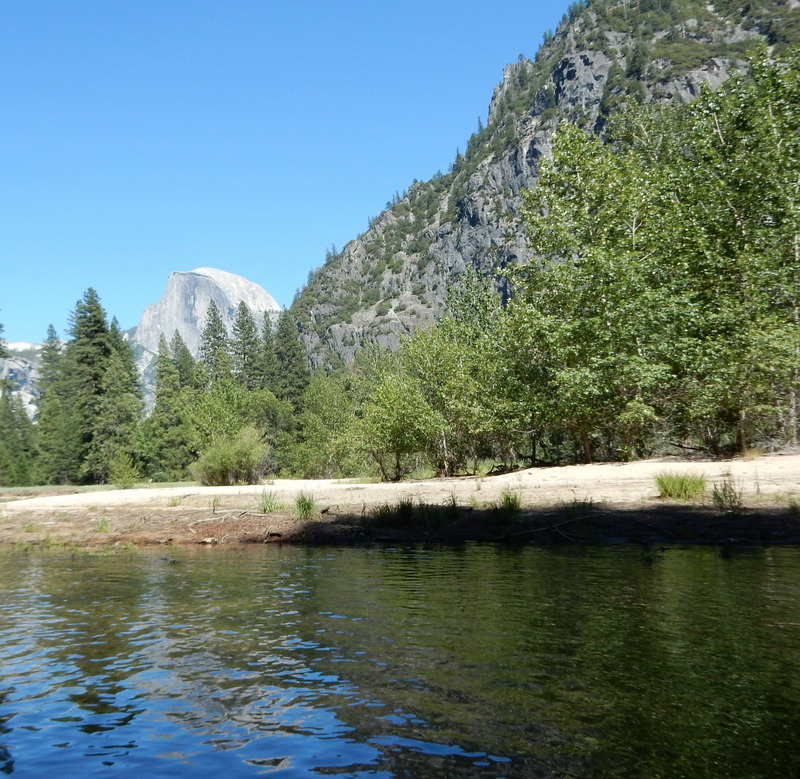 Some trips might be disappointing if they don’t go according to plan, but Yosemite is different, it is just too much of a special place to ever be disappointing. 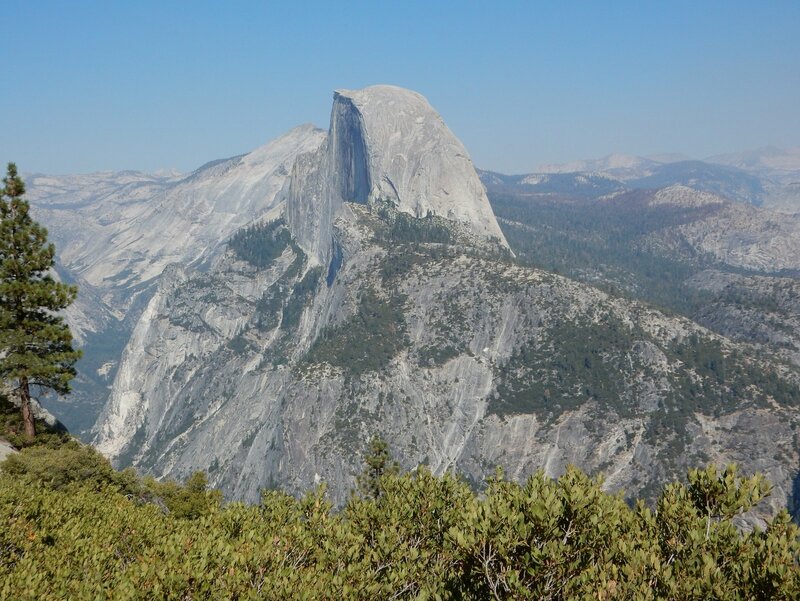 We had hoped to hike to Half Dome from the valley as part of this trip, but we didn’t get permits as part of the seasonal lottery or as part of daily lotteries while we were in Yosemite, but this just freed us up to do other things, with everyone in our group. 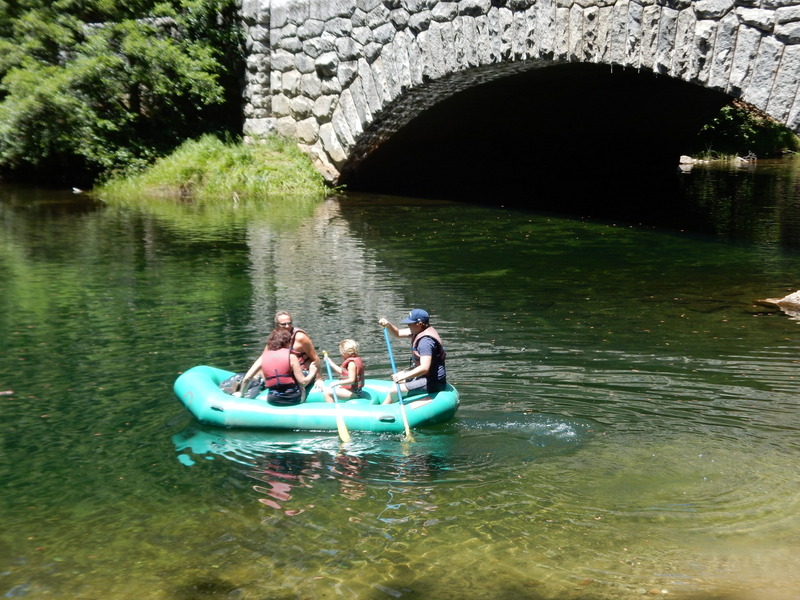 We had also originally planned this as a chance to get our kids all together for a vacation, camping seemed like a good way to be flexible and low-cost. However, that didn’t work out either. When you have a big family it is hard to plan a group vacation. Last year the local beach staycation worked like a charm. All our kids made it to the condo we rented to stay for at least one night. This year college, work, moving, babies, and pending marriages (yeah!) made it hard for our kids to commit and in the end none of them could make it. We’re not giving up on a trip like that, it just didn’t happen this year. 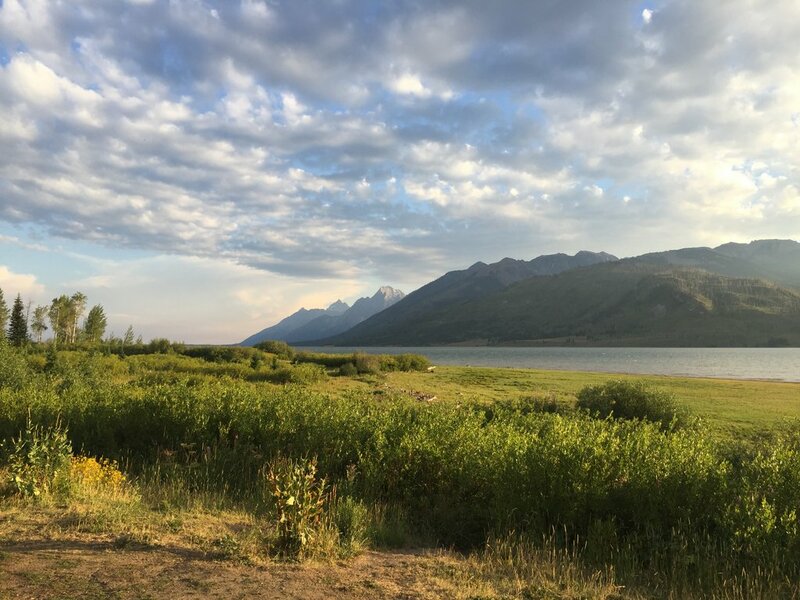 However, we had opened the trip up to other family and friends and we had quite a large group (12) squeezed into two of our 3 reserved campsites, and our food and coolers spilled into the bear locker of the 3rd campsite. 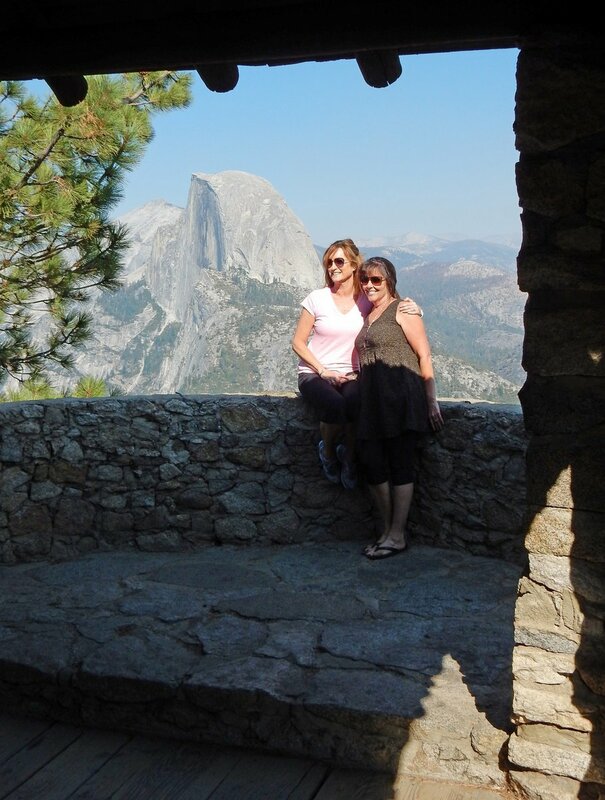 We started our drive to Yosemite in a caravan from San Diego with Jenny’s good friend Stacy, her daughter Katie and Katie’s friend Cadence on the 20th of June and stayed in a hotel in Fresno for the night. This made it possible to get to Yosemite fairly early in the day on the 21st. We came into the park from the south, near the Mariposa grove of Sequoia. I’ve never been to this grove of Sequoia, but now that they closed the parking lot and bus people from Wawona, I’m not sure when I will ever see them. It is very inconvenient. Especially when there are so many other things to see and do. Maybe if we visit in the winter when it is less busy we’ll be able to see them. We made the obligatory stop at Tunnel View. 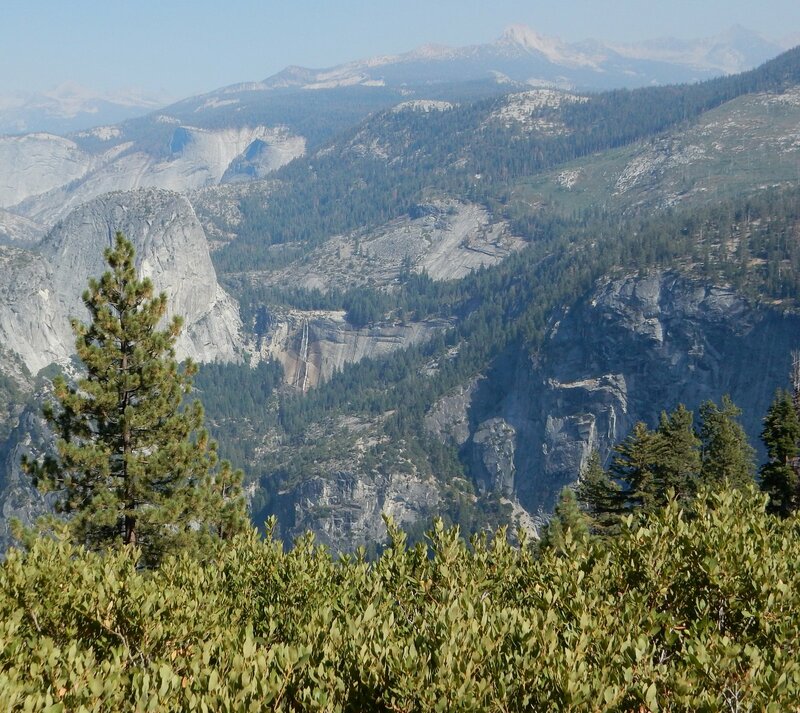 I love seeing Yosemite Valley from here. I’m hoping one day I’ll be here right after a rain when the air is clear and crisp. Even with a little haze this view is inspiring! We had plenty of time so we decided to drive through the valley and spend a little time there before heading to our campsite in Hodgdon Meadows. Our first stop was at Bridal Veil falls. 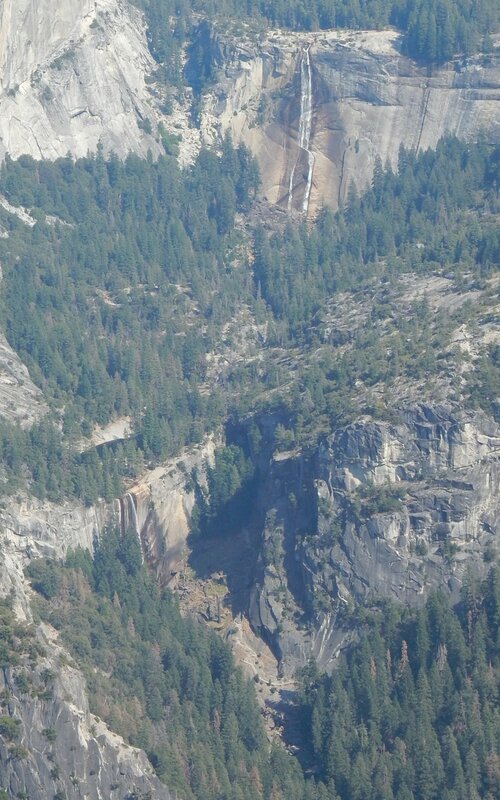 This falls is visible from tunnel view and we could tell that it was barely flowing. 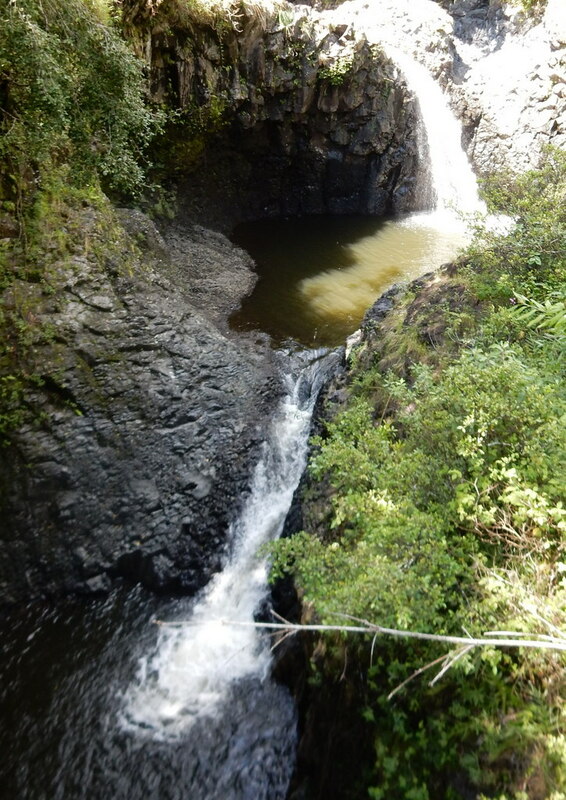 This is one of the first falls to dry up in the summer. With the lack of snow in the mountains we were lucky there was any flow at all in June. The parking lot was completely full with a line of cars waiting for spots, but we managed to get a couple of spots after only waiting about 15 minutes. 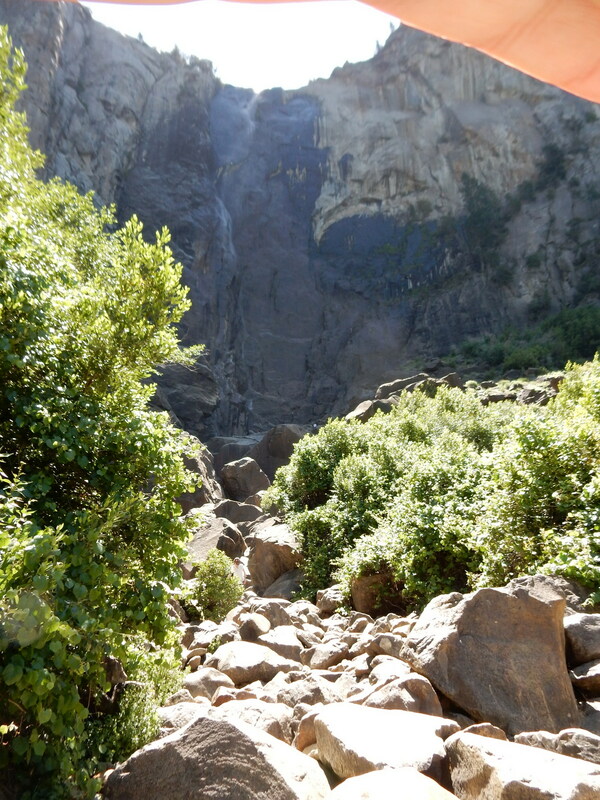 This was my first time to actually walk up to see Bridal Veil falls closer. The trail is short, not too steep, and shady. The falls were a bit of a disappointment… really more of a mist that a falls at this point. Also the sun was just above the falls from the view-point so it was hard to get a picture. I put my hand over the lens to prevent glare on the lens. I thought I would be able to crop my finger out later, but decided to keep all of the view including my hand in this photo. I’ll definitely have to revisit these falls later in the evening when the sun is in a better place and at a time of the year when there is more water flowing! We headed over to Curry Village when we got back to our cars. The traffic was OK, but the valley was very busy. Luckily there is a large parking lot by Curry Village. We found parking with only one loop through the lot. 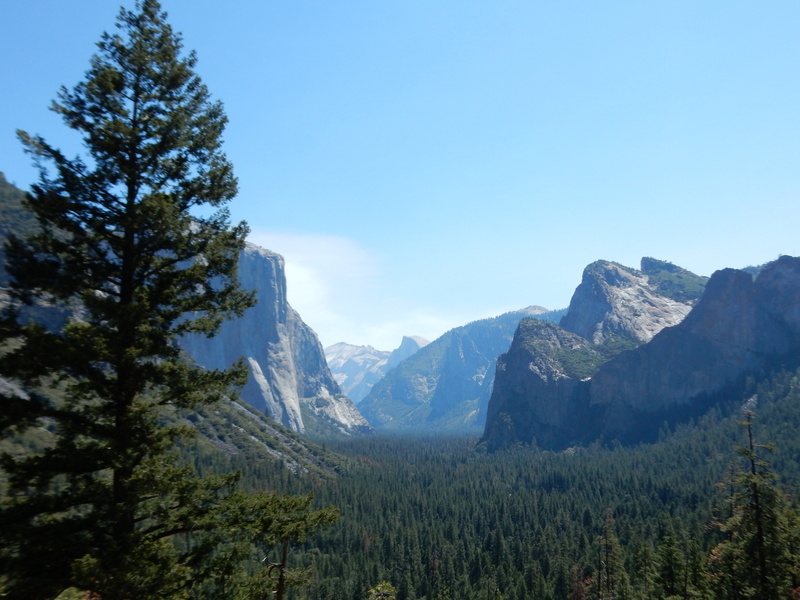 The Curry Village area is in a beautiful part of the park with views of the nearby granite walls and of the Half Dome. It took a few minutes to find the ice cream parlor. It is kind of tucked in around a corner in the main cafeteria. It was worth the wait! We looked around the gift shop before heading to camp to set up. We had reservations at a campground outside the valley. 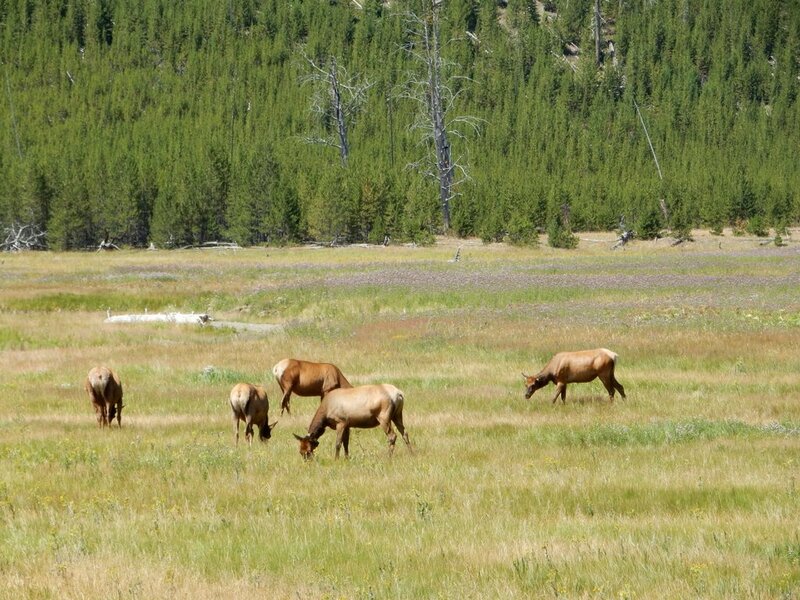 I stayed in the same campground, Hodgdon Meadows, during my trip to Yosemite in July of 2010. In fact 2 of our 3 campsites were right next to the site we stayed in 2010. 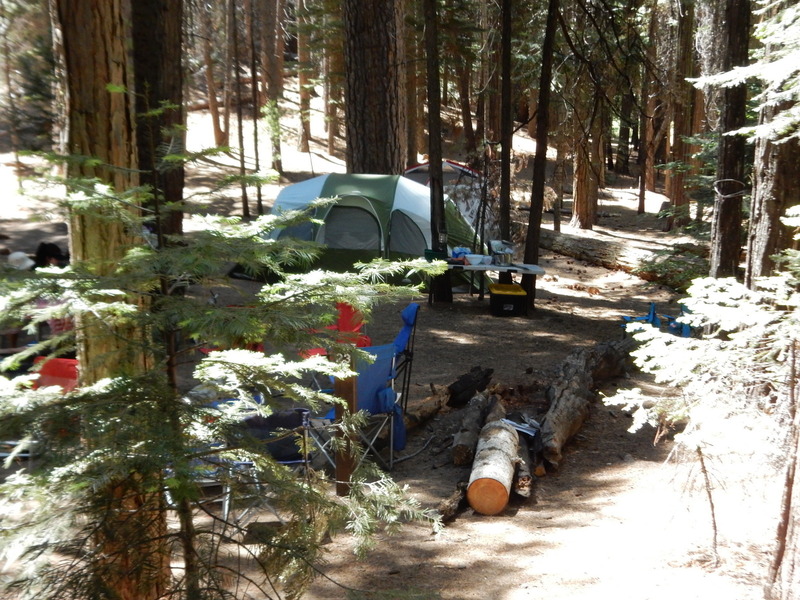 Although that campsite, site 22, is on a slope, there is large level area on the lower level of the campsite. I really enjoyed Hodgdon Meadow in 2010 and it was good again this time, but there were a couple of things. First there was a major fire, the Rim Fire, in the North Part of Yosemite in 2013 that damaged large swaths of the forest on the road between Hodgdon Meadows and the valley. Second, I had not noticed the slope of the campsites as much in 2010. There are some level sites in the middle of the campgrounds, but on the outer edge where we wanted to be, many of the sites are on slopes. On one of our two campsites that we had for the whole week we were barely able to set up one small tent. Even that tent was not on a very level spot. 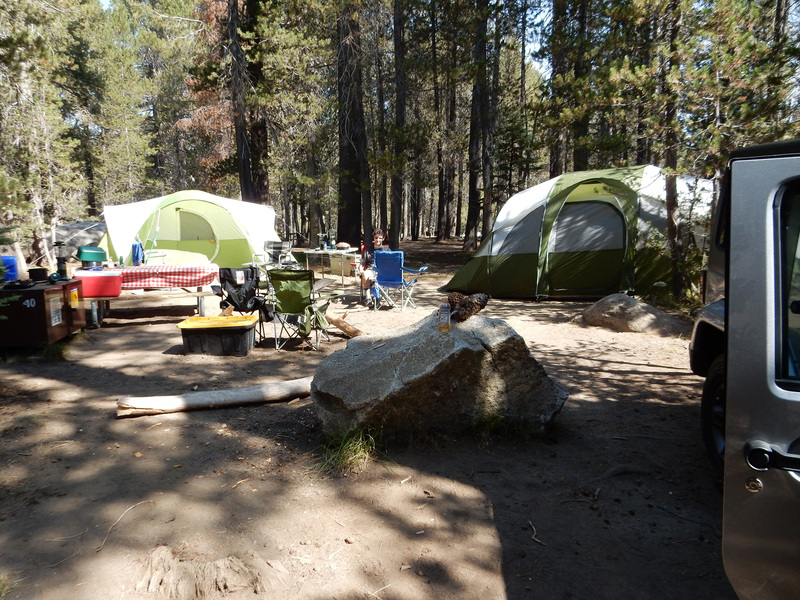 Luckily the other site was closer to the bottom of the slope, so we spread out and were able to set up 3 fairly large tents on this campsite. A couple of months before this trip the inflatable mattress we normally used sprung a leak. I had repaired it, and it seemed to hold air fairly well, but I decided to bring some backups. As I was going through our combined camping gear, I found that my wife had a double height queen sized mattress. It seemed to be a good quality mattress, so I decided to use that and keep the repaired mattress as the backup. We had a couple of flannel lined sleeping bags zipped together for bedding, but I also like to put a fitted sheet on the mattress for extra comfort when car camping. I was setting up my son’s bed when my wife started laughing. Apparently I had brought a dust ruffle instead of a fitted sheet! On the double height mattress, it made our setup very homey! When Jenny showed it to our sister-in-law Ellen, she had a good laugh too and asked where our chandelier was! We enjoyed a very easy dinner of sloppy joes on the first night and had a great fire. One of the best parts of camping for me is sitting around the campfire, having a few adult beverages, and sharing the experience with friends and family. At bed time we got a less than happy surprise. The double height mattress was not as firm as when we set it up. We were pretty tired though, so we decided that it must be “because it was colder” than when we set it up. So we climbed in and were asleep in minutes. About 2 hours later we woke up to an even worse situation. The mattress definitely had a slow leak. With a normal air mattress when you have a slow leak you slowly get to the point where you feel the ground. With the double height mattress, we were still well above the ground, but we had both slid toward the middle of the mattress. We were in a deep rut/crevasse in the center of the mattress and completely squished together! It was a very uncomfortable situation – definitely not going to work! It was the middle of the night, but I decided to get out the spare mattress so we could sleep through the rest of the night. In the morning while getting coffee going I notice a pair of what looked like red-headed woodpeckers on the trees near our campsite. I grabbed my camera and followed them around until I was able to get this shot. Once we got home I did a little research to try to identify the birds. 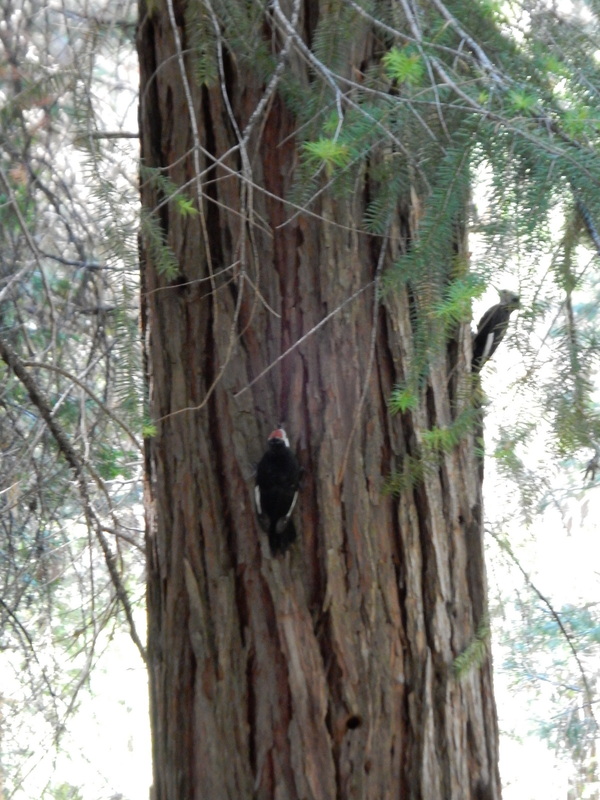 My best guess is that they are Acorn Woodpeckers, which are found in that area. 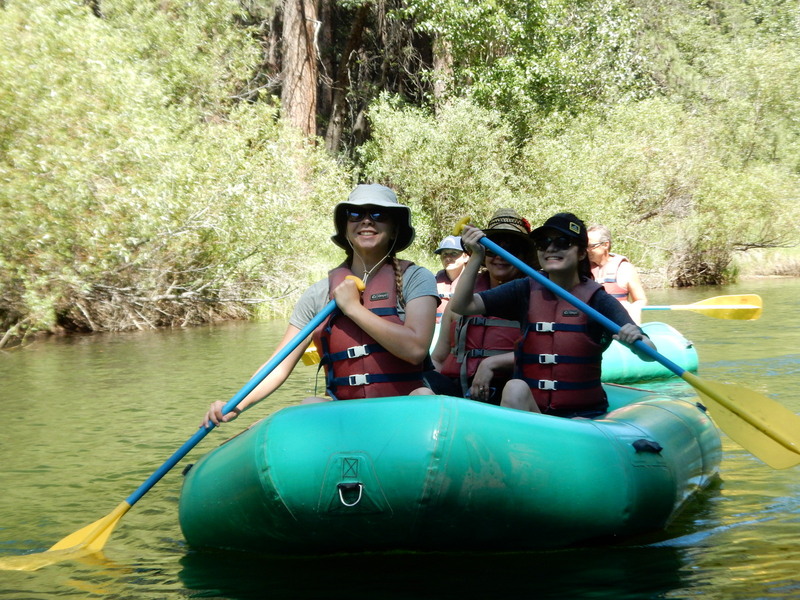 We decided as a group to float down the Merced on our first full day together. 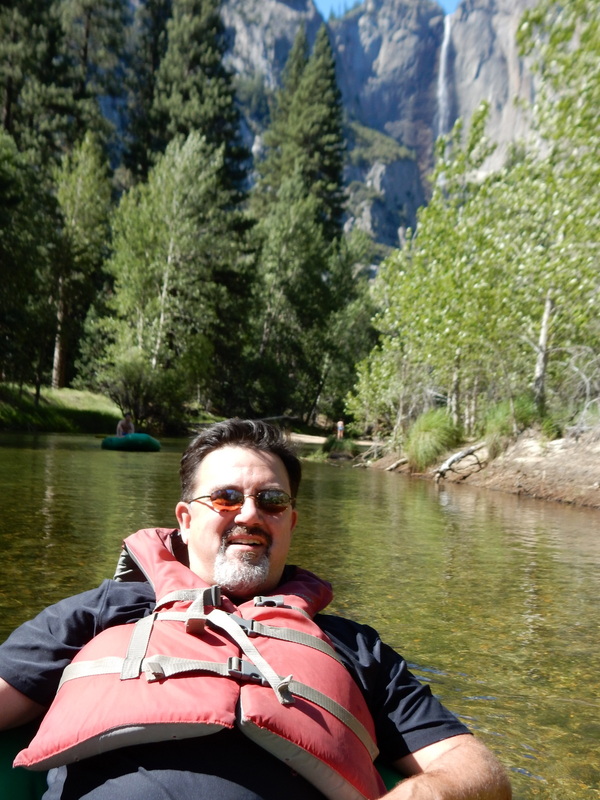 This is the second time I’ve rafted (floated) down the Merced. The views are amazing and I got tons of pictures. I’ll put the Merced float in my next post in this series. We had already planned to schedule fewer vacations in 2015. We ended up having to turn down opportunities to do things with friends and family because we were so busy in 2014. Then early this year, I changed employers and as usually happens the new job will start with fewer hours of vacation for the first few year. Luckily we had only planned a couple of vacations this year. Unfortunately, due to the new job, we might still have to turn down other opportunities. Next year I will have some hours “in the bank”, so we will be able to plan more. We are glad the two vacations we have planned are with family and friends to Yosemite this summer and with friends to Maui this fall. Although I’ll get much fewer hours of vacation the first few years, I do have an alternate work schedule that will give me every other Friday off (usually). We don’t want to plan out something for every one of those weekends… there are times when being so busy can start to seem routine. However, we will plan and do a lot more weekend getaways over the next few years than we have in the past. We live in Southern California and there are tons of things to do over a 3 day weekend. Weekend getaways are very flexible. They can be a romantic getaway or a getaway with family or friends. They can be road trips or regional flyaway trips. You can hotel it, car camp, or backpack into the wilderness over a weekend. 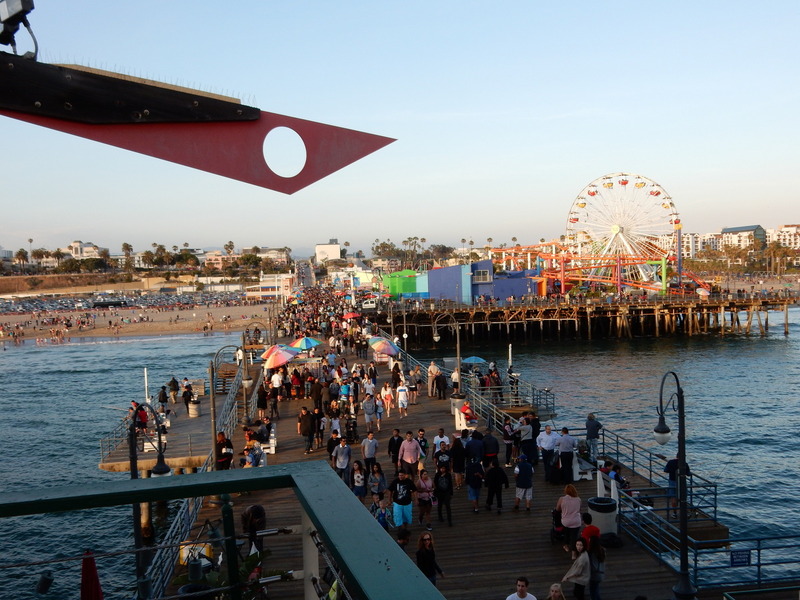 Over the past few years we’ve gone on several weekend getaways to Los Angeles, Santa Catalina, and Las Vegas. So this won’t be a new thing for us, just something we will plan to do more often. Romantic getaways are a great way for a couple to recharge their love life away from the day to day routines and distractions. Although this kind of getaway does not have to have a fancy destination or any events planned, after all the idea is to spend time together, it doesn’t hurt. 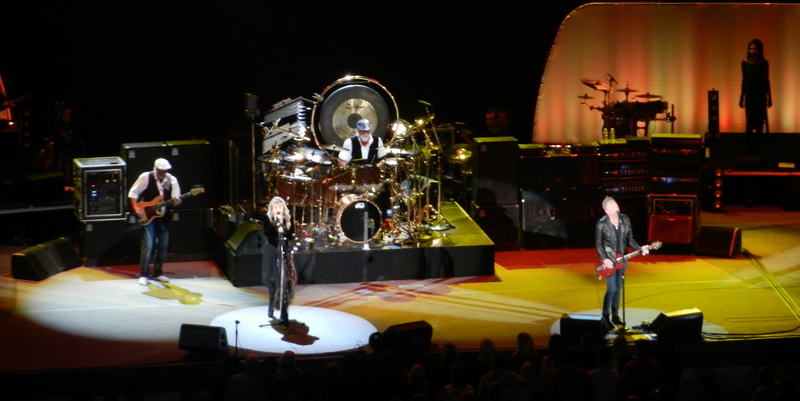 I like to plan for a romantic location and a shared experience like a play, a concert, or a unique destination. 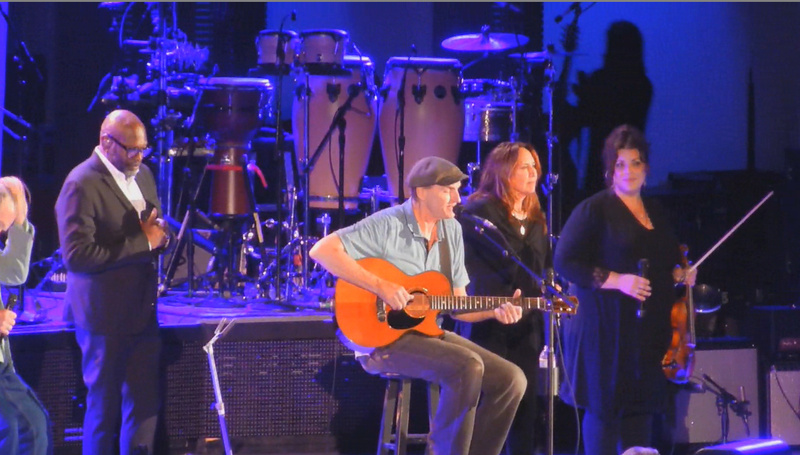 and James Taylor in 2014. There are also some great smaller venues and tons of great music throughout the year. 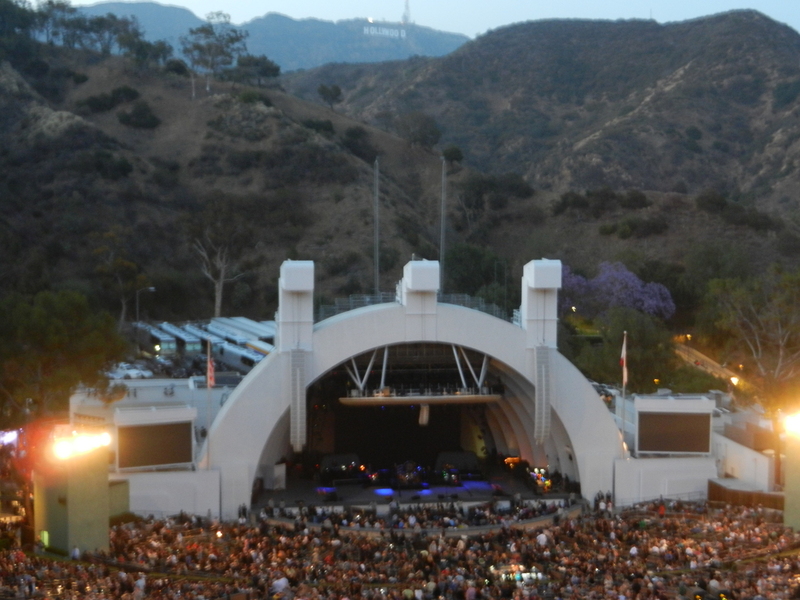 Some of these venues are iconic like the Palladium and the Greek Theater. We’ve been to the Palladium to see Sara Bareilles in December of 2011, but the Greek Theater is on the list for a future getaway (hopefully soon). 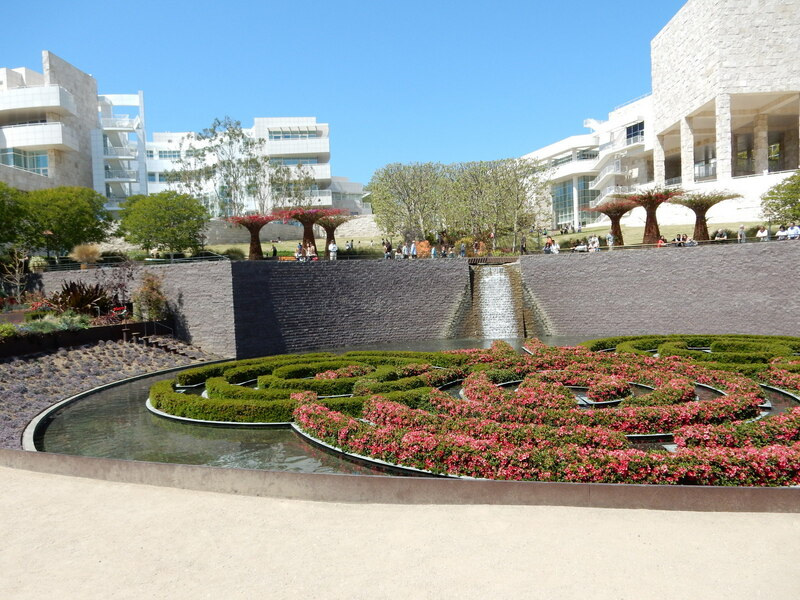 We won’t have to look too hard to find lots more to do in Los Angeles. 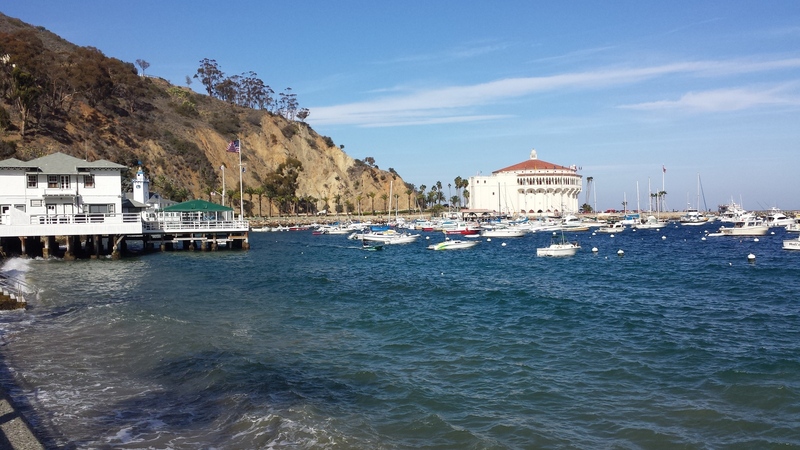 Another favorite destination for us over the past couple years has been Catalina Island. It is a quiet place, but an undeniably beautiful place to spend a romantic weekend! You can hang out in Avalon or go on tours to other parts of the island. 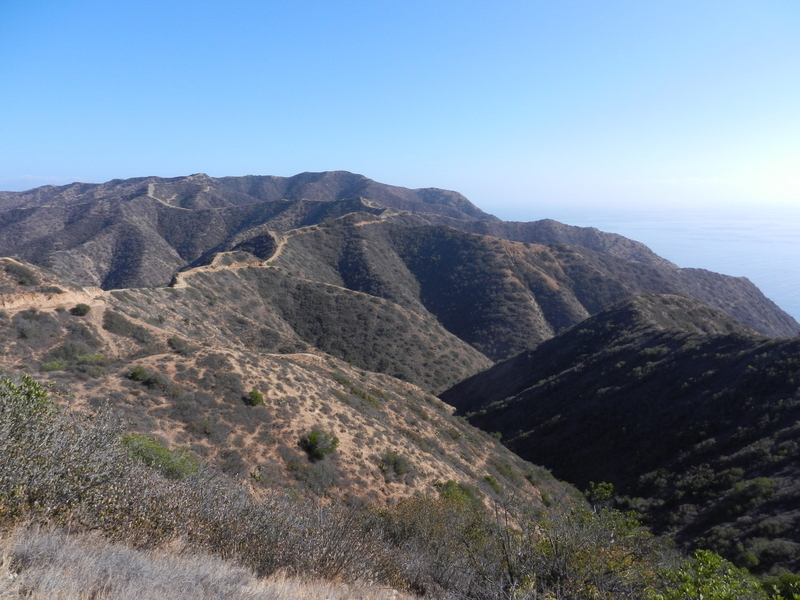 There are hiking trails near Avalon, or you can hike all the way across the island. The trails are well maintained and the views are spectacular. I would also like to spend more time touring local and not so local wine countries. For weekend getaways there are wine countries in San Diego County, a couple of areas in Riverside County, and then all along the central coast from Santa Barbara to San Francisco and California’s most famous wine countries just north of San Francisco. All of these would work for either a road trip, or a flyaway long weekend. For getaways with family and friends those same areas will work, but we also like to get out of the hotel sometimes. We’ve tried beach camping nearby, but many of the beach camping sites between San Diego and Los Angeles are very near the coastal train right of ways. Sharing the views with the trains is OK, but them sharing their noises all night long can be a problem. I guess we could try this again, but with earplugs? A little further up the coast may be a better choice. Pismo Beach has tons of fun things to do, although it may be a bit overcrowded. I’ll be doing some more research for beach camping locations that we can enjoy over a long weekend. A weekend backpacking in the mountains is a great way to getaway. 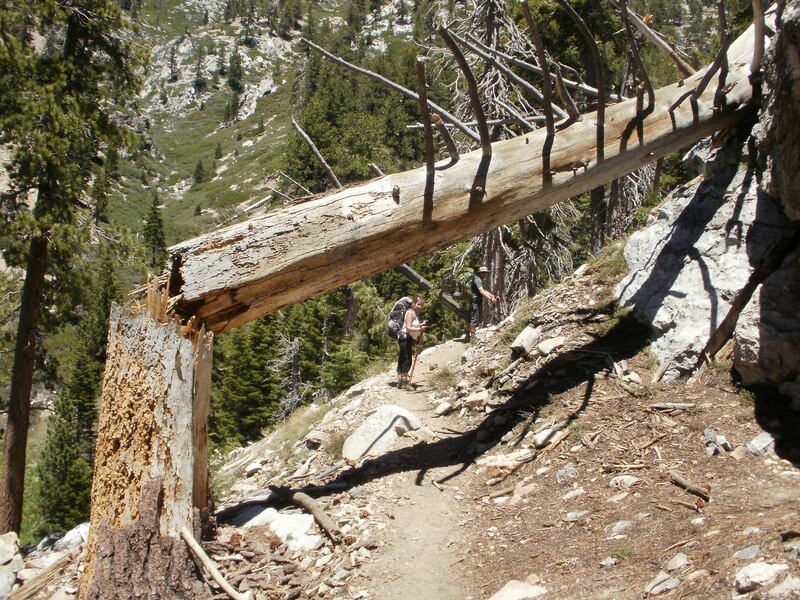 We’ve backpacked the Vivian Creek Trail on San Gorgonio a couple of times as training trips for other backpacking trips. Although we went there to train, the beauty of the place makes it worth going just to go. 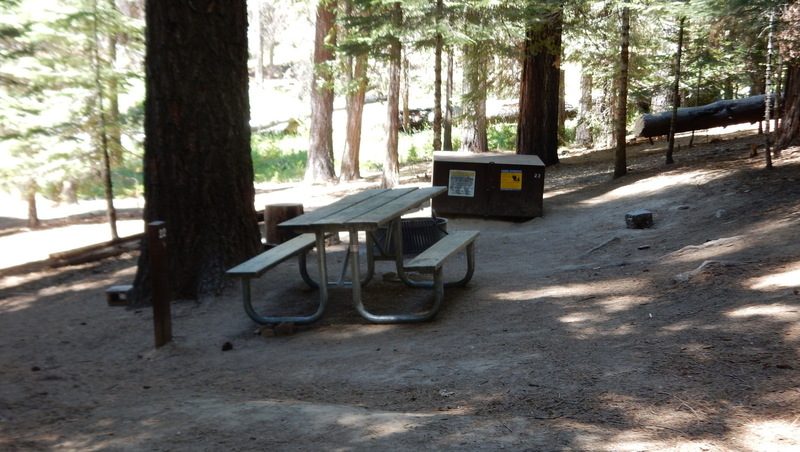 There are two campgrounds on the Vivian Creek Trail, Halfway Camp and High Creek Camp. We’ve backpacked to high creek camp twice, but either camp would work as a starting point to do an easier day hike to the summit. There are also other trails on San Gorgonio and several other Southern California mountains we could easily go backpacking on over a long weekend. There are also a few longer trails on my list of San Diego County hikes that would be better done as at least 2 day backpacking trips. Here’s a short and incomplete list of other backpacking trips I hope to checkout as weekend getaways over the next few years. Since all of our kids will be over 21 next month, Las Vegas can be a fun place for a family weekend. There are lots of good shows, good food, and more than a few good pools. None of our kids are big gamblers, so Las Vegas is fairly safe for us! Although I’ve lived in Southern California a total of 19 years, there are still many places I have yet to explore. I’m excited to start planning and taking more weekend getaways! 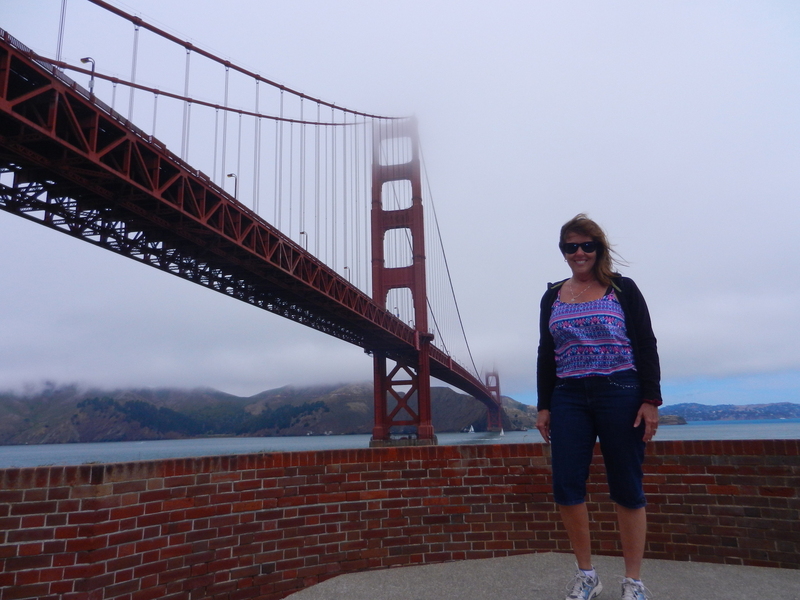 We woke to bad news on day 3 of our visit to San Francisco. Wendy’s health issue had worsened during the night. She was experiencing significant pain and even though she had some idea what the problem was and had been told it was not life threatening, she was feeling quite a bit of understandable anxiety. There was no way she would be able to enjoy herself until she knew that everything would be OK and could get the pain under control. So we made some tough choices. 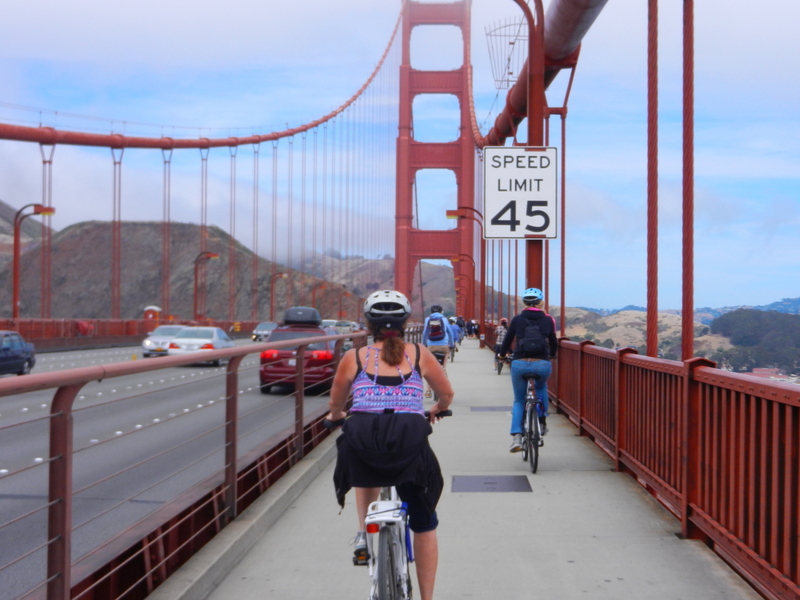 Dave and Wendy would go to the emergency room of a nearby hospital while Jenny and I went ahead with our planned bike ride across the Golden Gate Bridge. If all went well we would meet on the other side of the bay for lunch or dinner before taking the ferry back to San Francisco. We walked down the hill to the bike rental shop. I had pre-purchased the bike rental at half price on Groupon during the final planning for the trip. The deal was for the bike rental company Blazing Saddles. Although I’m no longer a big fan of daily deal sites, I do sign up for deal emails when I’m traveling to a “touristy” place. Although this saved us money, Dave and Wendy were unable to use theirs, so it was a wash overall. That is always the risk when you prepay using a daily deal site. The remaining Groupon will never expire (this is because of a California law), but I’m not sure when we will ever use it. Blazing Saddles has a very efficient operation. They started with a brief and a video describing the ride we were planning to do. They provided optional Ferry Tickets for the return trip that we could use or return with our bikes. That saved us some time later. 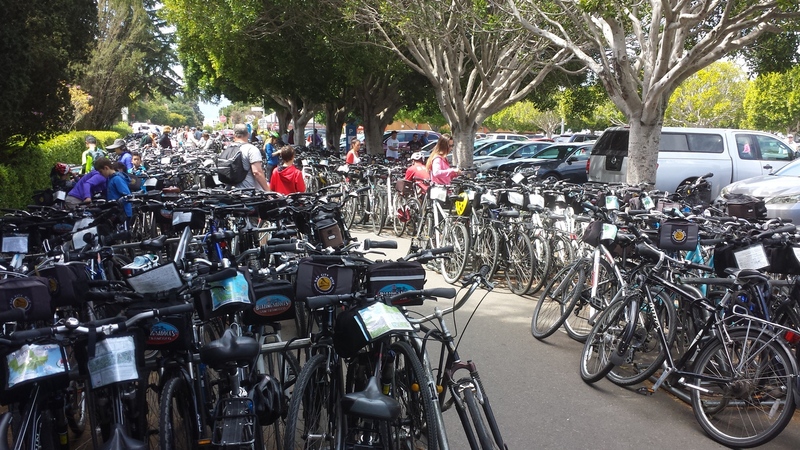 The bike issue area was also very efficient, and was well staffed with helpful folks. They helped adjust the bike and helmet to smoothly get us ready to ride. We were out the door very quickly and they reminded us on the way out how to get to the bike trail. We were told to walk our bikes down the hill past the Hyde Street Cable Car turn about, then a left on Jefferson would put us right on the San Francisco Bay Trail. The route is fairly well-marked once you get on it. Although it is mostly flat there are a couple of hills to deal with. The first hill came much sooner than we expected, about a half mile from where we started riding. Although it was a small hill there were several people walking their bikes up it. There were low clouds covering the top of the bridge. Although this a very frequently the case, I never tire of this view! One of the good things about this bike ride is that there are very few times that you are actually sharing the road with cars. There are a few stop lights though. I took advantage of one of the stop lights to snap a quick picture of Jenny with the Palace of Fine Arts in the background. 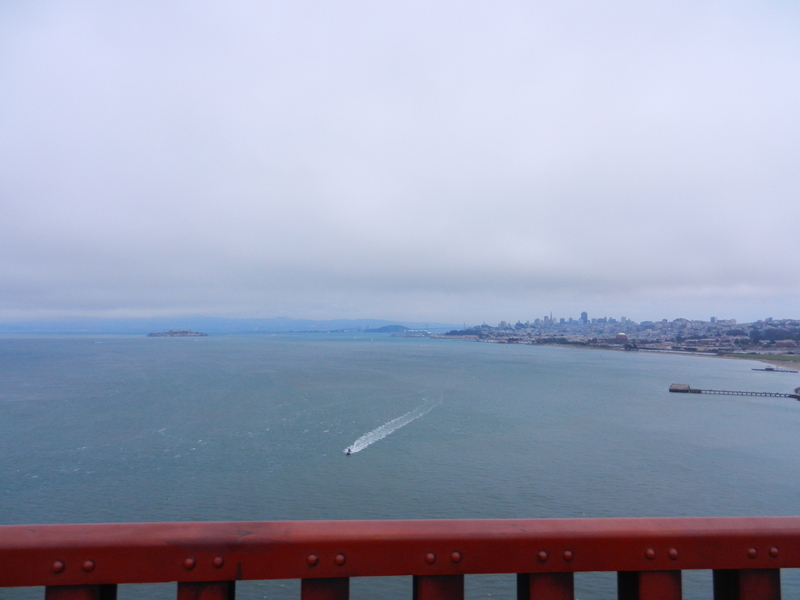 We were familiar with much of the rest of the route to the bridge because of our last visit to San Francisco in 2012. 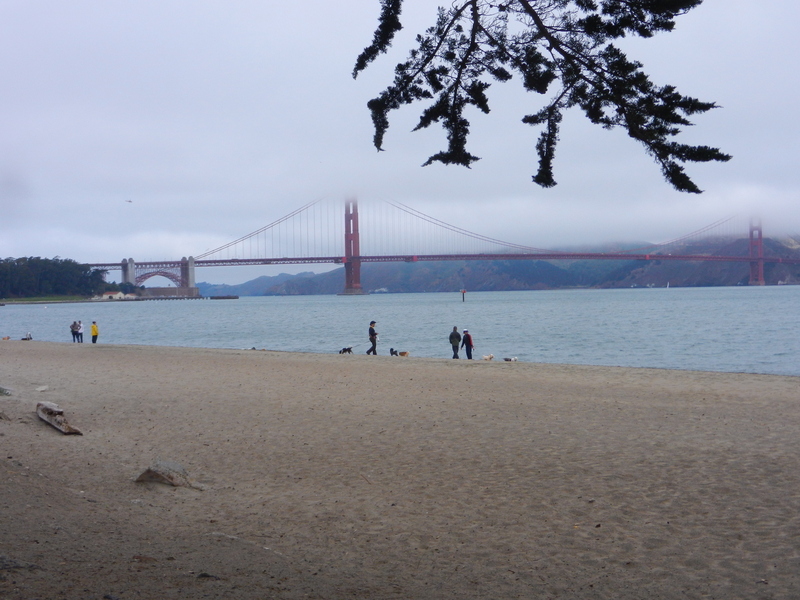 Crissy Field has awesome views of the bay and the Golden Gate Bridge. Today we rode most of the way through this area but couldn’t resist stopping for one picture under a small group of trees near the beach. 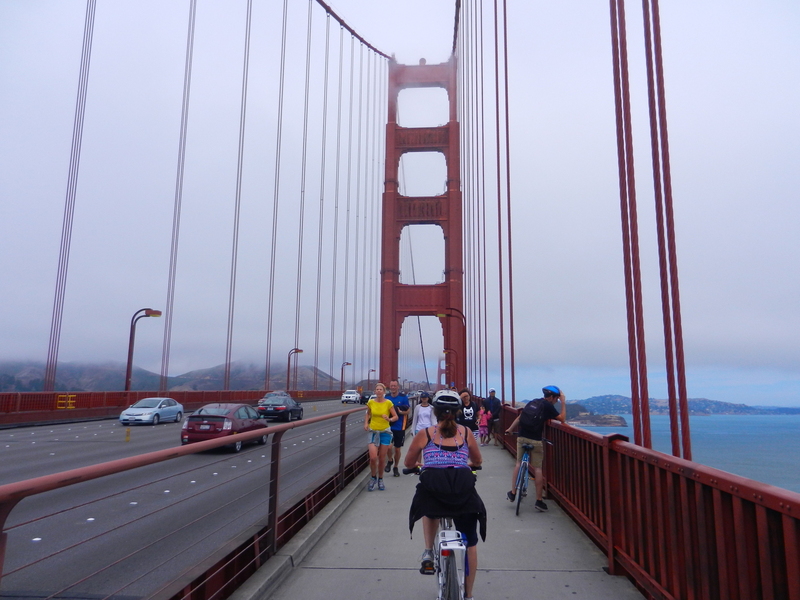 We realized when we were planning this ride that the ride across the bridge would be only a small part of the bike ride, so we were open to opportunities to see other things along the way. 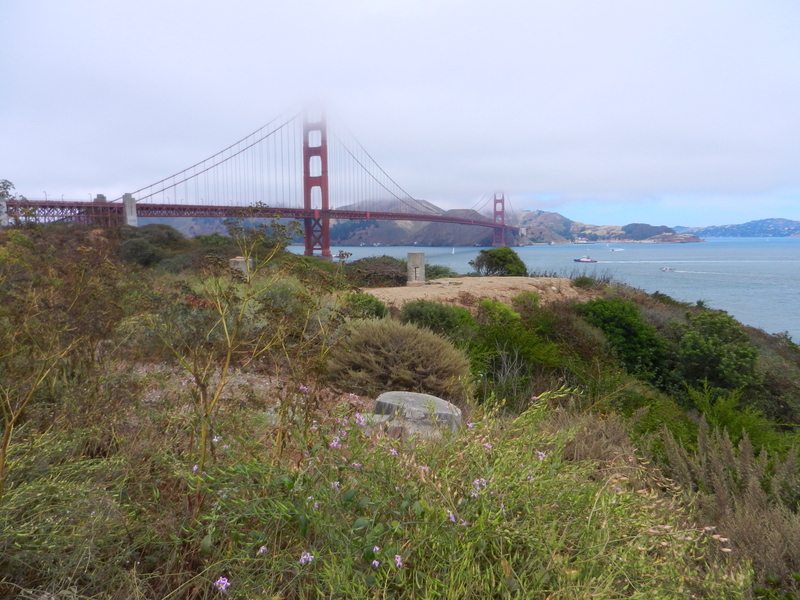 Before we headed up the hill to cross the bridge we decided to take a small detour to Fort Point, a Civil War era fortress built to defend the Golden Gate bay entrance. The Bridge is actually built right over the top of the fort, preserving a unique and interesting bit of history. We actually didn’t decide to go into the fort right away. Jenny got this picture of me on the rocks just outside the fort. The rocks protect the seawall from erosion by the rough waters near the entrance to the bay. We got an update from Dave on their progress (slow) and decided we would have time to do a quick walk through of the fort. Fort Point is run by the National Parks Service. 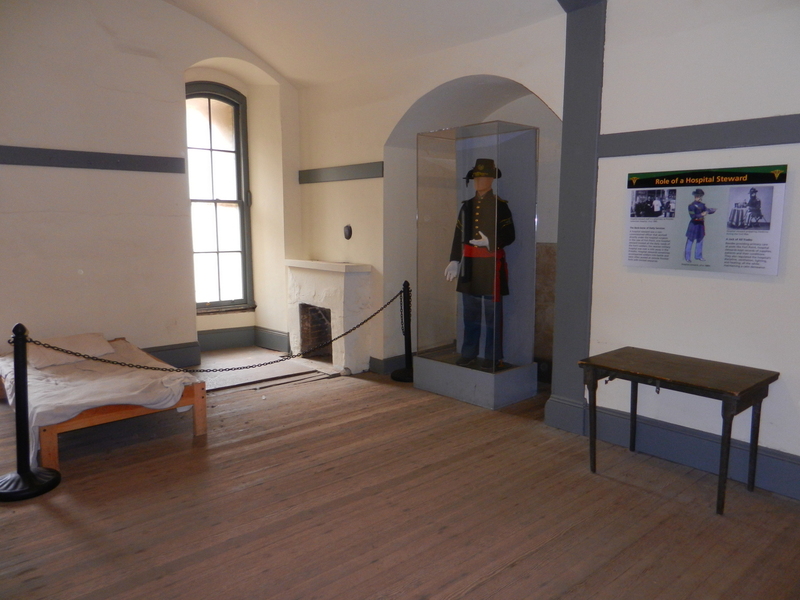 It is completely free to enter the fort and all the activities there are free as well. We headed right for stairs to the top-level of the fort for the best views. There is a large courtyard in the center of the fort and several cannon mounting points on the bay side walls. On the back walls there are more mounts that were raised to provide even more firepower. As we walked around the top of the outer walls there were terrific views in every direction. 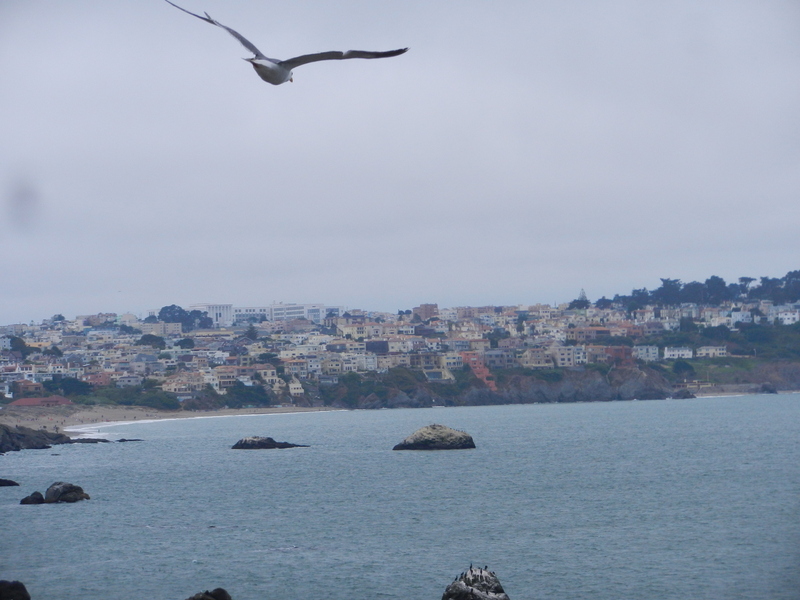 A seagull flew overhead just as I took this picture in the direction of Land’s End. 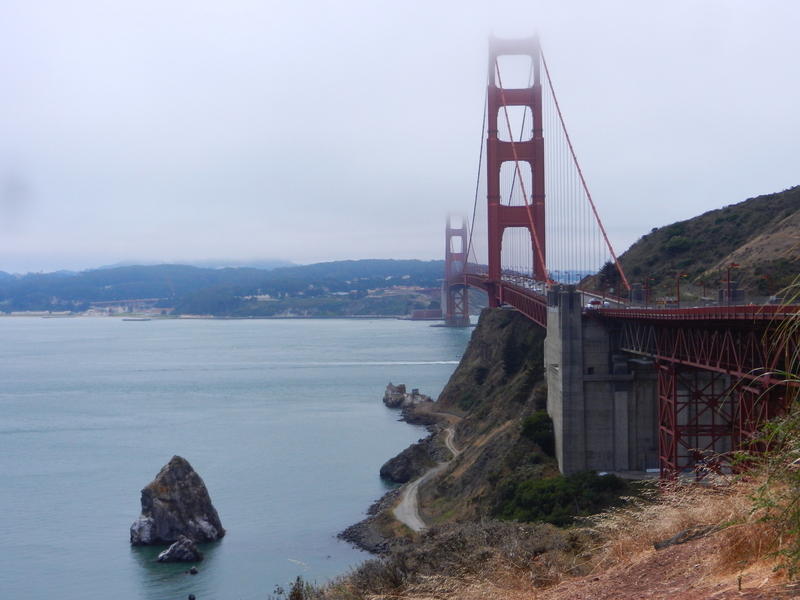 We also had a nice view under the bridge toward the Marin Headlands where we had gone the day before. It looked like the low clouds might be completely covering the highest parts of that area today. 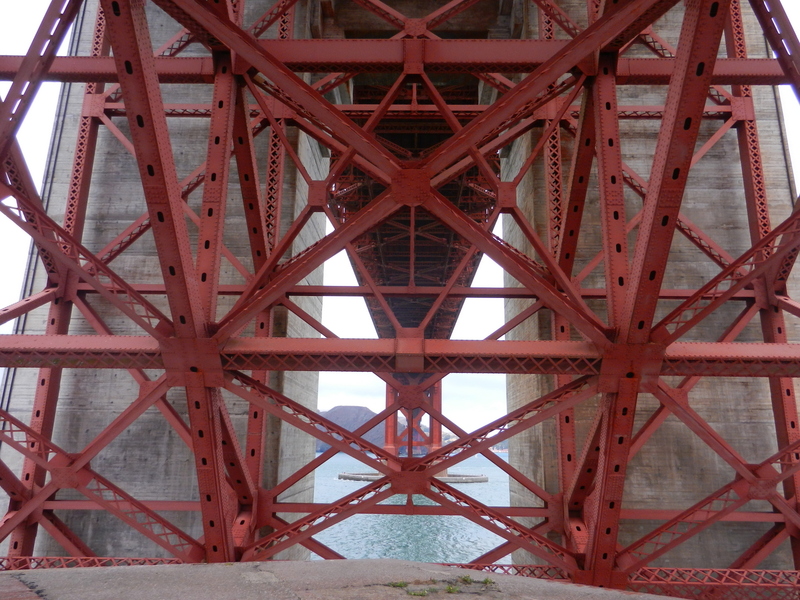 There was also a unique view of the bottom of the Golden Gate Bridge. I had Jenny get up on the most northeastern cannon mount to get the picture. 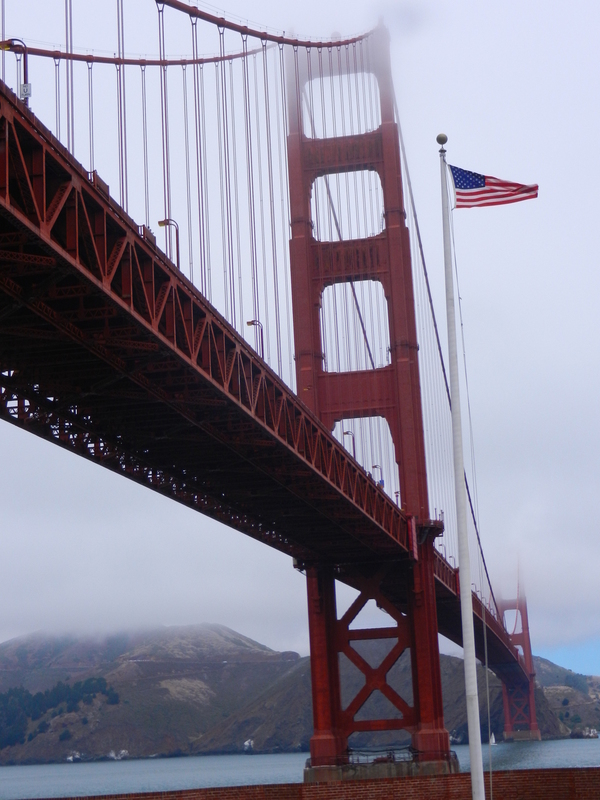 Even though I already had so many shots of the Golden Gate Bridge, I couldn’t help taking and apparently can’t help sharing this image of the flag over Fort Point with the bridge in the background! There was also a very nice view of the bay and city to the east. We headed back down the stairs to the second level and did a quick walk through of some of the rooms. I snapped this picture of the Hospital Stewards room/exhibit before we made our way out of the building. 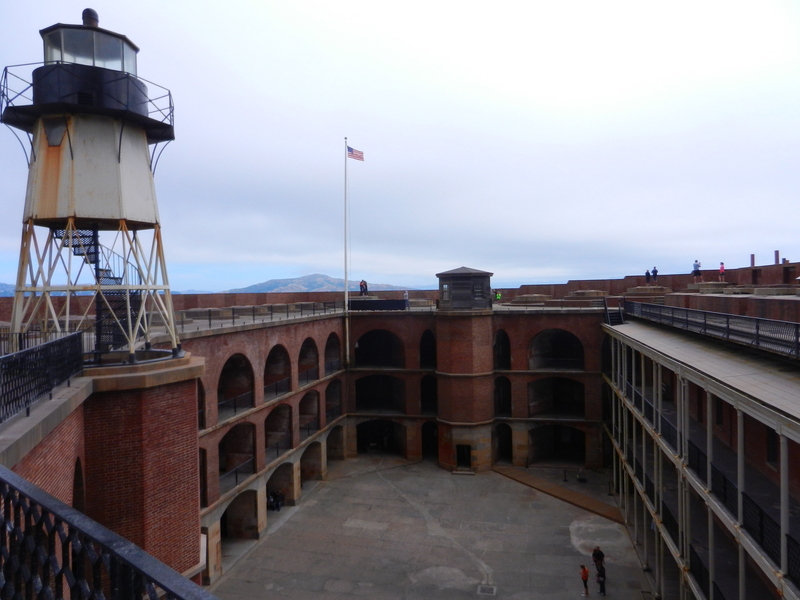 We will definitely return to Fort Point for the views and hope to spend more time there next time learning about the history of the fortress. For now we had a bike ride to do! It was short ride back to the longest uphill section of the ride. The hill up to Battery Park is steep, windy, and you share the road with cars. Near the top we stopped at a clearing for some more views of the bridge before riding across. 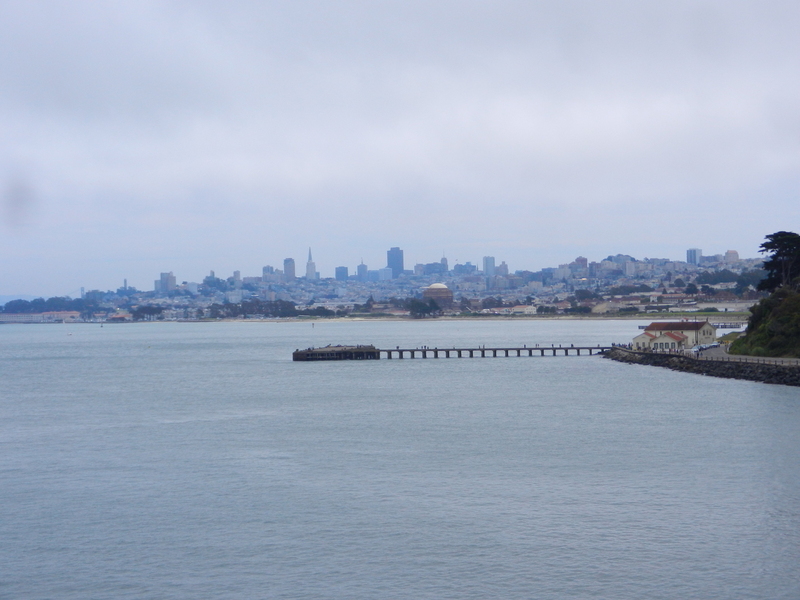 The weather was a bit cloudy, but we could see some sun hitting the other side of the bay. We walked around for quite a while in this area, but eventually headed up toward the visitor’s center. There were tons of people there, so we got off our bikes to walk, but made a beeline toward the gate to the bridge’s east sidewalk. 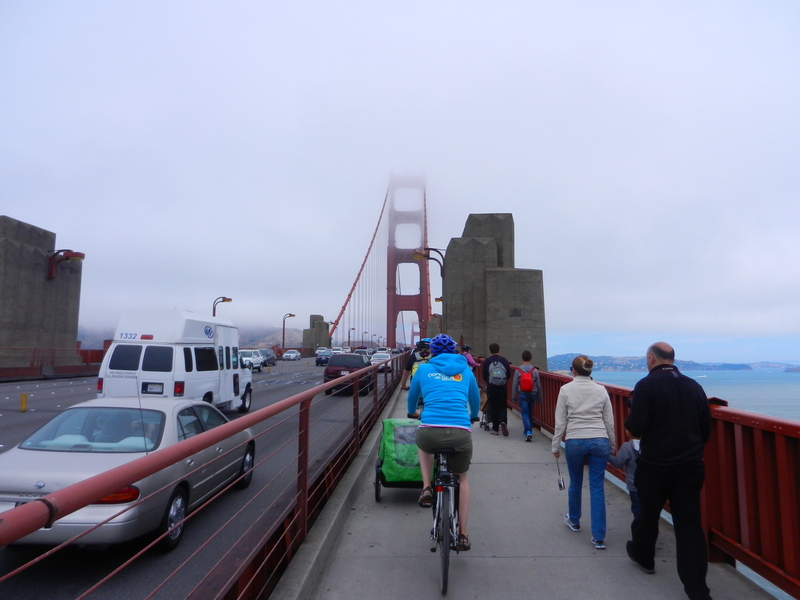 The day before, when we were heading back from the Marin Headlands, bikers had been on the west sidewalk. It would have been a lot less crowded, but the view would not have been what we were hoping for. For a schedule of which sidewalk is open for bikes and pedestrians see this link. Once we got through the gate, the sidewalk was crowded. There were north and southbound pedestrians, runners, and bikers all sharing a fairly narrow sidewalk. made the crowds seem less important. Most of the people were very polite and everyone seemed to be willing to share the road (sidewalk). 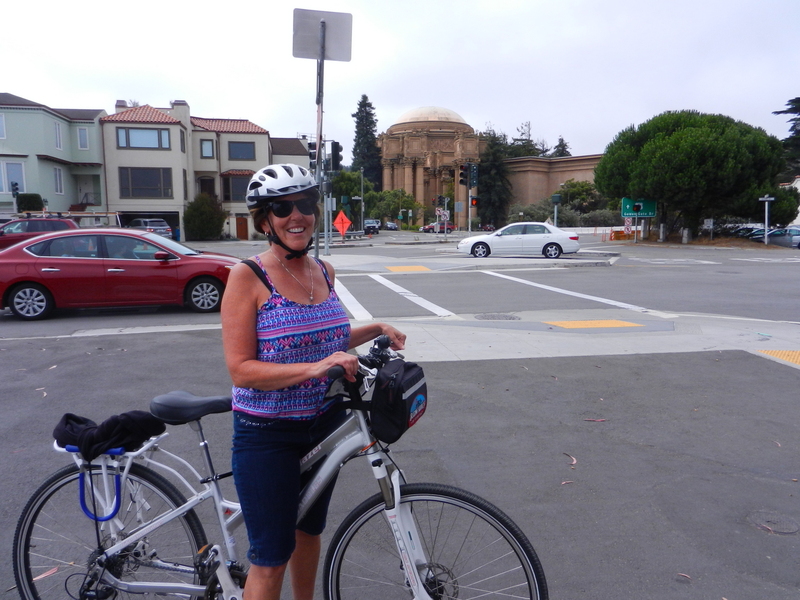 We had to get off our bikes as we approached the south tower because the sidewalk narrows and curves around the towers. There also seemed to be more people congregating here also. The center section of the bridge, between the towers, was much less crowded. 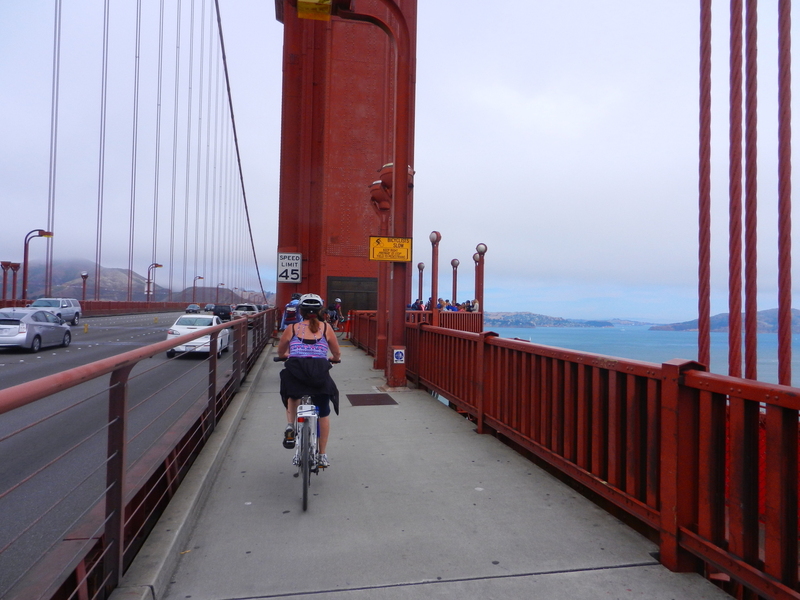 It was in this part of the ride that we actually got to experience “riding a bike” across the Golden Gate, not just dodging other people. It is obviously less crowded in this picture near the midpoint of the bridge. A little past the midpoint we decided to pull over to get pictures “on the bridge”. As I pulled over I finally met one rude guy. I looked over my shoulder before I moved to the right, but as I pulled over a guy behind me yelled, “Hey watch where you’re going.” I didn’t say anything as there was no collision even though he had flown by on my left at a pretty good clip. However, he wasn’t done. He managed to stop about 25 feet further along the bridge. He looked like he had just teleported in from the Tour de France. Expensive road bike and corporate sponsors on his shirt. Obviously he was in the middle of training for his next time trial. I guess I should have been thankful that he was able to take a few minutes out of his training to give me some pointer on watching where I’m going. I’m a pretty polite and calm person, but in this case I decided to exercise the “F*** you” technique. He would yell something about watching out for other people and I would simply yell back those two words. This went back and forth several times. He would lecture me on how to ride my bike and I would exercise the technique! Eventually the technique worked. He went back to training for time trials on a busy little sidewalk, and I got my picture “on the bridge”. The least busy part of the bridge was just before the north tower. Once we passed that tower (we had to walk around again), we started to have more pedestrian traffic from the other view area on the north side of the bridge. 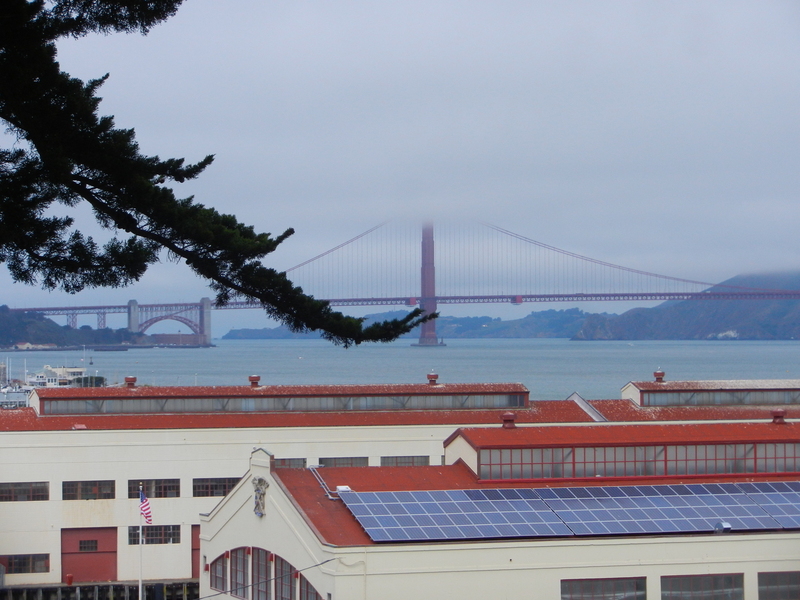 The view of the Golden Gate Bridge from the north is different, but no less impressive than the view from the south. 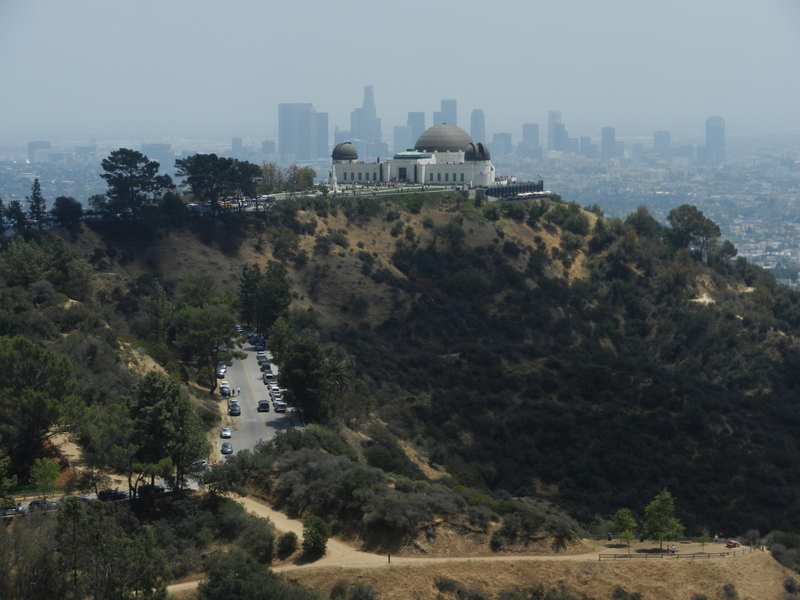 This viewpoint is a favorite for tourist buses and cars driving along the 101. The first time I stopped here was in the late 1980’s. I remember it vividly, not because of the view, but because my oldest daughter was a baby at the time (almost 2 years old), and we had a little scare with her shortly after we left this view and drove north a few miles. She had a low-grade fever that day, teething maybe, but it was only about 50 degrees that evening so we bundled her up to get out of the car. When we got back in the car we only planned to drive a few miles before stopping for dinner and it had gotten chilly even in the car, so we left her bundled up. We stopped and parked on the east side of the 101 and walked across a pedestrian walkway over the 101 to get to a Sizzler. I checked on Google maps and the walkway is still there, but the Sizzler has been replaced by another restaurant. We left Monica bundled up and I carried her over the bridge to the restaurant. I remember it being cold and windy outside. When we got in to the Sizzler I held her away from me so I could loosen her coat. She was completely limp and unconscious. I set her on the counter to check her out, and could not detect any breathing. As I started CPR, the lady at the counter asked if there were any medical people in the restaurant. After just a few seconds of doing CPR I felt my knees give a little. I was very scared, in fact I’m getting a little emotional writing about it more than 25 years later! Luckily there were two EMT’s who came over to help. They moved her to an open table, removed the coat and other warm clothing we had on her and continued the CPR. She started breathing and regained consciousness very quickly which was a huge relief. We thanked the EMT’s then went up the hill to a nearby hospital to have Monica checked out. The doctor was pretty sure it was a seizure caused by her fever being held in by all the warm clothing, but felt she would be fine and we should not have to worry about this happening again. About 6 months later we were contacted by the local Marin newspaper for pictures. The two people who helped us were getting a civic award and they wanted a picture of Monica for the paper. A lasting memory and a valuable lesson for young parents – be careful about bundling up a baby with even a low fever! 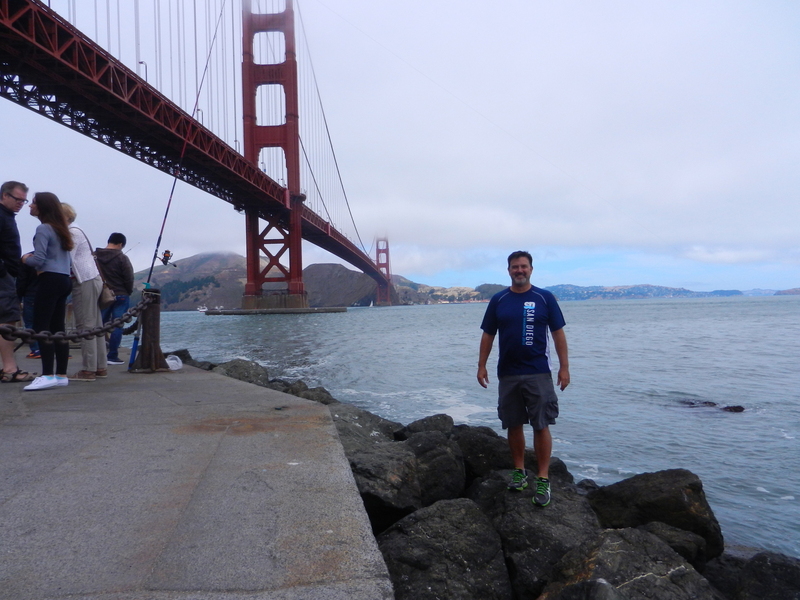 On this visit to the Golden Gate, thankfully we had no scares, just a relaxing bike ride to enjoy. 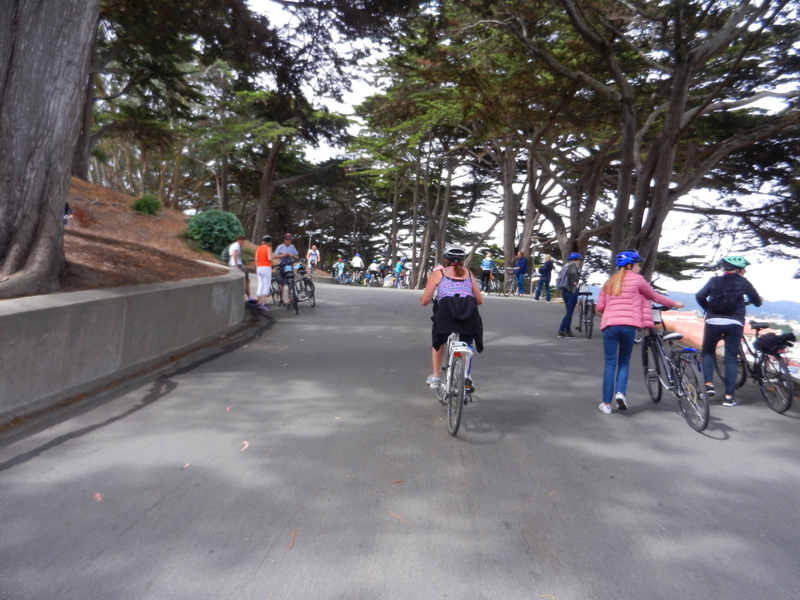 The hill to Sausalito is steep, curvy and is also shared with cars. Most of the way the road is wide enough to comfortably share the road, but it narrows just as you enter town, and so you have to really watch what you are doing on this stretch of the trip. 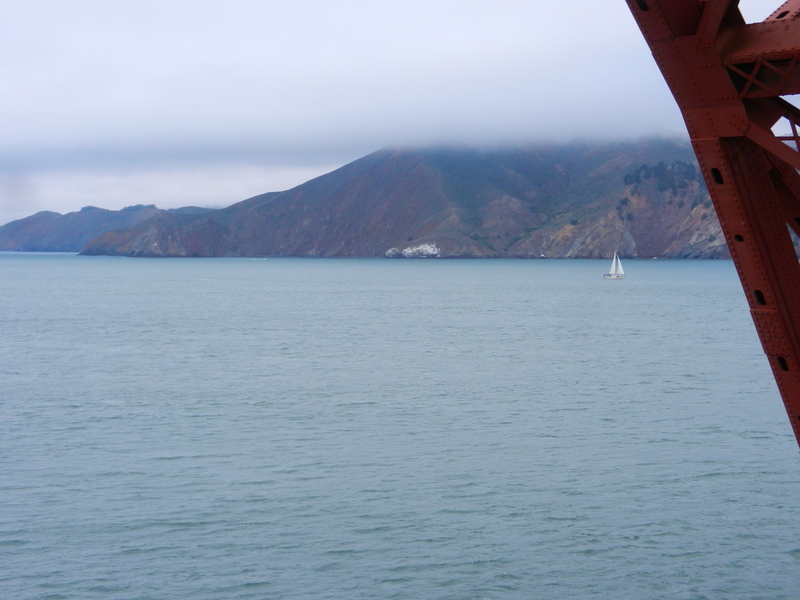 We have been to Sausalito once before, during our honeymoon in 2012. We expected this visit to be much different. That time we had driven to Sausalito fairly late – almost 10 PM, and the town had lived up to its reputation as a sleepy little town! We had trouble finding a place that was even open so we could eat. Riding into town in the middle of the day was completely different. It is a bustling tourist location during the day. People drive here, are delivered by the bus load, take the ferry, and apparently a lot of people ride their bikes here – based solely on the number of bikes in the bike rack we used. It reminded me of the bike racks I had seen in Copenhagen when I spent one day there a month earlier. The first thing we did was message Dave and Wendy to see how things were going. We wanted to see if they would be able to make it here for lunch. Unfortunately things were going slow for them. It was likely to be a few hours more. 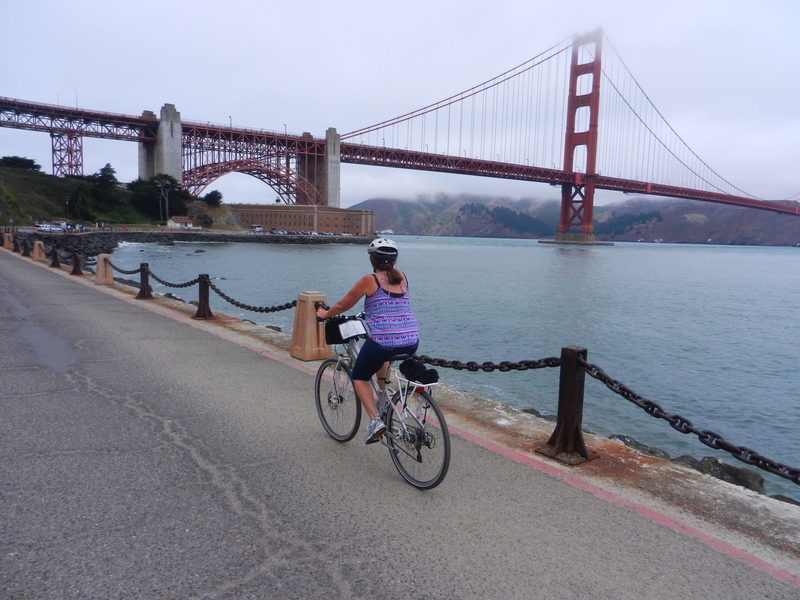 We decided that we should have lunch, check out some of the shops, and then continue our ride to Tiburon. When we returned to pick up our bikes there were already people lining up for the ferry back to San Francisco that would leave an hour later. These lines made continuing to Tiburon seem even more appealing. 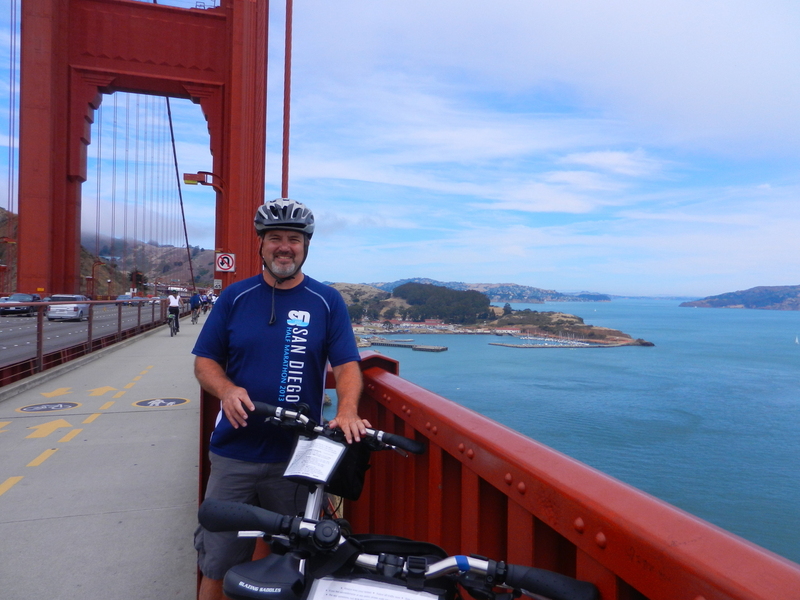 Since Biking to Sausalito and taking the ferry from there back to San Francisco is an option, I’ve decided to put the rest of our bike trip in a “Part 2” post. 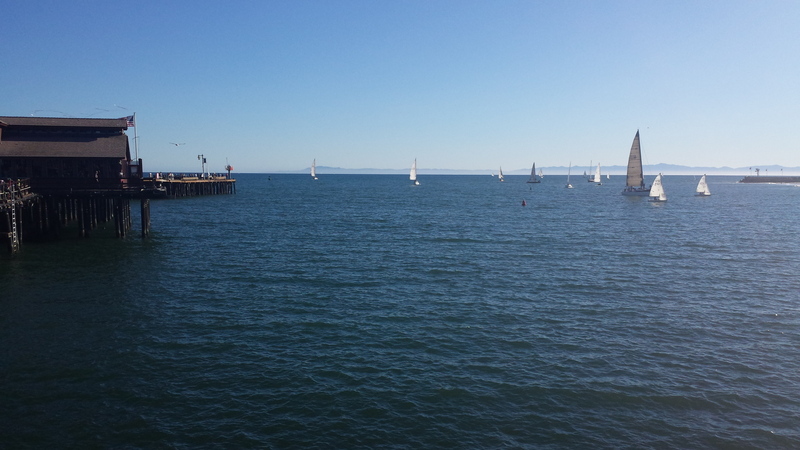 If we had never been to Sausalito, we might have decided to stay for dinner and then ride the last ferry home. On this day the crowds were more than we were looking for, and we had the urge to keep riding! That is one of the things I like most about touring an area on bikes, your plan can be fluid and you can go where your spirit moves you!